Well, it’s the end of another year, it’s true, the older one gets, the faster the years go by! The biggest thing that happened this past year that was my mother passed away back in August. While I miss her a great deal, what I don’t miss is watching her slowly whither away due to the effects of Alzheimer’s disease. The second biggest thing in my life in 2014 is that I got a new job, one that pays so much better than my last one that I’ll actually be able to have some money in my checking account again. When I do work, the days tend to be long, ten to twelve hours long, so I don’t have the time for my daily walks those days any longer, but that may change next spring when I will be able to bid on any open dedicated runs the company has. But, it isn’t just the money that has me loving this new job. One thing is the way that they treat their employees. One of the biggest complaints that I had about a previous employer, not the last one, but an earlier one, was that they made you work the holidays even when they couldn’t find any loads for the drivers to run. You couldn’t make any money just sitting around, but they wouldn’t let you go home either. It made no sense to me, I’d rather be home with the time off not making any money than sitting in a truck somewhere not making any money! So, things are much better on that front, I like looking at the balance in my checking account and seeing that’s there’s money left at the end of the month, rather than having to juggle bills to make it to the next pay check. Okay then, I have started using the Canon Digital Photo Professional software that came with my camera to edit photos that I shoot in RAW. It does do some editing, but it isn’t great, nor easy to use. To make things worse, my poor old computer is on its last legs. I’ve been getting the blue screen of death from time to time the last few months, and I’m still using Windows XP, since it makes little sense to upgrade on this old of a machine. So, you may remember that I’ve been looking at new computers, and have settled on an iMac. I thought that I had one all picked out, but things have changed. Earlier this week I looked at how much money was in my checking account to see how much progress I had made in savings towards the new computer so far. Then, checked the price of the model that I had picked to see how far I still had left to go. Woo hoo! Apple has dropped the prices of the iMacs, and by enough so that I’ll be able to purchase the next one up from the one that I had picked and for a little less than my original pick! Sometimes it pays to be broke and have to wait to make a purchase. 😉 The model that I’m looking at now will have 16 GB of RAM, plus a NVIDIA GeForce GT 750M 1GB GDDR5 video card with one GB of Ram. I’ve been also watching tutorials on using Lightroom in what little spare time that I have, so once I make the purchase, I’ll have an idea of how to use it. It looks easier to use than the software that came with my camera, but time will tell. I thought about purchasing Lightroom now, so I could begin to learn it, but looking at the system requirements, it may not even run on my current computer, so I’ll have to wait. 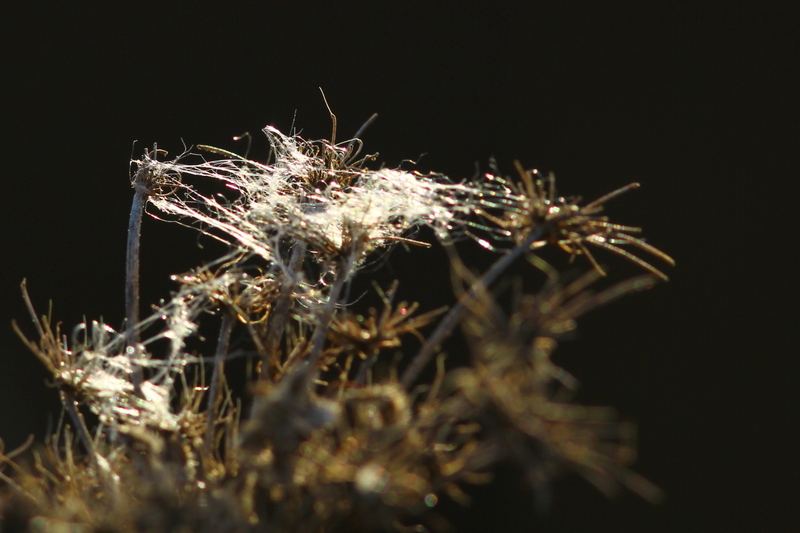 I may find that I’m a lot happier with my Canon 60D cameras once I begin tweaking the images from them in Lightroom. From watching the tutorials online, I can see that I could overcome some of the weaknesses of the 60D with a few tweaks here and there. However, one thing still sticks out in my mind from the short time that I played with a 7D Mk II at the camera store, how well all my lenses performed at all distances on that body compared to how they perform on the 60D. I’m sure that my images will be better once I tweak them in Lightroom, but Lightroom can’t overcome poor auto-focusing, and can only reduce noise, and not restore the resolution I lose at higher ISO settings with the 60D. So, the 7D is still on my wish list, but I’m in no big hurry to rush out and make that purchase yet. Can you believe it? 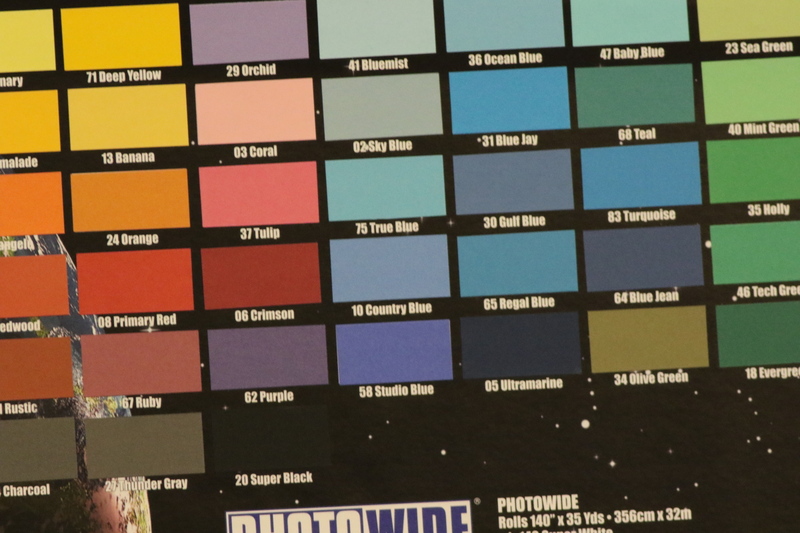 I’m actually excited to begin doing some post processing of my images, more so than buying a new camera body. That probably sounds silly to most of the readers who already post-process, but a year ago, I considered it to be a way of making up for not getting the camera settings correct to begin with. How little I knew! I do tend to forget how much my images have improved, as I’m always trying to make them the best that they can be. Now on a typical day, I usually end up changing nearly every setting that I can access through the “Q” button at some point if you include both bodies. A far cry from when I switched over from my old Nikon, where I was afraid to make any adjustments, to the new Canon gear I currently use. I’ve learned that no matter what, one is still limited by the camera sensor’s ability to record the image that a lens passes on to it. Until some one develops a sensor that can match what the human eye can see, I’ve come to the conclusion that post processing is a requirement for improving my images. 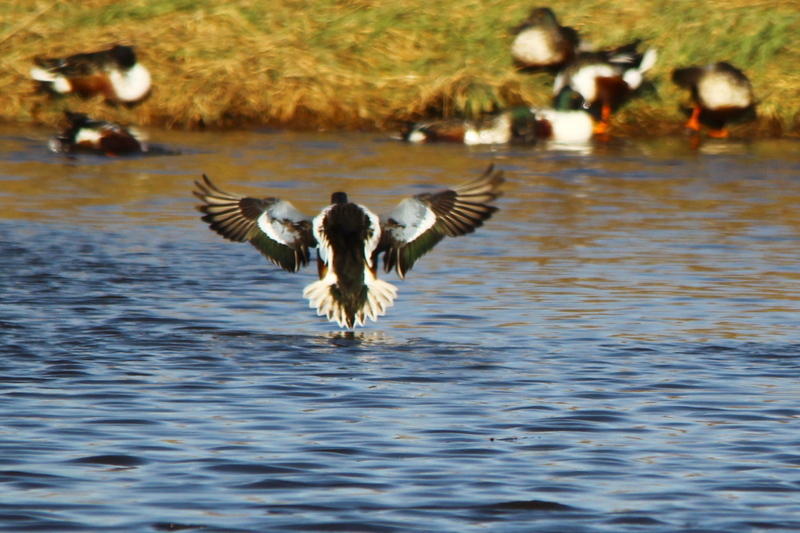 So, here’s what could be my best shot of the month from around home, one that I did nothing to. That brings up something else. Last year at about this time I had just purchased my first quality tripod to use, rather than going for a cheap model that was worse than hand holding my camera. I swore that I would use the tripod much more often, whenever it was called for. While I did use the tripod much more this past year, I still haven’t learned to carry it with me all the time as I should. Of course, I can’t use it if I don’t have it with me. I’ll see something that I wished that I had the tripod to use, so I’ll carry it for a few days, and never use it, then go back to leaving it home. The carrying bag that I bought for the tripod is great for traveling, the case is well padded, but it doesn’t do well as a carrying bag while hiking. Also, I bought a heavier duty tripod head, one strong enough to support the Beast (Sigma 150-500 mm lens), but I almost never mount the Beast to the tripod. The heavy-duty head weighs almost as much as the legs do, and when in the carrying bag, it and the head weigh far more than the legs. 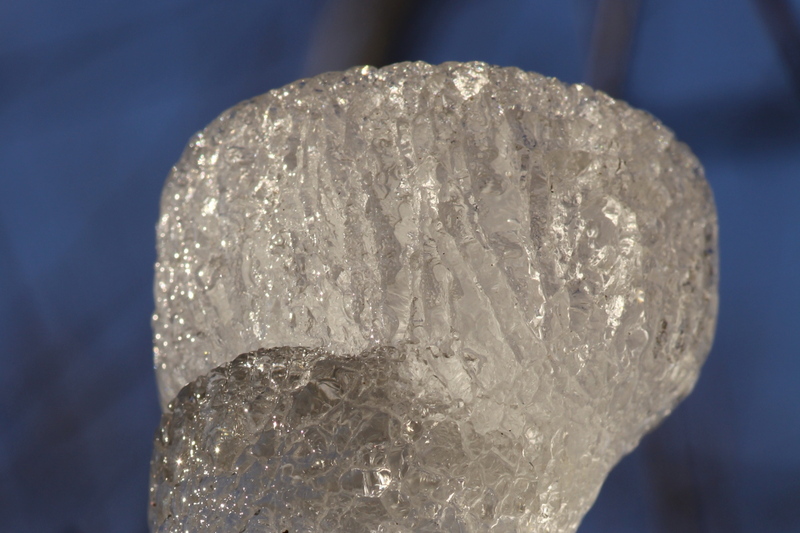 I may have to purchase a light-weight ball head that will work for macros and landscapes so that I’ll be more prone to carrying the tripod with me daily, as with the ice crystal above, I never can tell when I need it. Anyway, after the month of November, when we set records for the amount of snow for the month and one or two record low temperatures, December was slightly milder than average. We were in the running to set the record for the least amount of snow for the month until a lake effect squall this morning dropped enough snow to put that record out of reach. 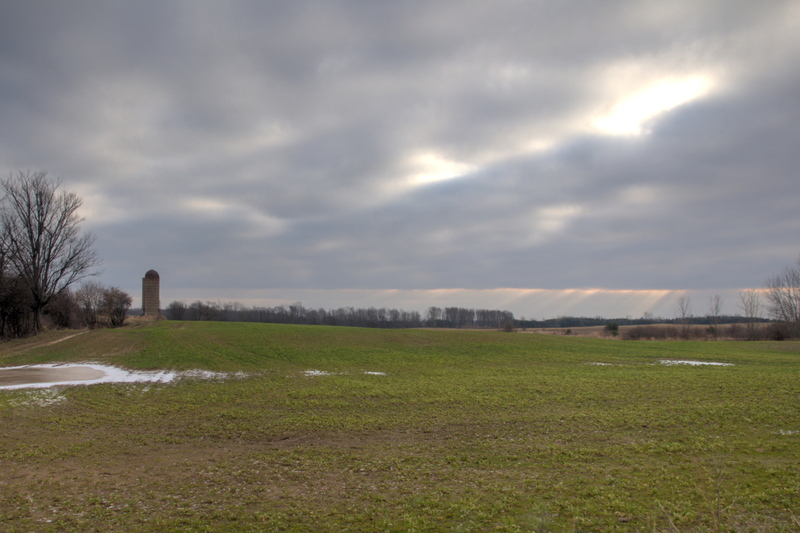 The stats say that it was a drier than average December, but you wouldn’t have guessed that if you lived here. It looked like this outside for almost an entire week. I chose to play with that image in Photomatix to produce this HDR image seen in an earlier post. Photomatix has a button labeled “Double Tone Map” and I thought to myself, “Gee, I wonder what that does?” I promise you, I will never, ever click that button again! A huge mistake if there ever was one! While it was damp most of the month, there was very little rain and almost no snow, which is how we ended with below average precipitation for the month. Besides the week of fog, there were many days that looked like this. Or, if I was lucky, the morning looked like this. 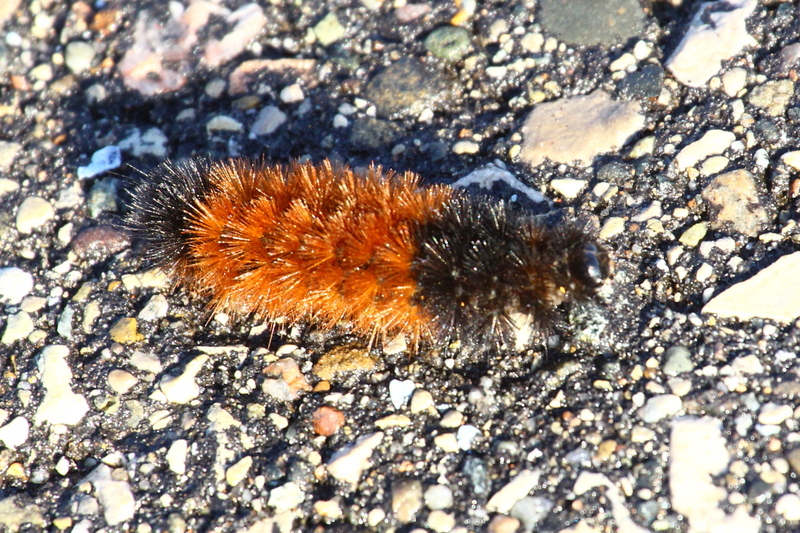 However, it was warm enough on a few days to see a few of these. …due to the very high ISO settings that I was forced to use because it was so dreary most of the month. 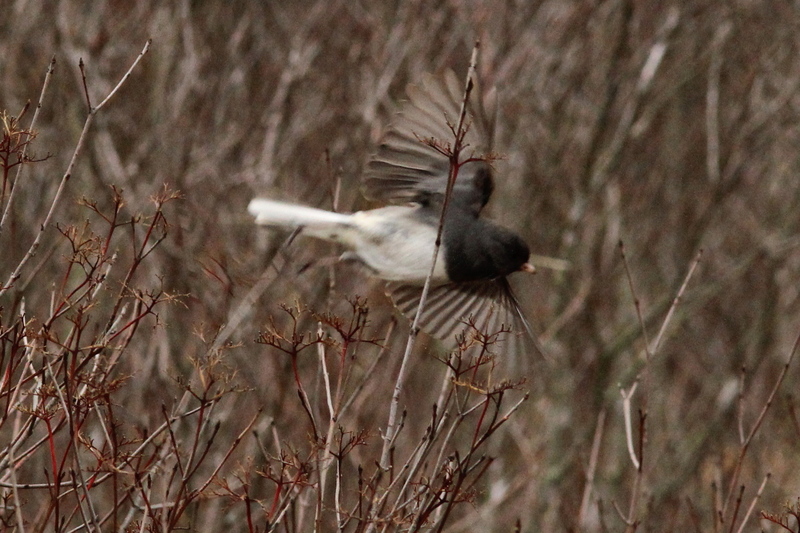 Still, that didn’t stop me from trying to catch the junco in flight. I could have used a lot more light for this guy! As quick as he was, I’m surprised any of my photos turned out. We did have some sun, and I tried to make the most of the short time when there was some sun. In some bad news, they have begun clearing another small woodlot that I walk past on my way to the park when I do my daily walk. 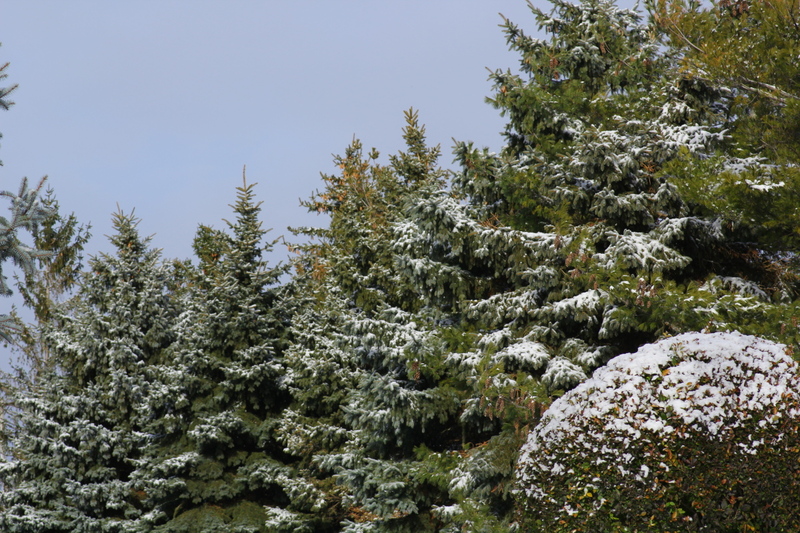 I was afraid that was going to happen when the property changed hands late this past summer. 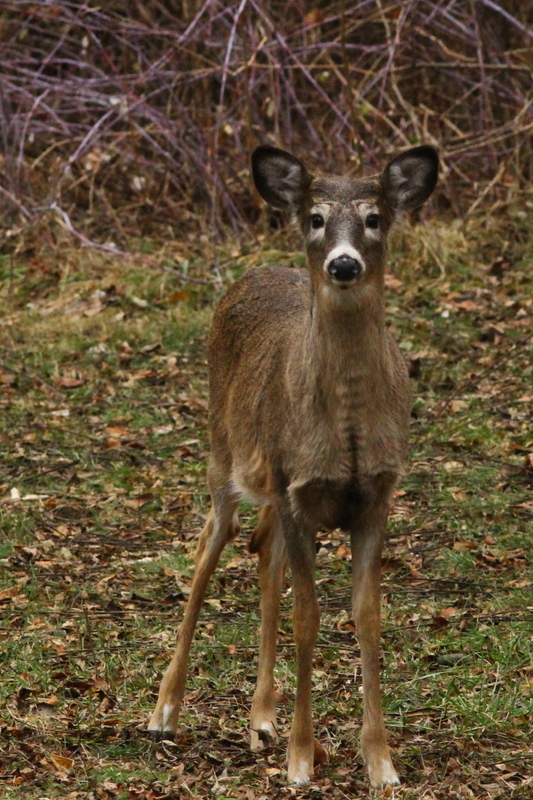 That woodlot is where I get many of my turkey and deer photos, like this fawn. 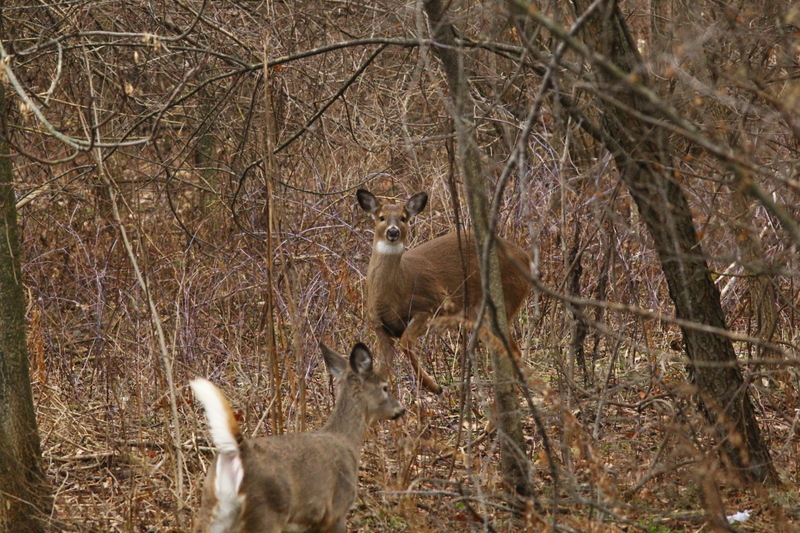 …to join her mother, who was stomping her foot to warn the fawn that humans are not to be trusted. 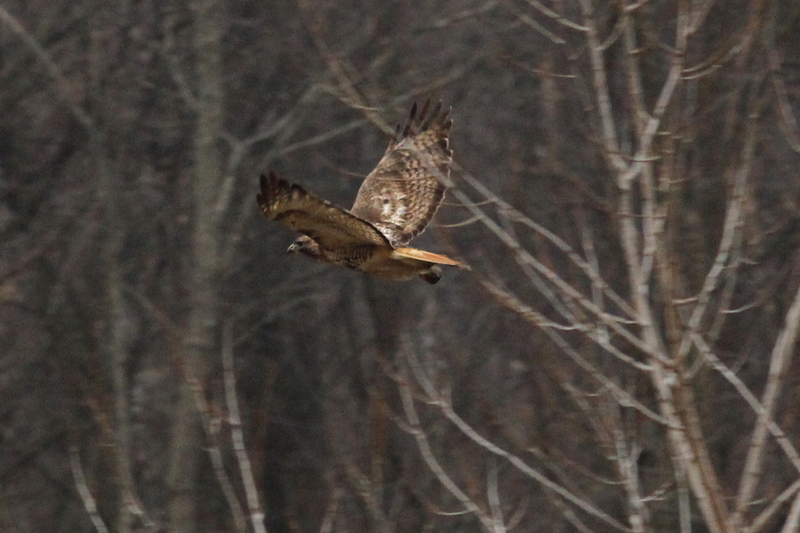 As gloomy as the weather was, I was very surprised to get these images of a red-tailed hawk in flight. And, I was very pleasantly surprised that these photos came out as well as they did. At the time, I had little hope that I would save these, as the lighting was some of the worst that I’ve dealt with lately. 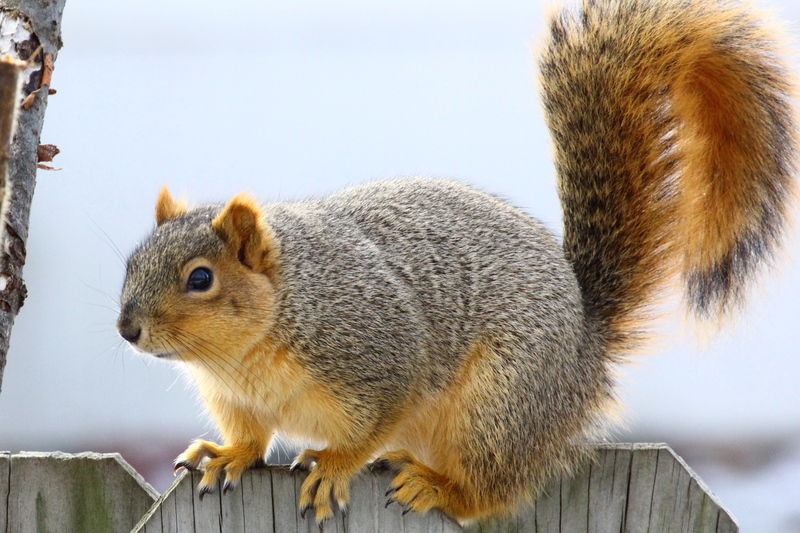 The squirrels have been busy packing on the pounds to tide them over the winter. 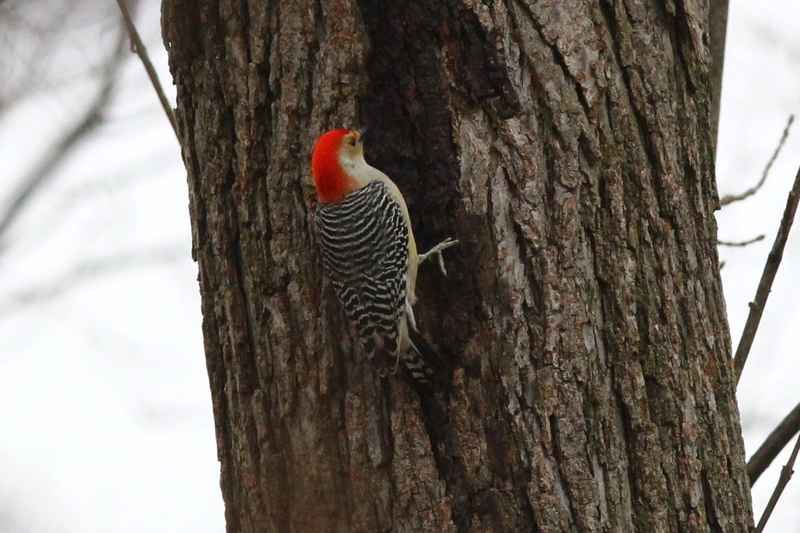 On one day, I noticed that a red-bellied woodpecker seemed to be drinking the sap or sap and water combination on the side of a tree. 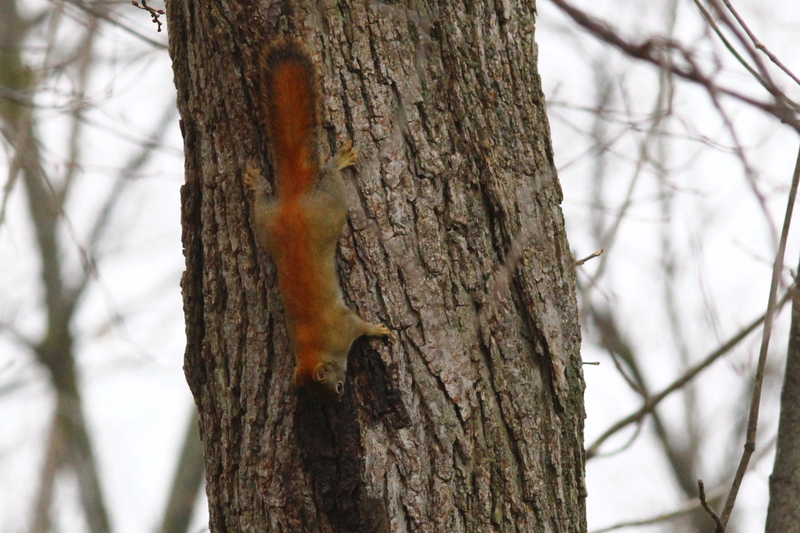 A red squirrel chased the woodpecker off so that it could lap up some of what ever was on the tree. 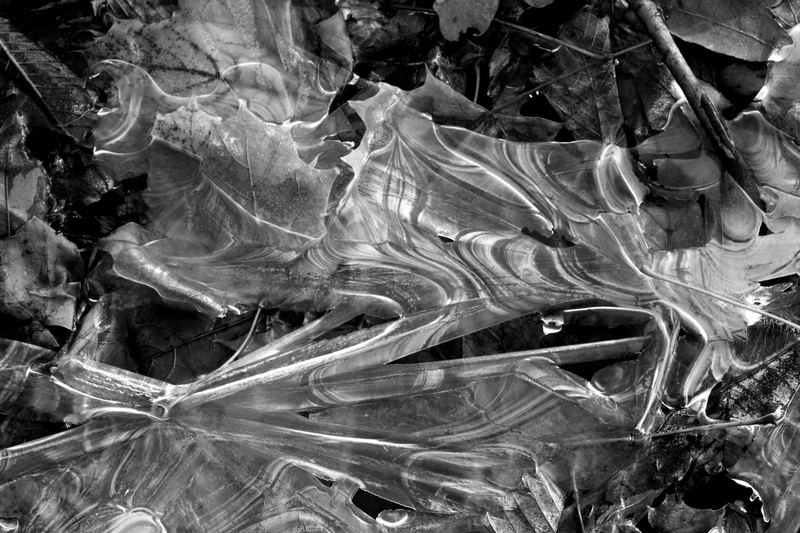 Every once in a while I get in an artistic mood and try converting a photo to black and white. I’m not sure which version I like better. I know which version of this shot I like best. I think that I’ll wrap this post up with an ode to the color brown, which like Rodney Dangerfield, don’t get no respect. Wait a minute, it’s a holiday, I can’t end on brown, I need something more colorful to ring in the New Year….what could that be? 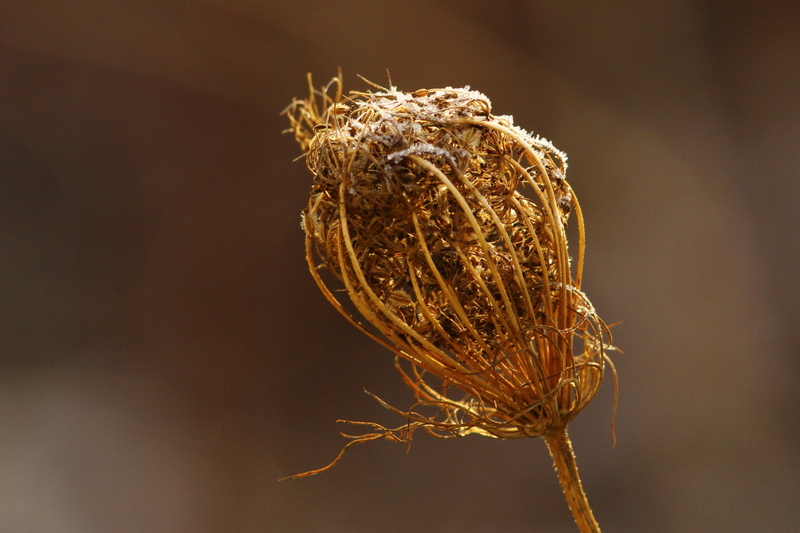 …I know, the last flower of 2014! All in all, 2014 was a good year for me despite my mom’s death, I hope that 2015 is just as kind to me. Happy New Years to every one! Sorry for another post from Muskegon so soon again, since I have plenty of photos from around home to share. However, a few things happened this past weekend that I want to post about while the day is still fresh in my memory. 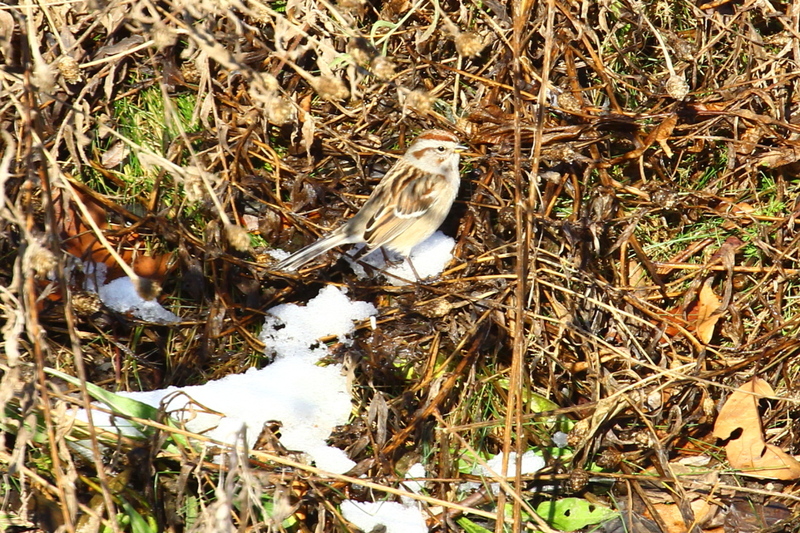 To begin with, it was a rather slow day as far as birds to photograph. It hasn’t been very cold here compared to our average temperatures or even the way that November was. 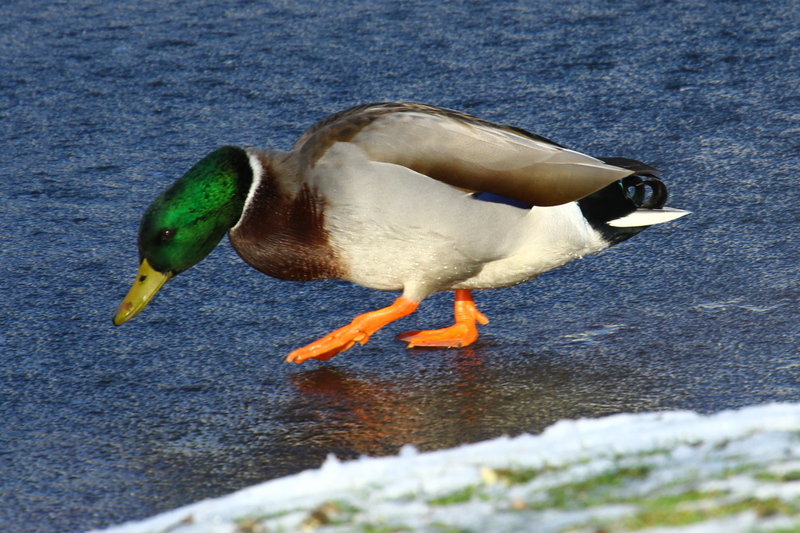 But, most of the water at the Muskegon wastewater treatment facility has frozen over, meaning most of the ducks and geese, other than a few mallards, have left for down south. 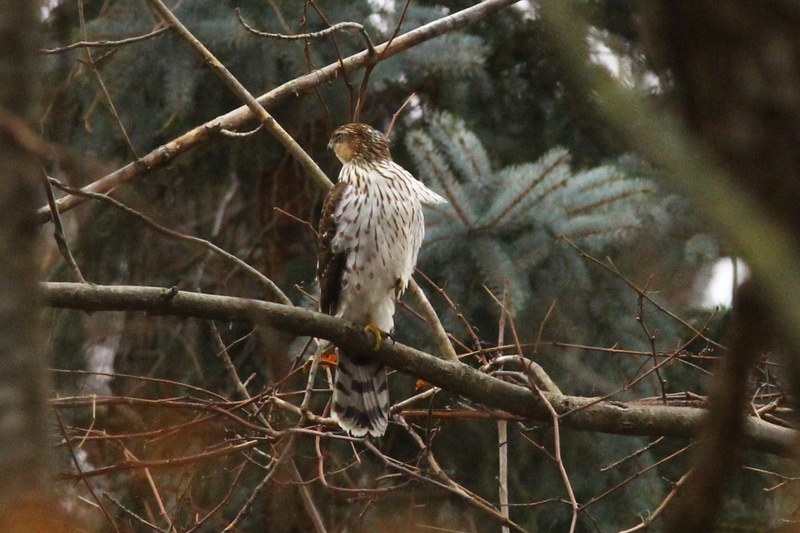 With the waterfowl gone, most of the raptors have moved on as well. 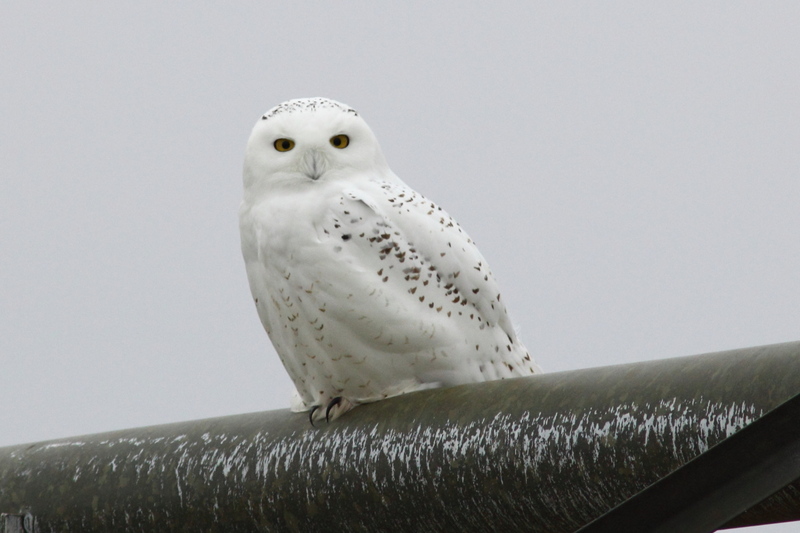 I did see a few bald eagles and hawks, there’ll be photos later, but really, the only subjects that I saw worth photographing were the snowy owls. That image was shot about half-way through my day, before I started cheating, which I’ll get to later. 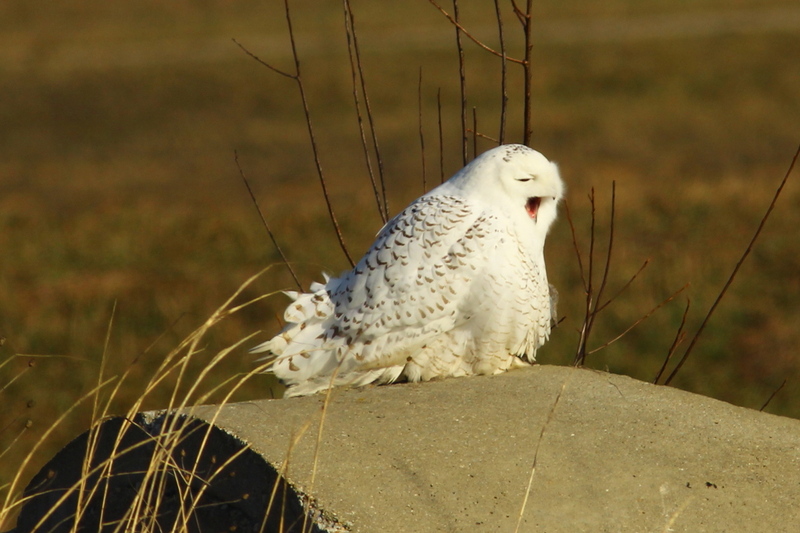 I learned a great many things this day, about snowy owls, photography, editing photos, what other people will do for a great photo, and what I’ll do for a good photo, but I’ll get to those things as I go. The day began cold, cloudy, hazy, with a strong enough wind to make it feel much colder than it was, which was about the freezing point for most of the day. 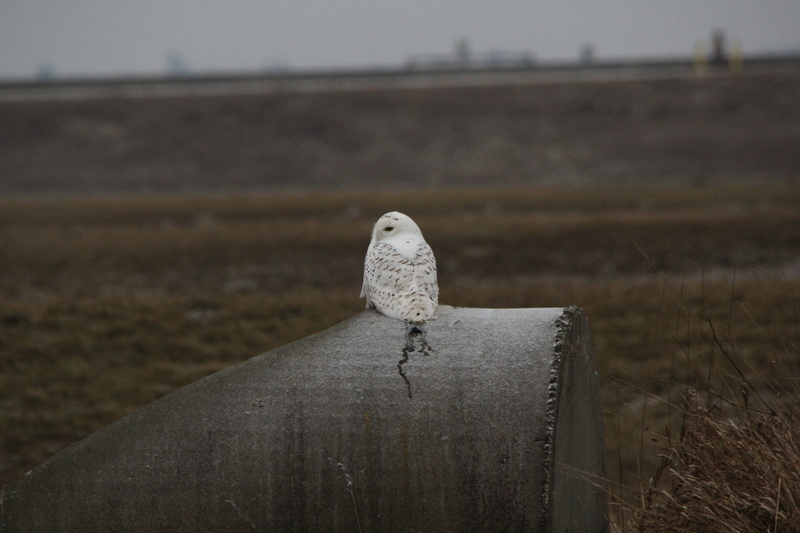 I didn’t even make it all the way past the entrance drive to the wastewater facility before I spotted the first of five snowy owls for the day. 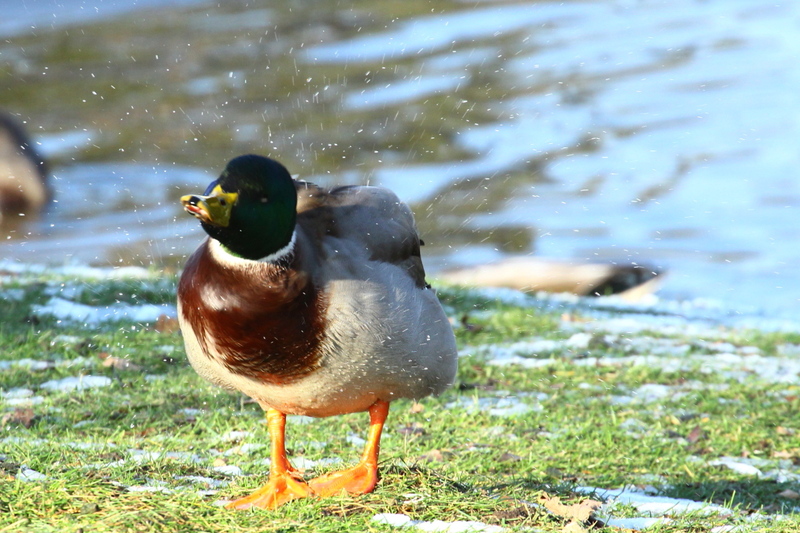 I started out using the Beast (Sigma 150-500 mm lens) by itself for this photo. 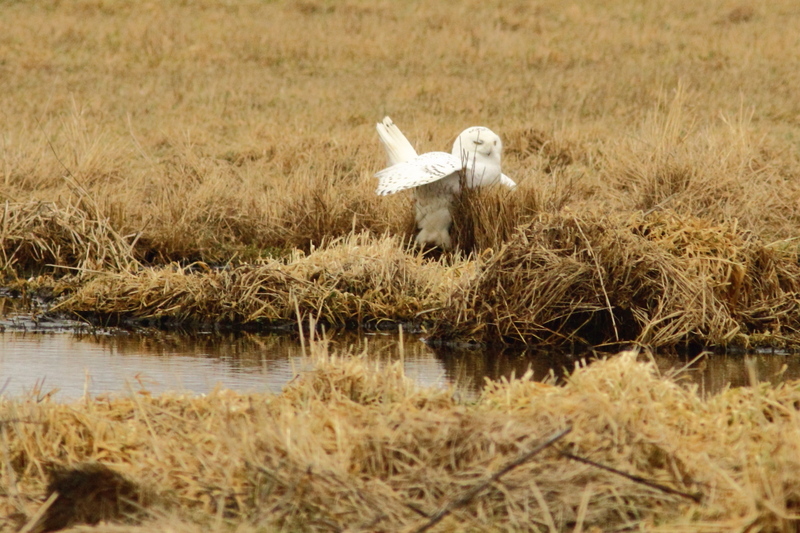 I wasn’t that impressed by the position of the owl or the conditions, so it was playtime. I added the 1.4 X tele-converter to the Beast, meaning that I had to manually focus for this one. Not too shabby given the poor light at the time. I set-up my second camera body with the 300 mm prime lens, the 1.4 X extender, and for shooting action photos, primarily birds in flight. 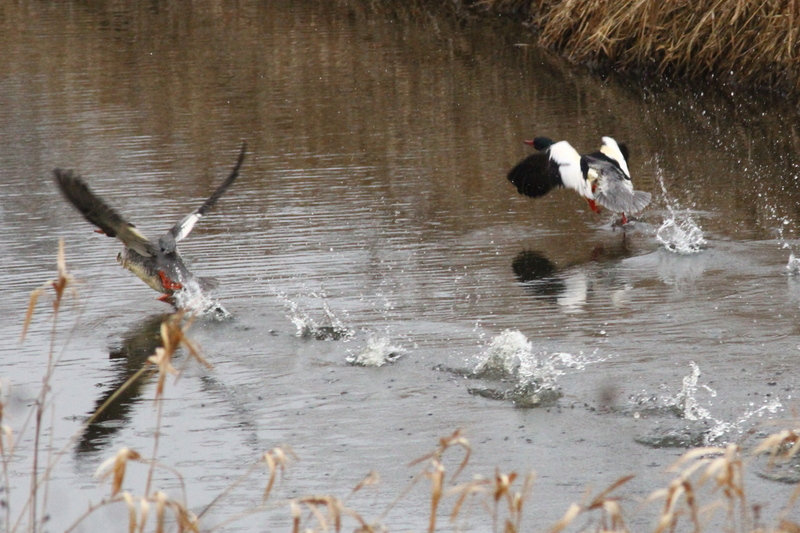 I tested all the camera and lens settings out on a pair of common mergansers that I spooked by accident. 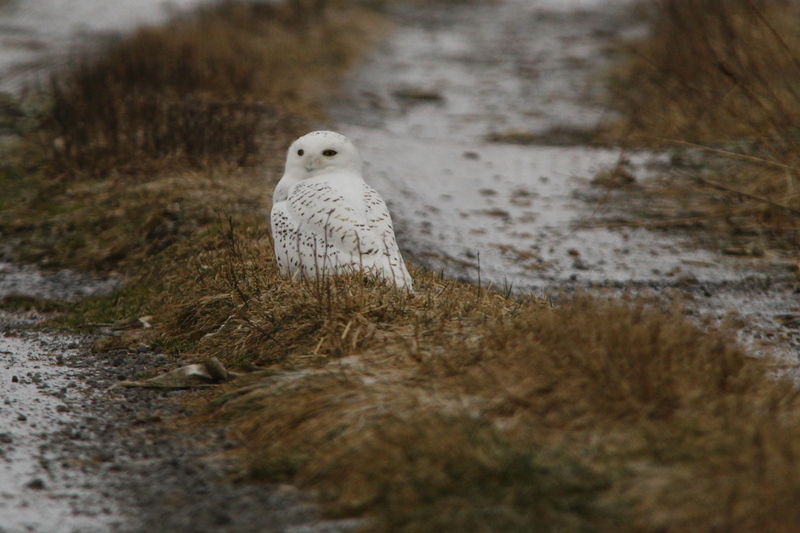 A little farther along the road, I spotted my second snowy owl of the day, but it wasn’t in the mood to have its photo taken. 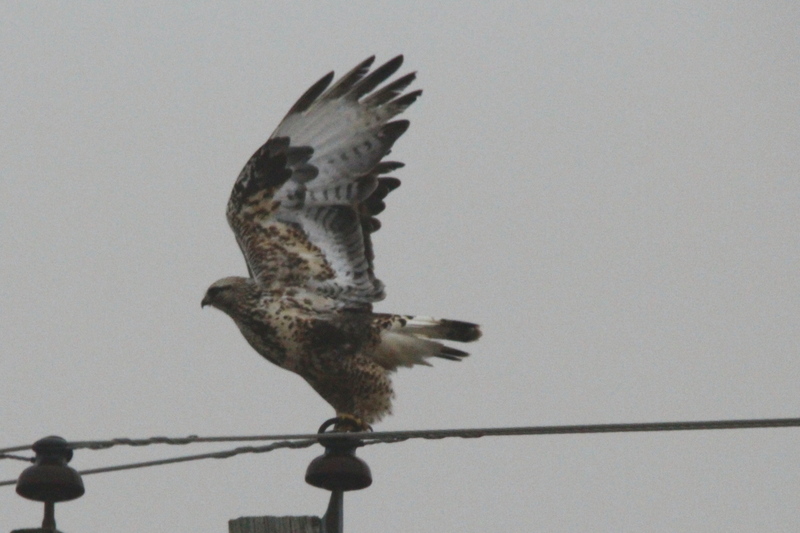 I tried out my action set-up again on a rough-legged hawk, first, as it landed…. …switched to the Beast while it was perched…. 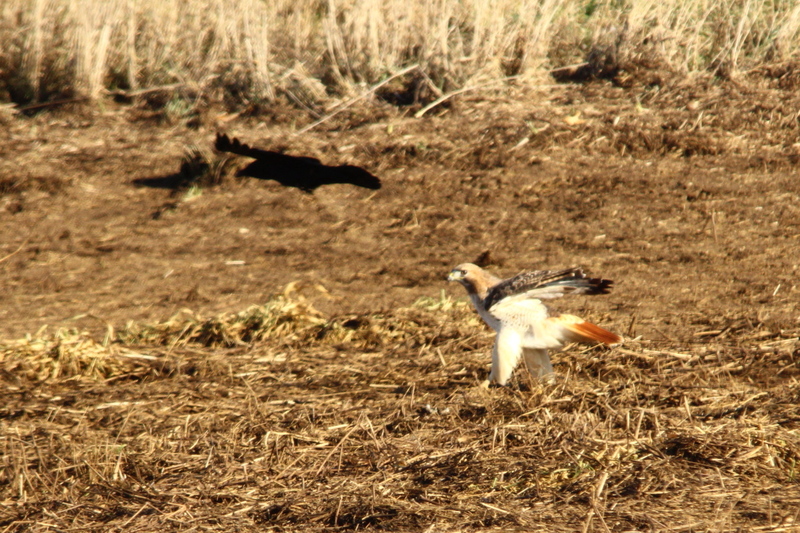 …and managed to grab the action set-up as the hawk took flight. Some light sure would have helped those, or any of my early action photo attempts. 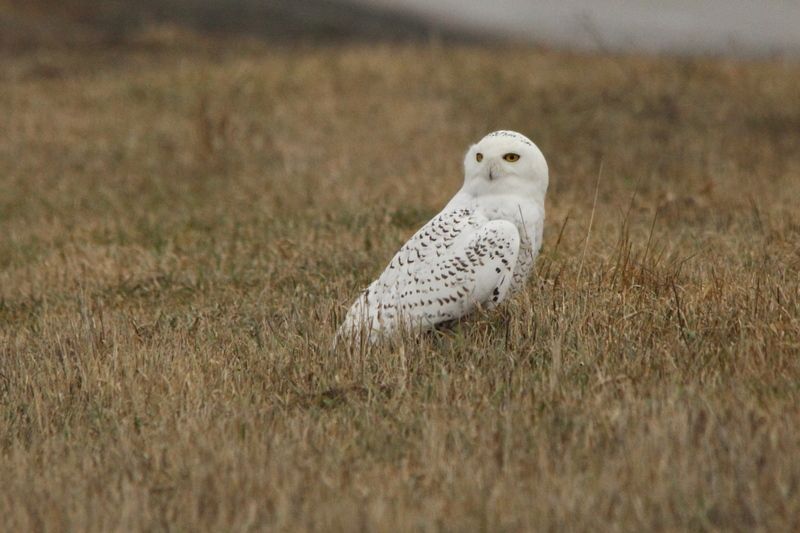 Not far from there, I found my third snowy owl of the day, this one was willing to pose for a few photos. And, here’s the cropped version of the image above. …you only get parts of the bird in the image. 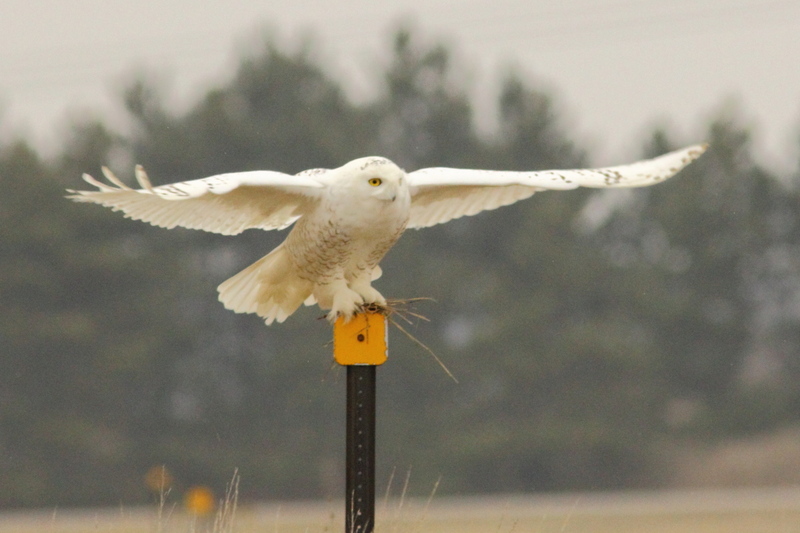 …I learned that snowy owls like my Subaru Forester. 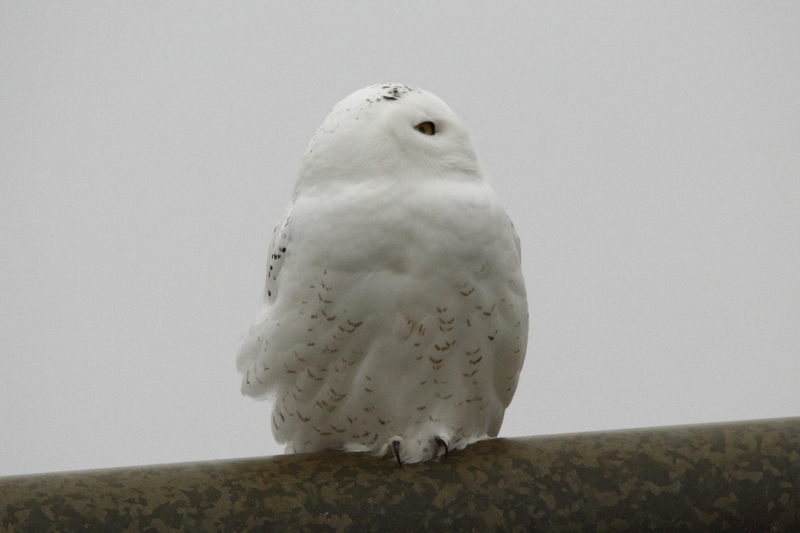 I had to shoot a few more photos of the owl as I walked back to my car. 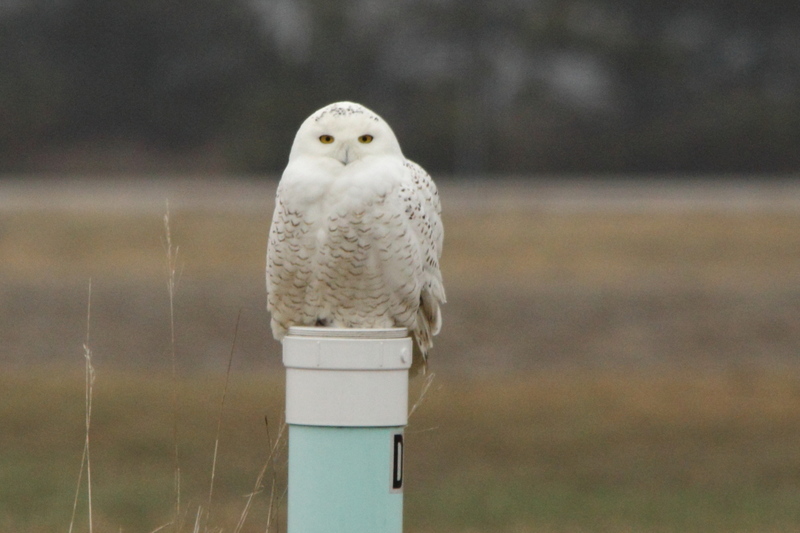 From there, I hit all the typical birding hotspots around the wastewater facility proper, and the surrounding areas within the Muskegon State Game Area, which are considered part of the wastewater facility as they are under the control of Muskegon County, even though it is state land. 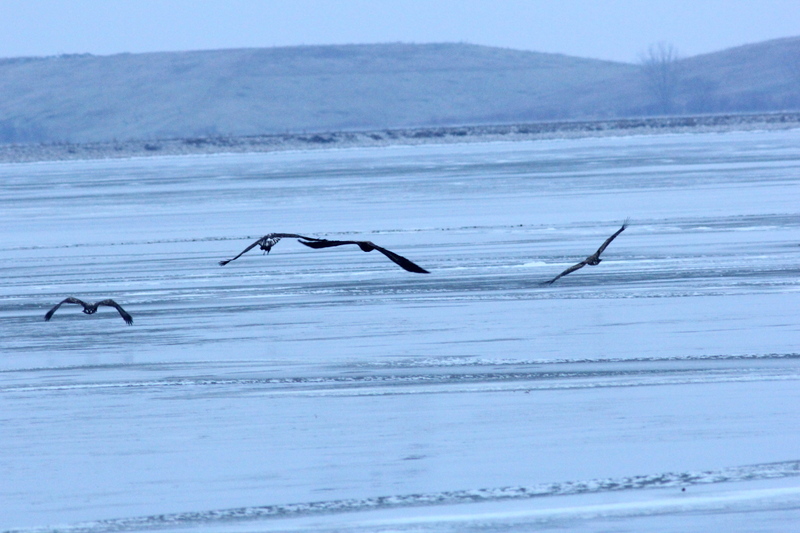 I saw a pair of bald eagles on the ice of one of the lagoons, but well out of camera range. 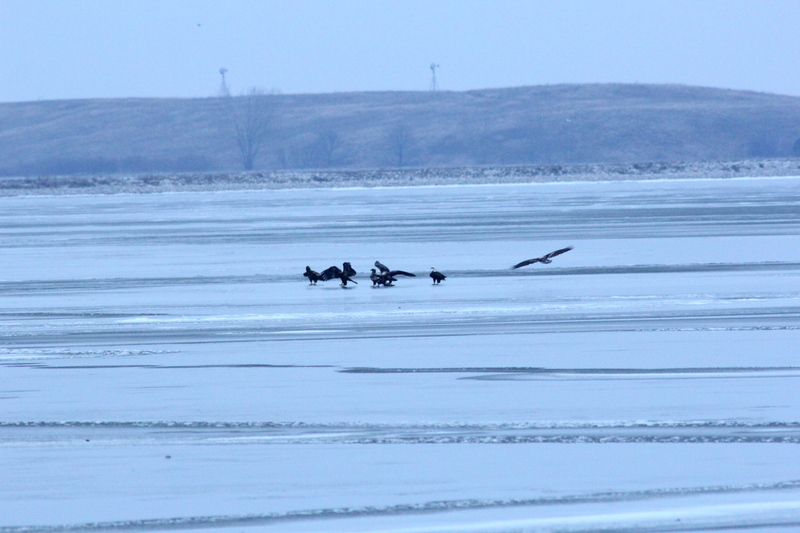 There were dozens of crows and hundreds of gulls, but little else to see. 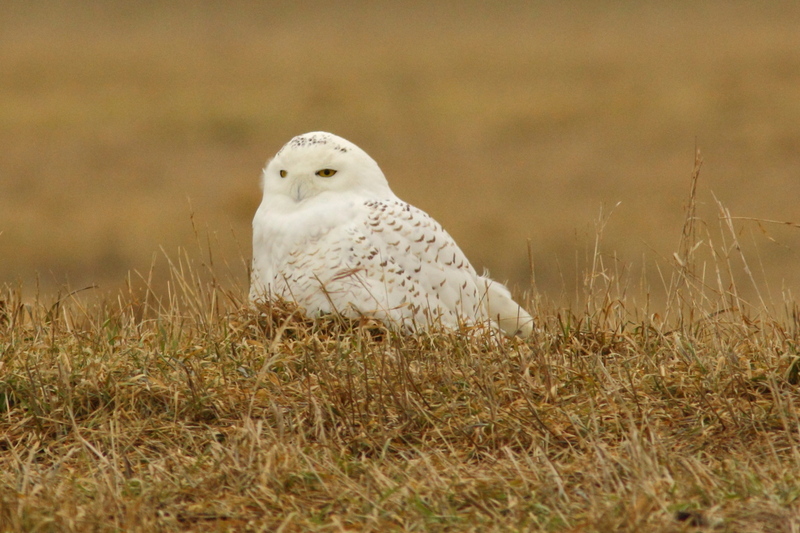 It may have been the slowest day of birding that I’ve ever had there. 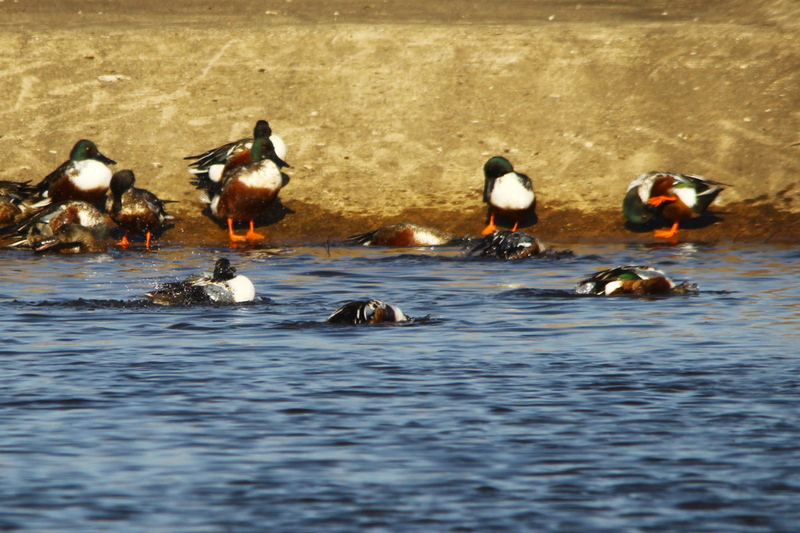 I had planned to also go to the Muskegon Lake channel to look for late season migrating waterfowl, but looking towards that direction, I could see that the clouds were even thicker there, and very few waterfowl have shown up there according to eBird reports. Instead, I drove back to the man-made hill that overlooks the grassy cells to hang out for a while and see if anything showed up. I’ve had good luck doing that in the past, and hoped that it worked again. 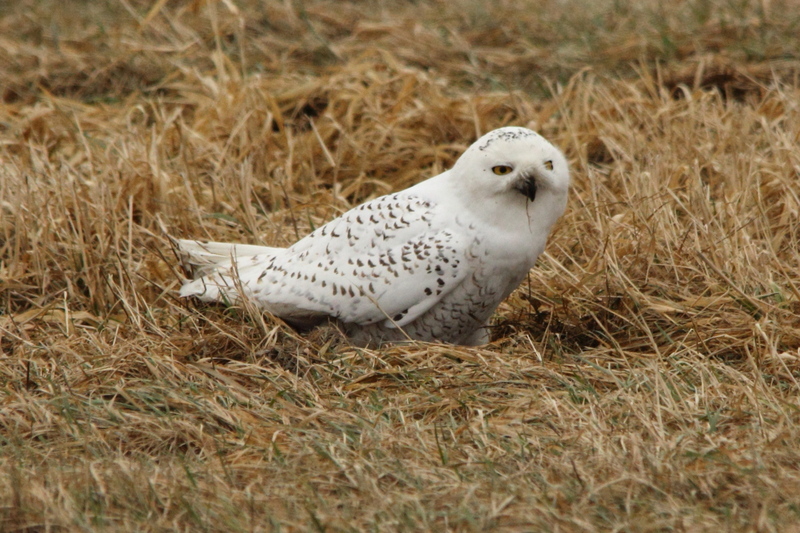 I could see the first owl from when I arrived in the morning was still there in the grassy cells, and as I waited, I noticed that the owl hunted in a pattern of sorts. …in a location where it could look down into two of the cells at a time. 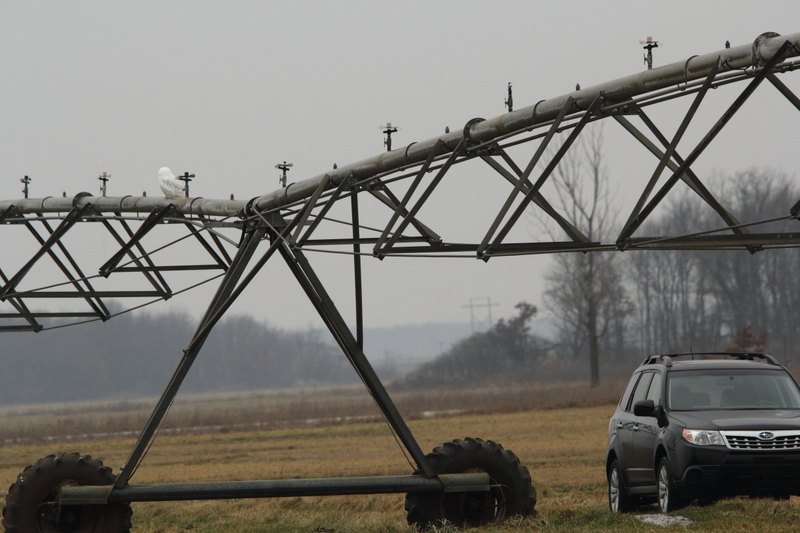 It would stay in each location for 15 to 30 minutes, and if it didn’t see anything, …. …it would zig-zag across one cell to a spot where it could see down into the next two cells. Watching the owl working its way across the grassy cells one pair at a time, I wondered if I could get in position ahead of the owl without it changing its pattern. The answer is obvious now, from the photos above, it was working well enough. 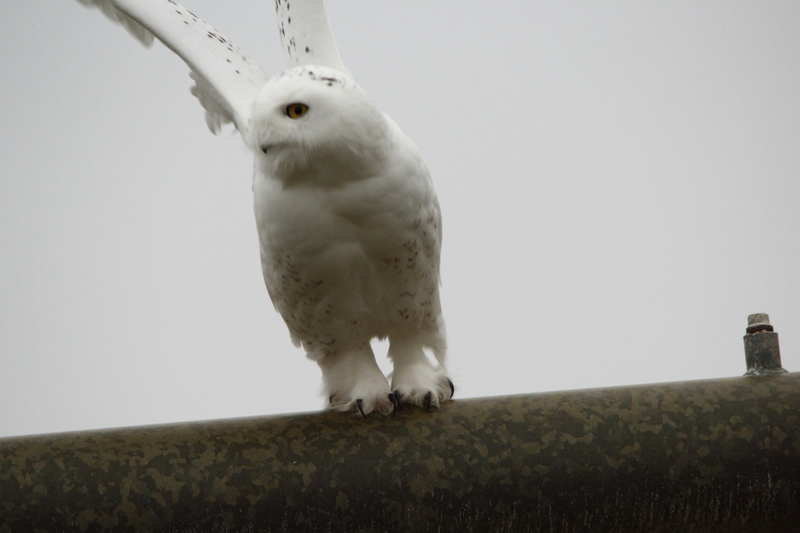 In the photo above, you can see some of the pipes and other objects that the owl was using as perches in the background. 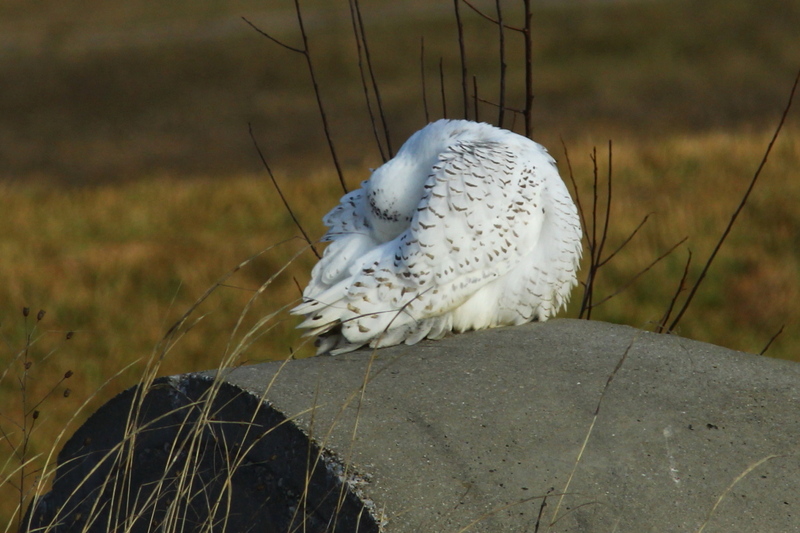 So, once the owl had moved, I would move to a point as close as I dared to get to the next place that I thought that the owl would land the next time that it moved. 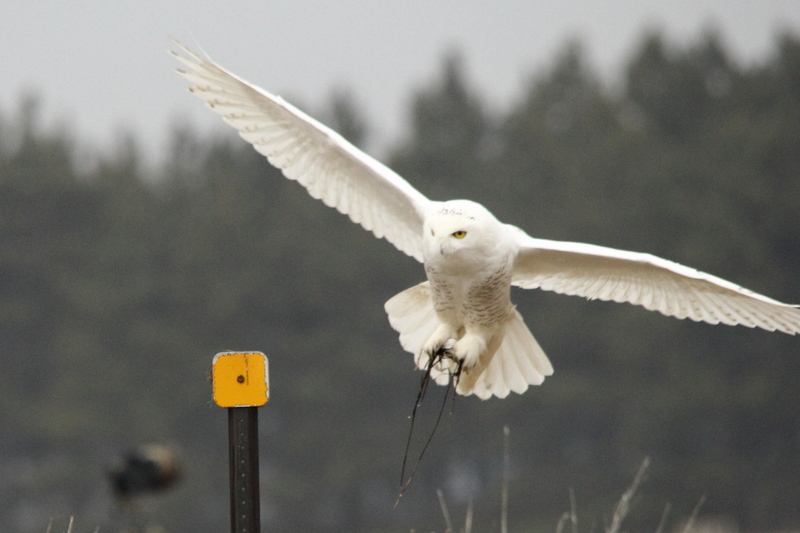 Apparently, snowy owls hunt in a pattern that one can use to get into a better position to get good photos, one of many things I learned this day. 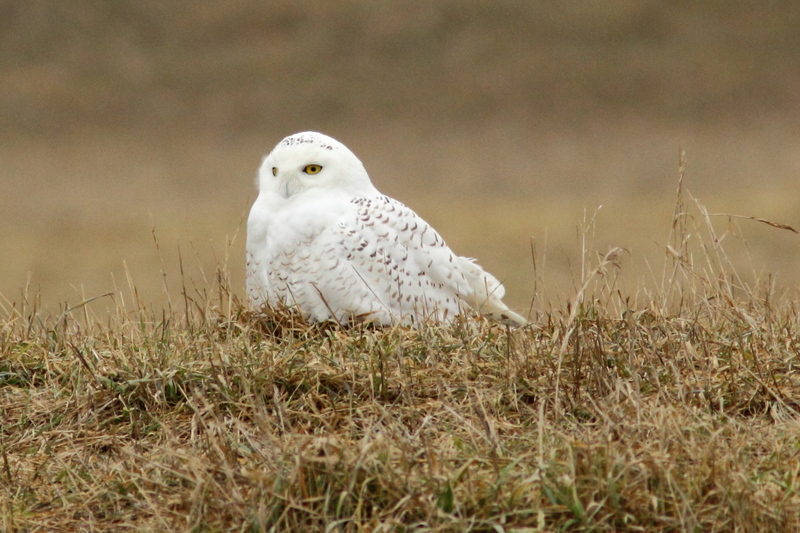 The next thing that I learned is that snowy owls, at least the one I was watching, have a low success rate while they are hunting. 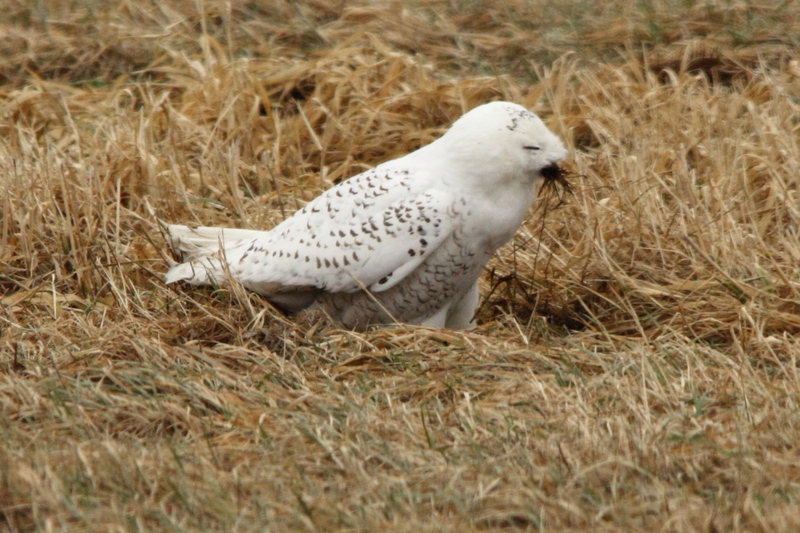 …the owl kept digging for whatever it had missed, for so long that I switched over to shoot video for this. 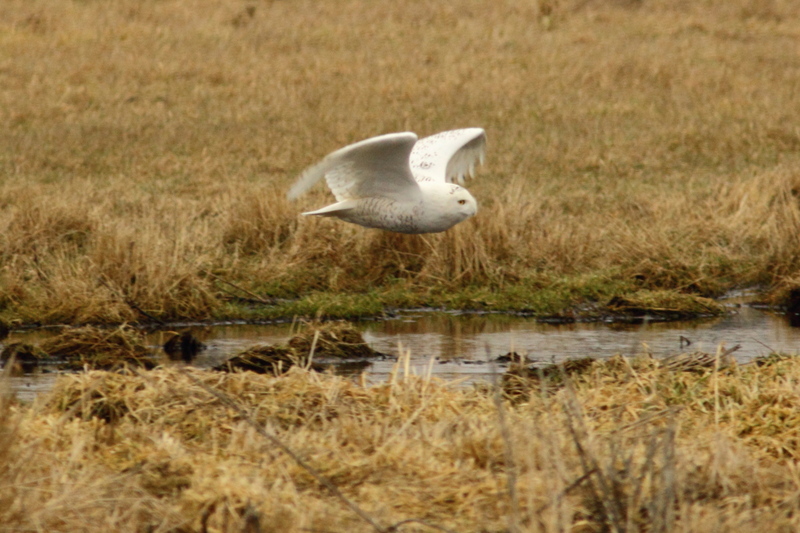 If I’d have been smart, I would have kept the camera rolling, for the owl took off a few seconds later, which would have been great, until I lost the focus since I have to focus manually to shoot video. 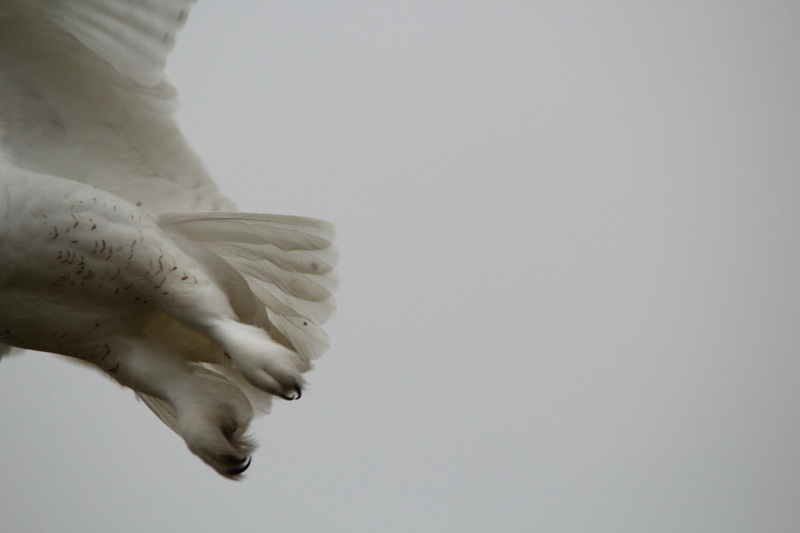 But, I had another piece to the puzzle that I was putting together to get good action shots of the owl. 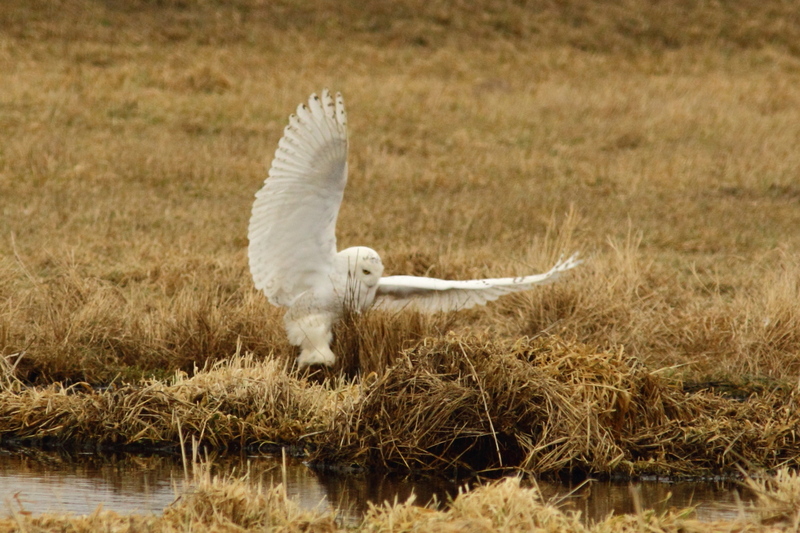 It wasn’t long before the owl took off and tried for another rodent. I was shooting in high-speed burst mode, and had already learned that shooting in RAW filled the buffer of the 60D much quicker than shooting jpeg. So, I would shoot a burst when the owl was at its closest to me, then stop. Bad move, because I missed the owl pouncing. That was a split second after the owl had hit the ground. Once again, it had missed whatever it had been after. …until it remembered that it was a bird and could just fly out. I was quite pleased with the way that my plan was working, I was getting fair shots of the owl both as it was flying, and as it was perched. …but if I changed the white balance of my camera from cloudy to shade, then the owl and especially the background came out orange. So once I was home, I played with the editing features of the Canon software that came with the camera for this one, and I got the white balance as close as I could come. In some ways I prefer the warmer colors of the “orange” owl, but this next one is as close to neutral, and real life, as I could get. This was my first real attempt at any type of editing other than cropping, and I found out that using the Canon software is very tedious, but worth the effort at times to change an image from just a so-so one into something better. Who would have thought that I’d be tweaking the white balance or exposure of my images as I have done with some of the rest of the photos from the day? It’s becoming clearer to me all the time that no matter how one sets up a camera, there are limitations to how well the images will look as they come out of the camera. It was late summer when I lamented that I couldn’t adjust the exposure compensation in one-quarter of a stop increments, as one-third of a stop sometimes seemed to be too much at times. Software adjustments allow me to make those small exposure adjustments that can’t be done by the camera. Or, to fine tune the white balance when the weather on a particular day doesn’t match up exactly with the camera settings available to use. Maybe it’s because my skills as a photographer are improving that I’ve come to realize the limitations of what a digital camera can record as matched against what my eye sees as I press the shutter release. A year ago, I would have said that the editing that I’ve done to some of the following photos was cheating, now, I see it as overcoming the limitations of my gear, allowing me to capture what I saw. 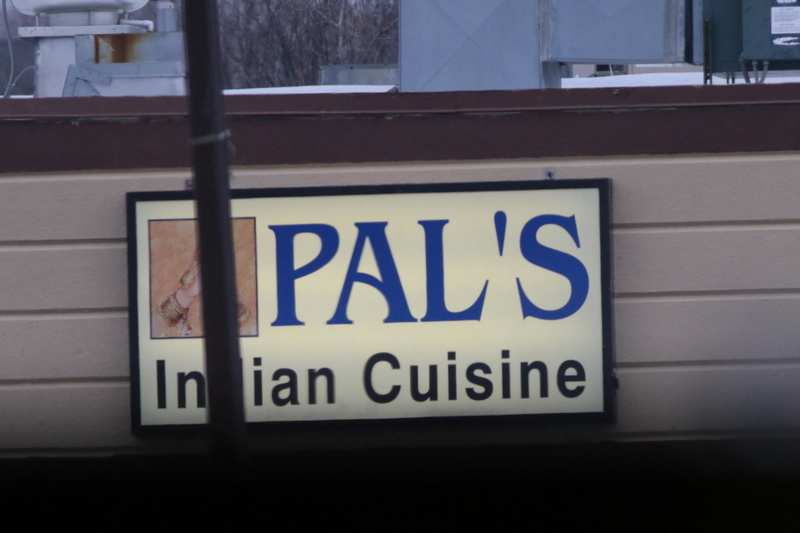 But, there’s almost cheating by editing photos, and then there’s real cheating. …but overall, I thought that things were going well. All that was about to change. 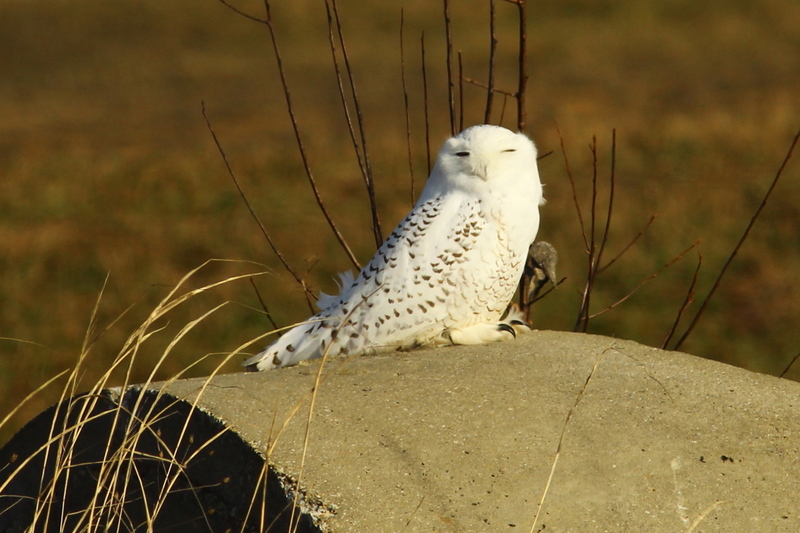 Some of you may remember the first time that I posted about the snowy owls, and the guy with the BIG LENS that was a real jerk. I was afraid that I would be seeing a rerun of that episode, but in some ways, this day was worse. 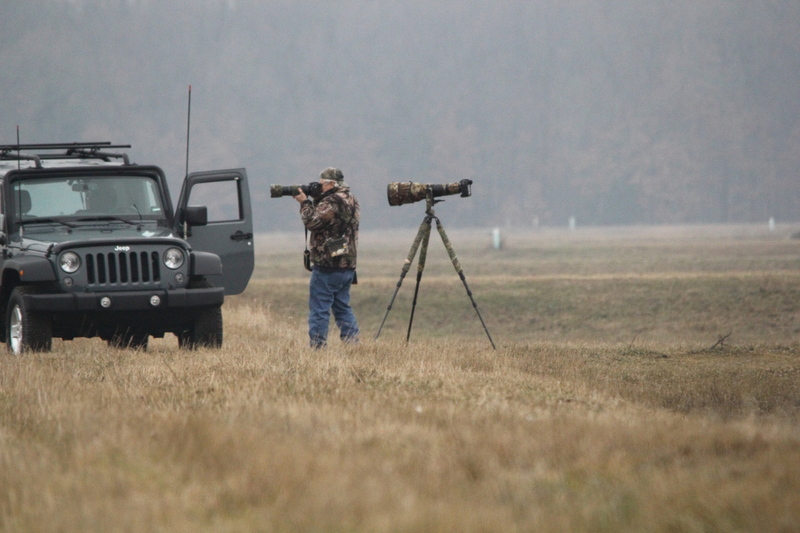 This guy with the BIG LENS set-up his gear…. 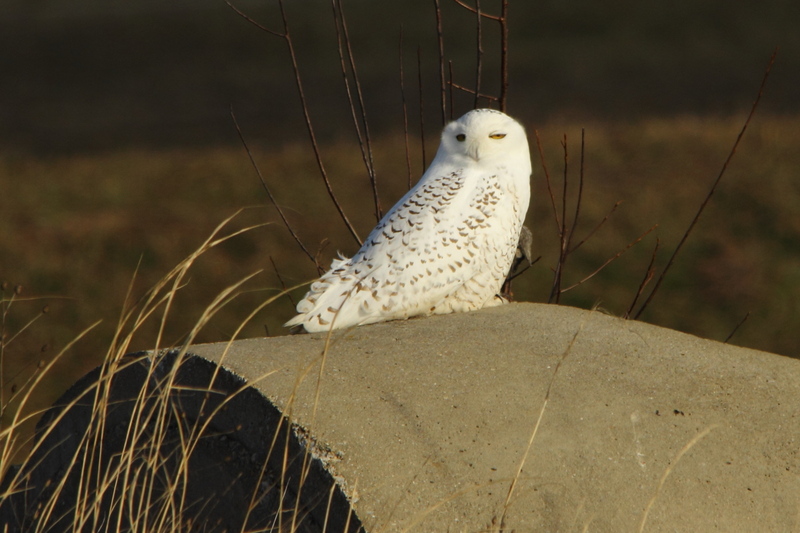 Since the owl had just moved to another spot to look for food, I looked around, and picked out the next perch that I thought that the owl would use as it continued to hunt in the grassy cells, and positioned myself to wait for the owl to come to me. It all went according to plan, and even the light began to improve, for it wasn’t long before the owl took off, and I was able to shoot these. 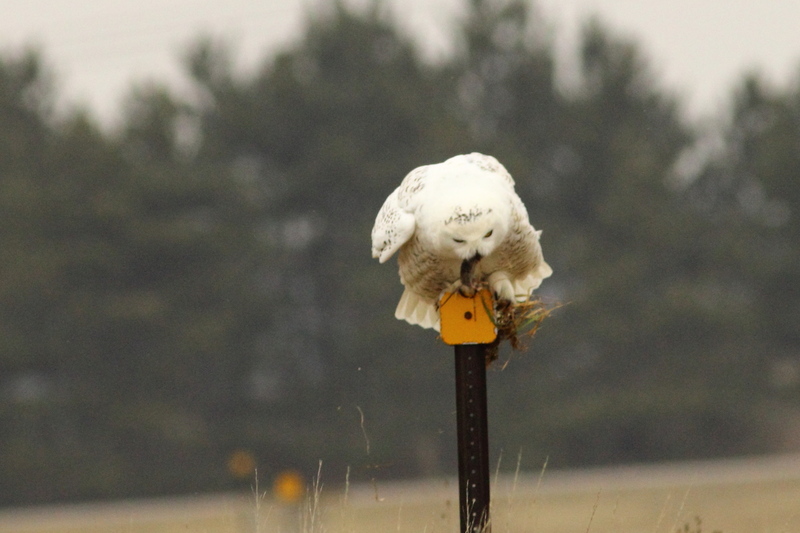 I was really patting myself on the back for having been able to shoot that series of photos, and the owl had even gotten a mouse to eat as you can see. But, I didn’t know that owl and the I had gotten some help from the other photographer. 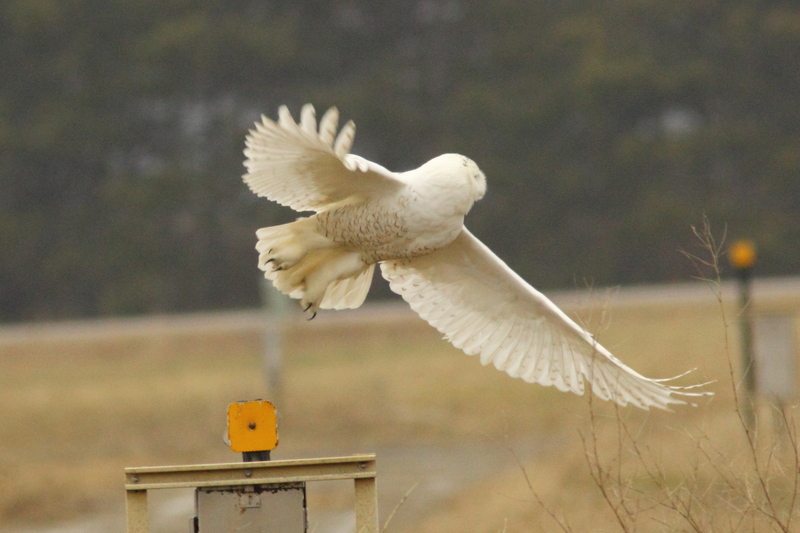 The owl soon took off from the post, and headed back to where it had come from. 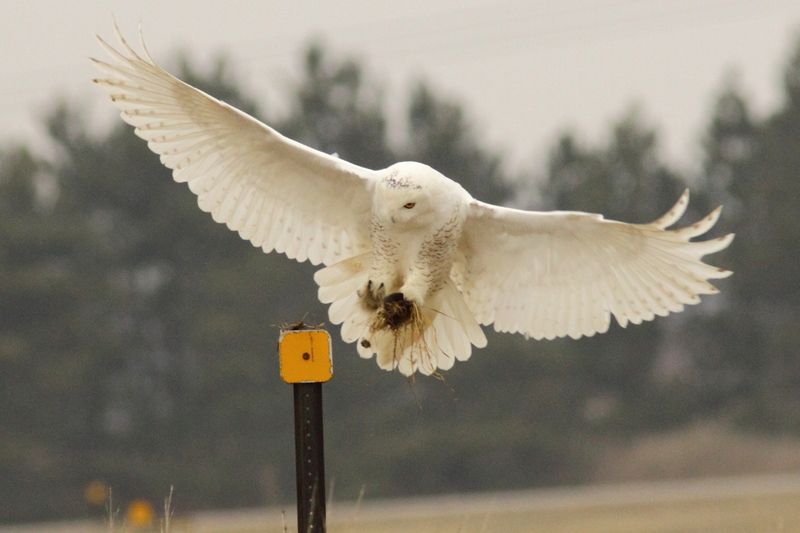 I thought that it was odd that the owl went back, but I reasoned that it had been successful, and maybe it had seen or heard more mice in the same area as it had captured the first. 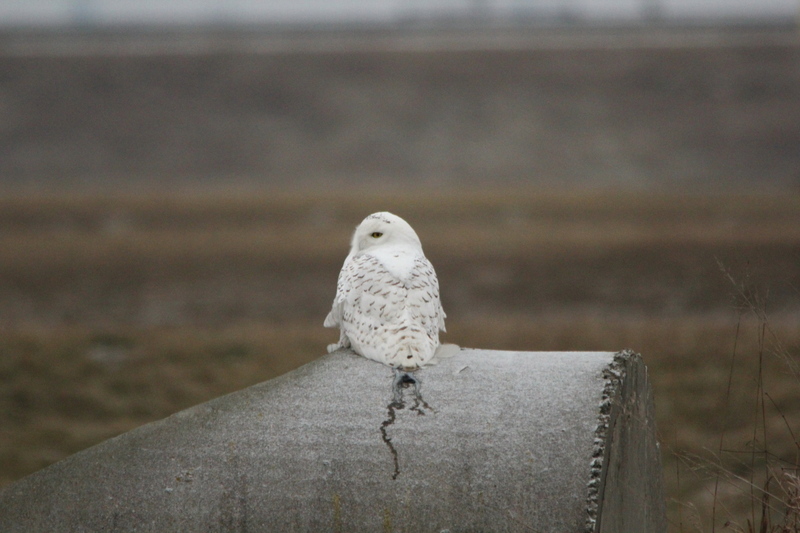 So, I sat and waited, and it wasn’t long before the owl came back towards me. 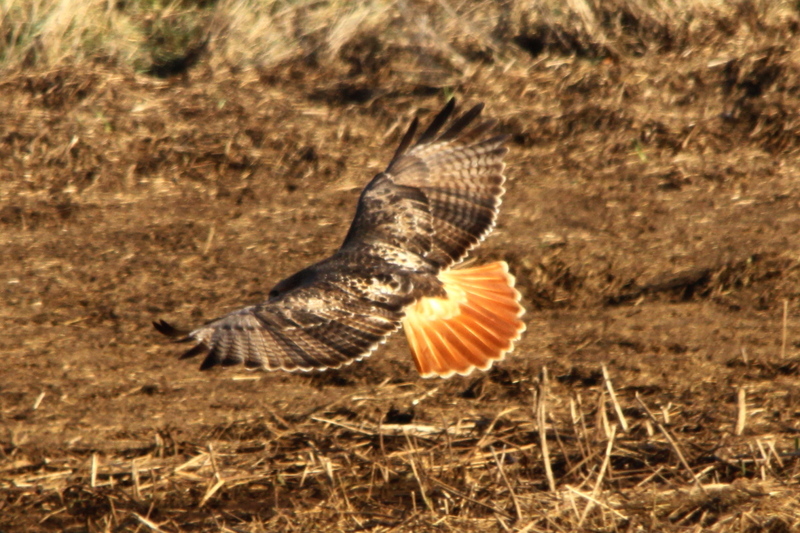 This time, I had even a better idea of the route the owl would take, and was able to get better photos. 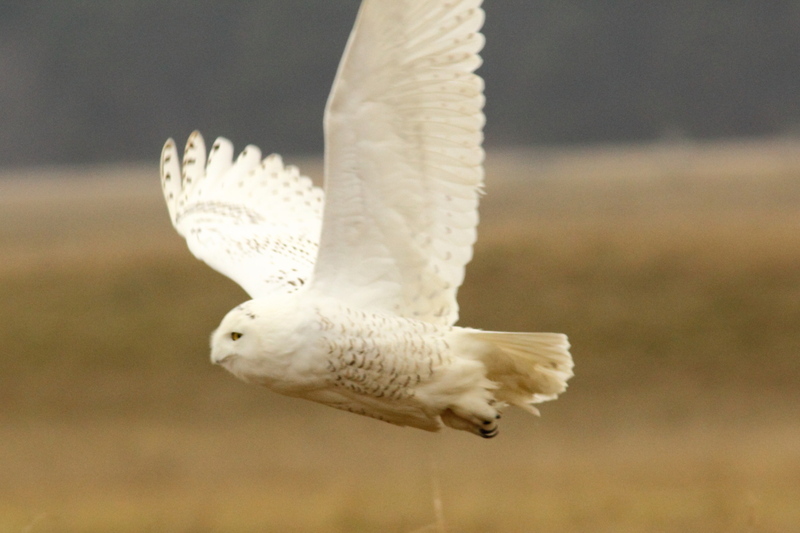 The owl had even gotten another mouse, but this time, it had been a white mouse. Wait a minute, something fishy is going on here, there are no white mice in the wild that I know of. I had been watching the owl intently all of the time, and not paying any attention to what the guy with the BIG LENS was up to. 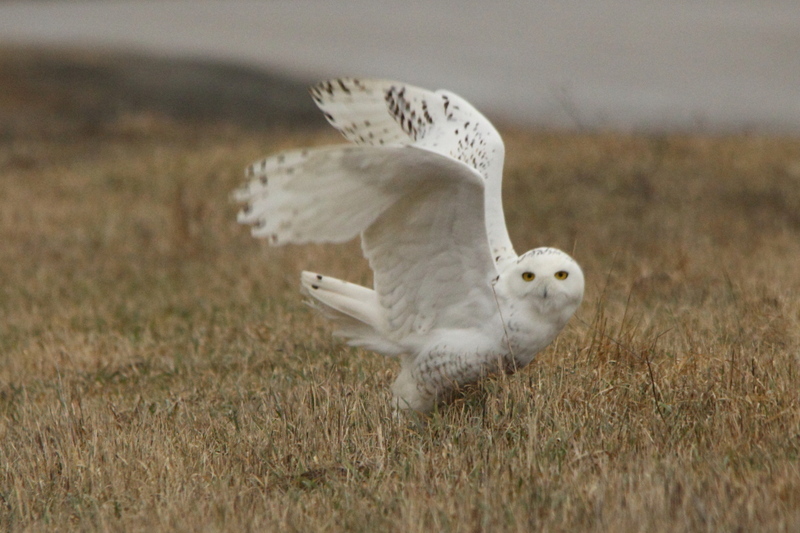 The owl quickly returned to the spot from which it had started the previous two flights, and this time, I watched what the guy with the BIG LENS was up to. After a few minutes had gone by, I watched him get his camera gear all set, then reach into his Jeep to get something out of it. 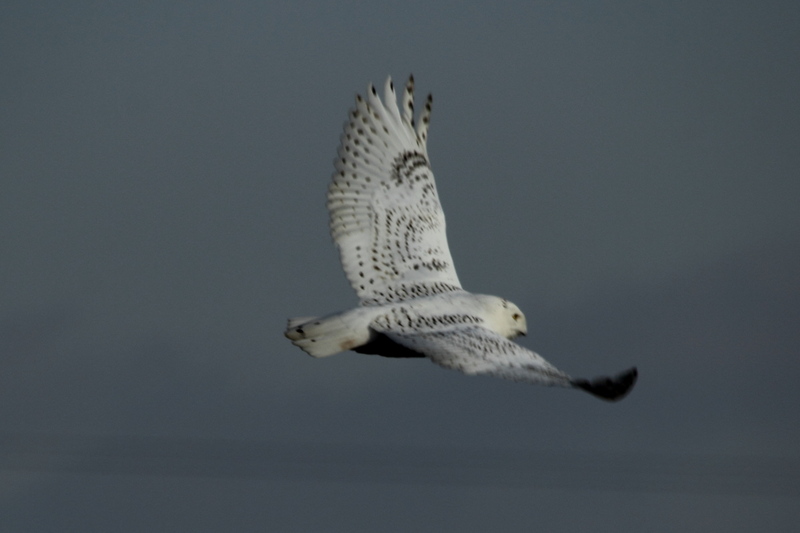 He walked out into the edge of the grassy cell, held out one arm for the owl to see, then tossed something, a mouse, out for the owl. 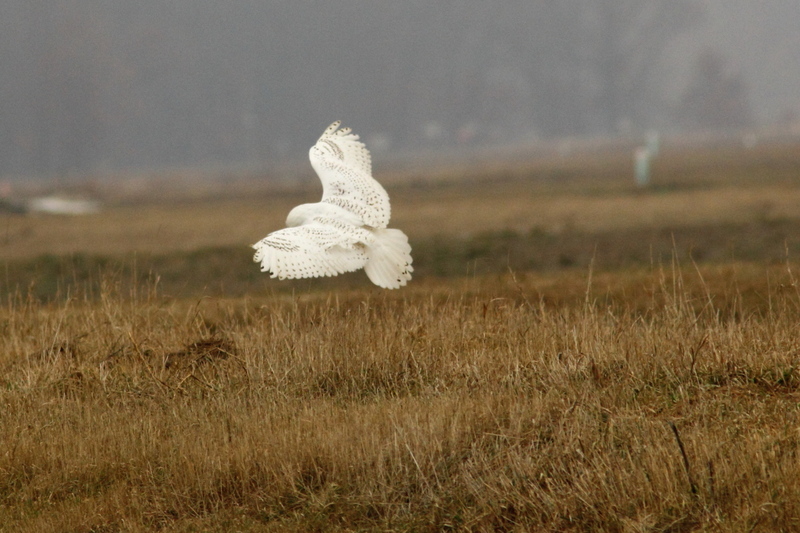 It didn’t take long for the owl to react, it took off right away. 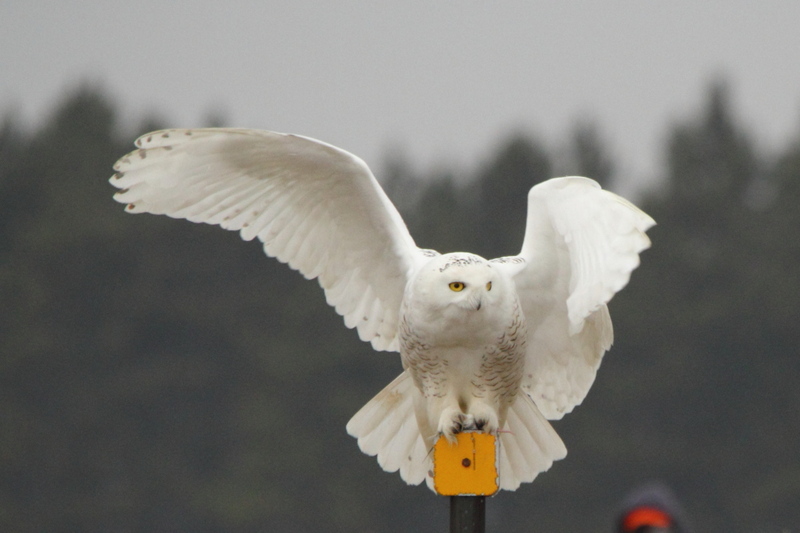 The guy with the BIG LENS must have had the BIG LENS set to shoot photos of the owl as it took off, and he must have triggered that camera remotely. 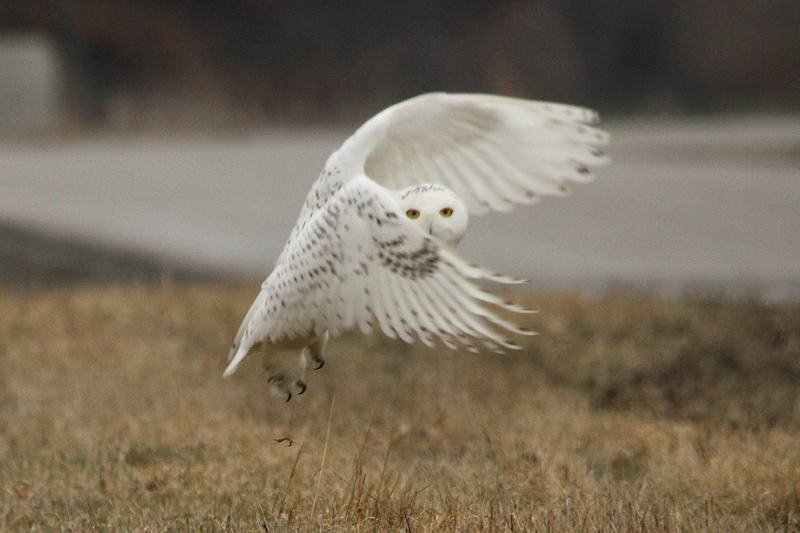 He used the shorter lens to photograph the owl as it flew. Even though I had seen the mouse thrown out into the grassy cells for the owl, I couldn’t resist shooting another batch of photos. It was almost like shooting fish in a barrel, as this time, I was 95% certain of the exact route the owl was going to take. I knew about where the owl was going to rise up above the mound that forms the grassy cell, so I pre-focused on that spot, and caught the owl just as it appeared in my view again. 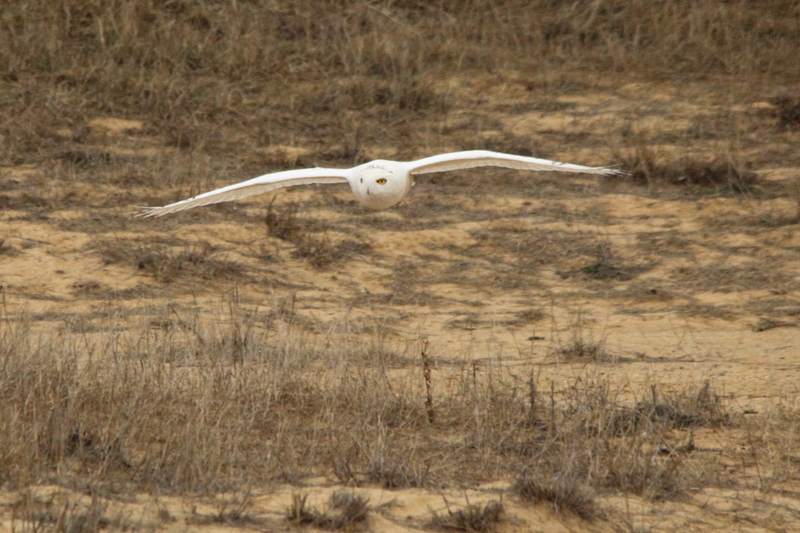 I knew that it would probably drop back down into the second cell, so it was easier to follow the owl in flight. And, I knew almost with certainty where it would land, so I pre-focused on the post with the reflector, and waited for the owl to appear in the viewfinder. Yes, it’s a lot easier to get better photos if you cheat and use bait to get an animal close to you, and to have it do something that you’re prepared for! I debated whether I would even post those last three series of images, since the owl had been baited by the guy with the BIG LENS. 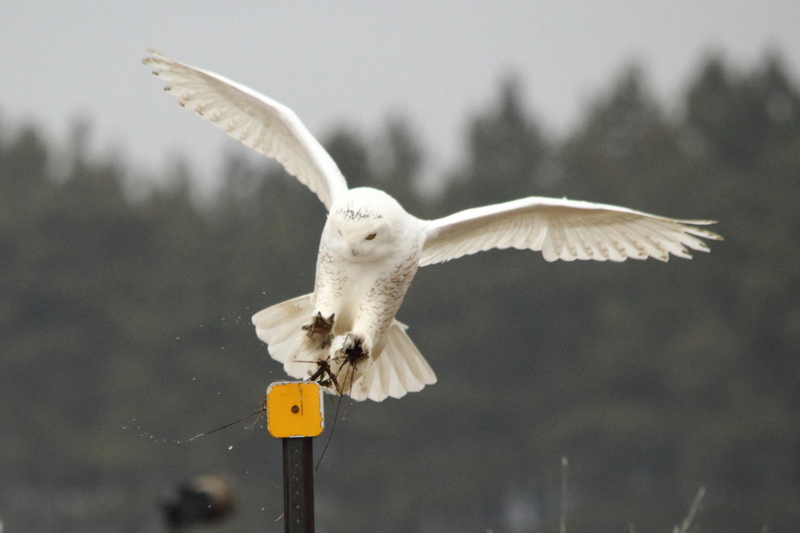 I believe that it is unethical to use bait while photographing nature, and while I wasn’t the one throwing mice out for the owl, I benefited from it, especially in that last series when I knew what was going on. 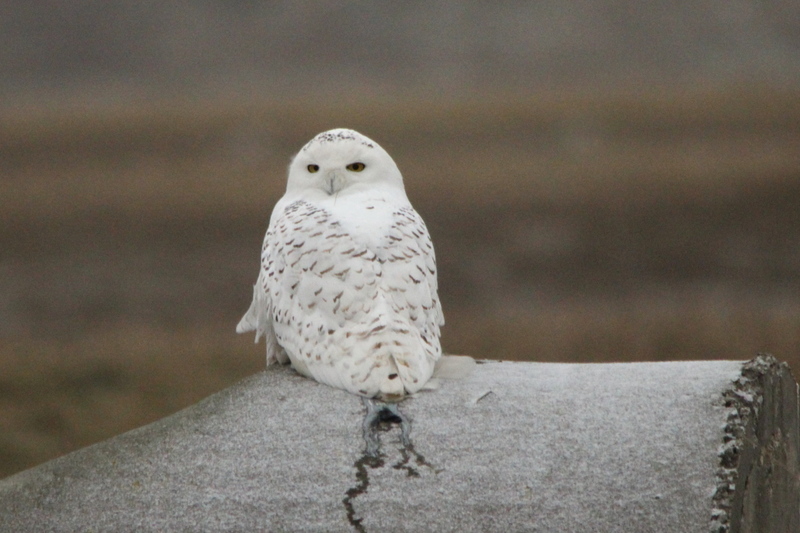 On the other hand, I had been watching the owl all afternoon, and had positioned myself where I did based on having watched the owl, and getting to know how it behaved as it hunted. 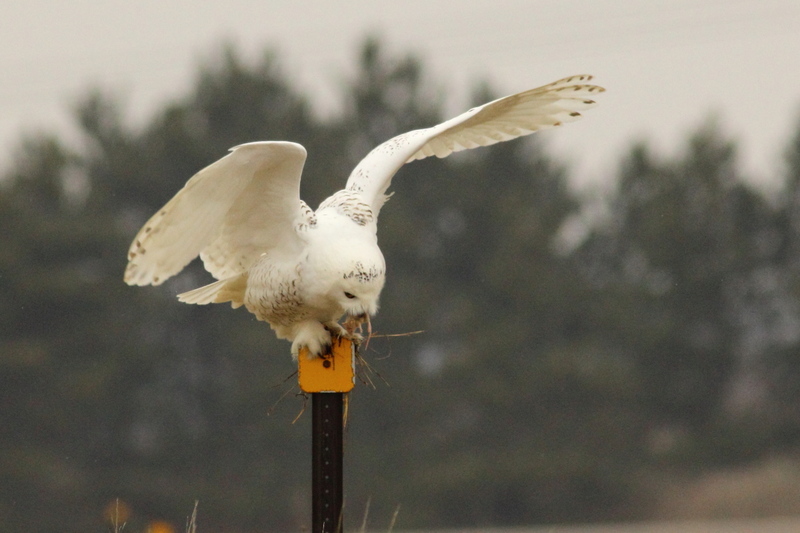 There was a high probability that the owl would have landed on the fence post with the reflector the next time that it had moved, even if the guy with the BIG LENS hadn’t come along to toss mice out to the owl. 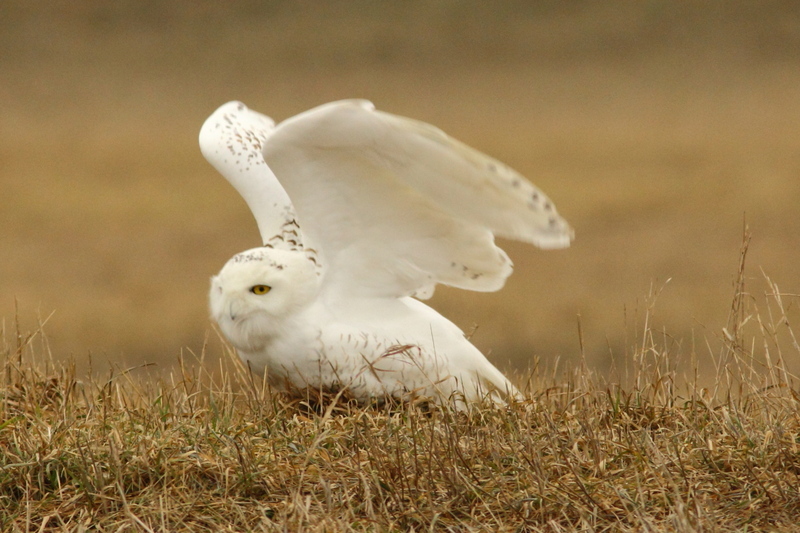 But, that would have been a one time deal, not something that the owl repeated several times for me to learn its exact flight path in order to be prepared for when the owl took that flight. 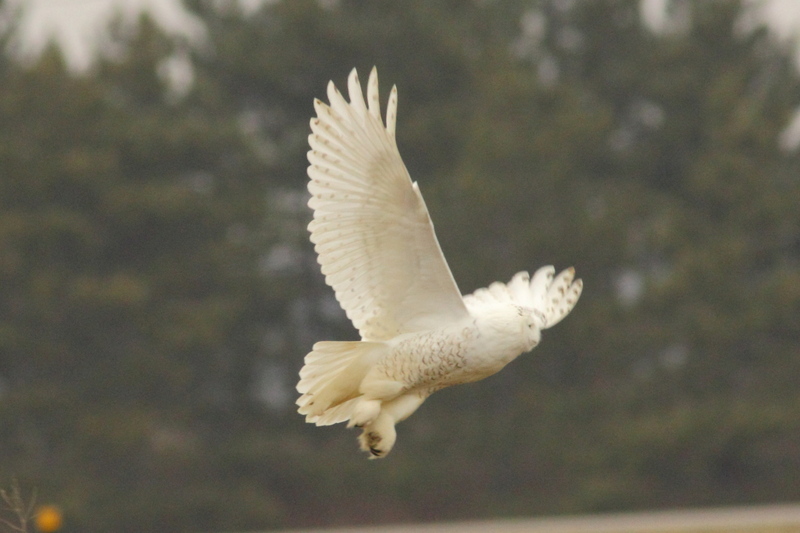 In case you’re wondering the guy with the BIG LENS got some fantastic photos and a video of the owl, I know that because a few of them have been posted on the web site of the Muskegon County Nature Club, so I know who the guy with the BIG LENS is. I decided that I would use those photos that I shot for several reasons. 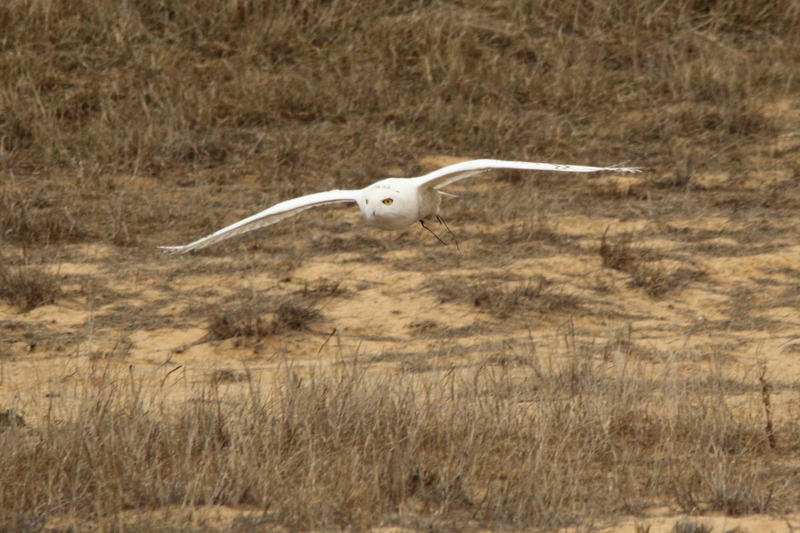 One, they are a record of what I saw that day, including the guy baiting the owl. Two, I had invested most of a day in learning how to get close to the owl as it hunted, it wasn’t my fault that some one showed up to bait the owl just as the light got better. 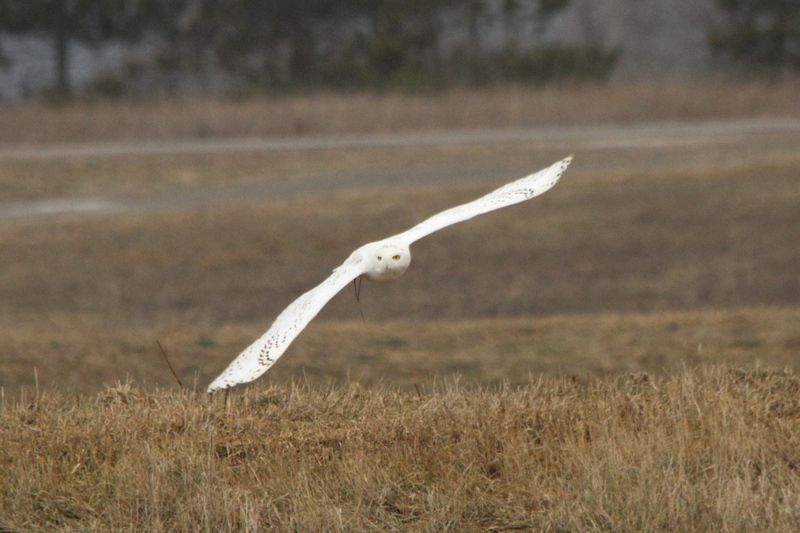 I shot over 400 images of the owl and many of them are close to being as good as the last three series of photos from when the owl was being baited. 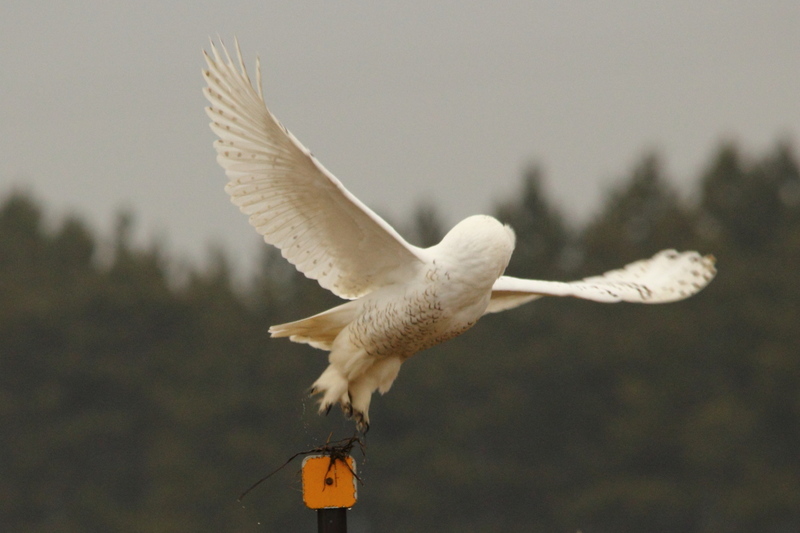 The photos from earlier in the day would have been as good or better than those that I shot as the owl was being baited if the light had been as good earlier. 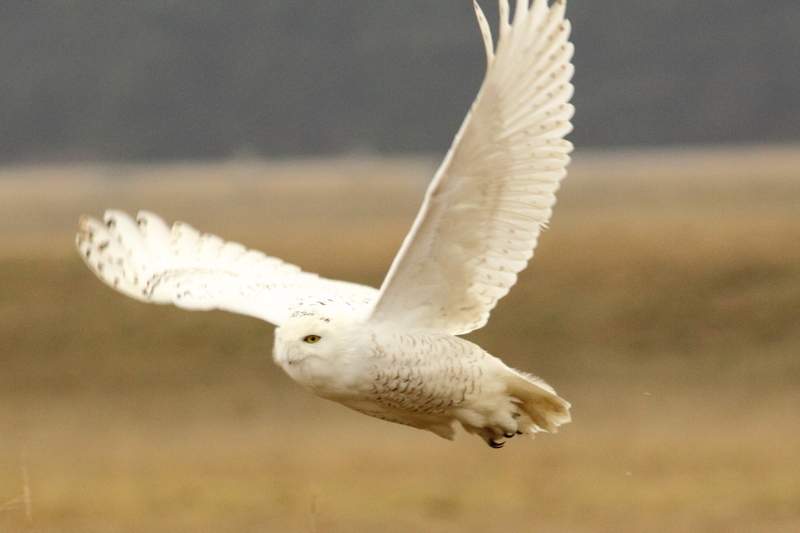 And, like I said, I chose where to position myself based on having learned the owl’s habits, not on the fact that some one started tossing mice out to the owl. Still, it is an ethical issue that I’m still having trouble coming to grips with. 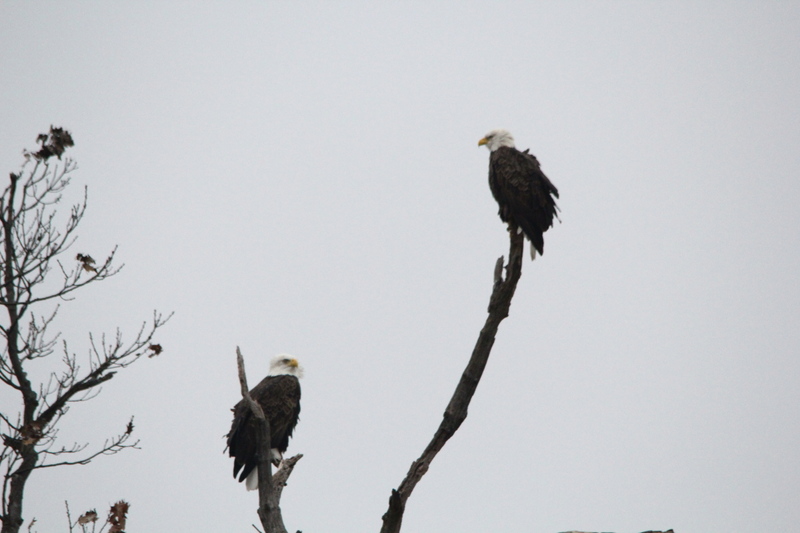 At the time, I was so disgusted with myself, that I went over to shoot this crummy shot of two bald eagles that I had been keeping an eye on as I was watching the owl as a way of atoning for the sin of having photographed the owl that had been baited. Well, that all took place a week ago. I haven’t had much time to work on this post, as I was either working long hours the first three days of the week, or out walking trying to get a few good photos despite the constant gloomy weather that’s been in place here. I still haven’t come to terms with having photographed the owl even though I knew some one else was feeding it, I may not ever. But, I’ll have more about that in future posts, right now, it’s time to stick a fork in this one, as it’s done. That this is it for this one, thanks for stopping by! Just a quick post to wish every one a Merry Christmas and a Happy New Year! 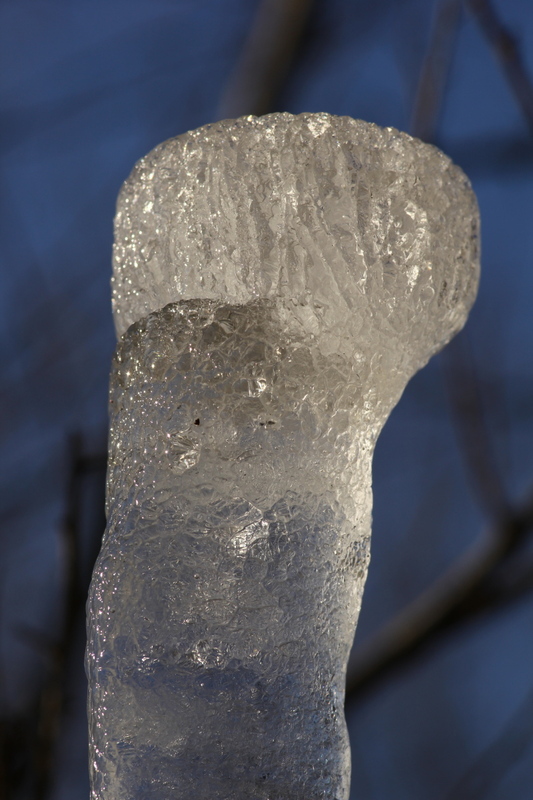 Since most of the month of December has looked like this…. 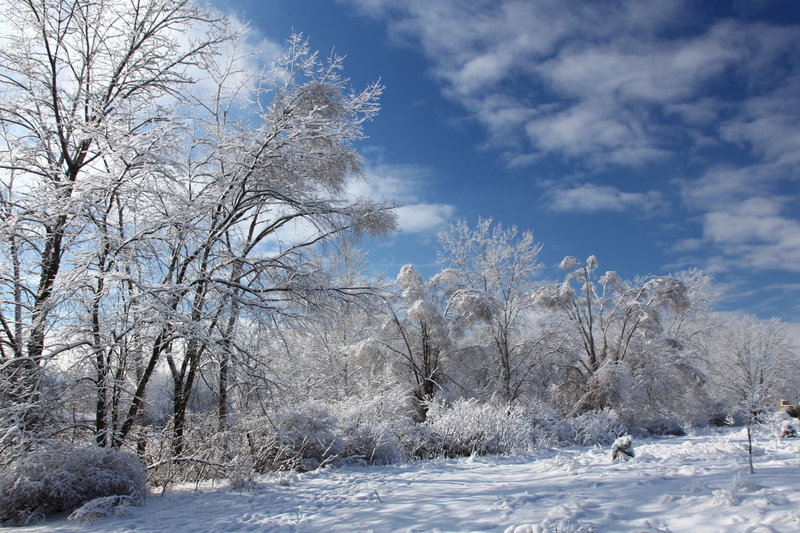 …I dug back into my archives for this snow scene from last winter. 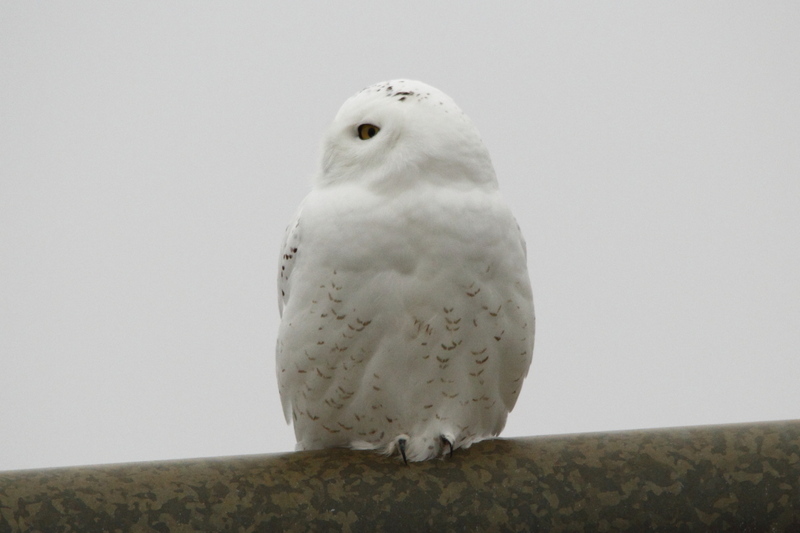 The only things that I’ve seen recently that has anything to do with snow are the snowy owls, so here’s one of them. So, here’s hoping that every one has a safe and wonderful holiday season, with peace on Earth and goodwill towards men! 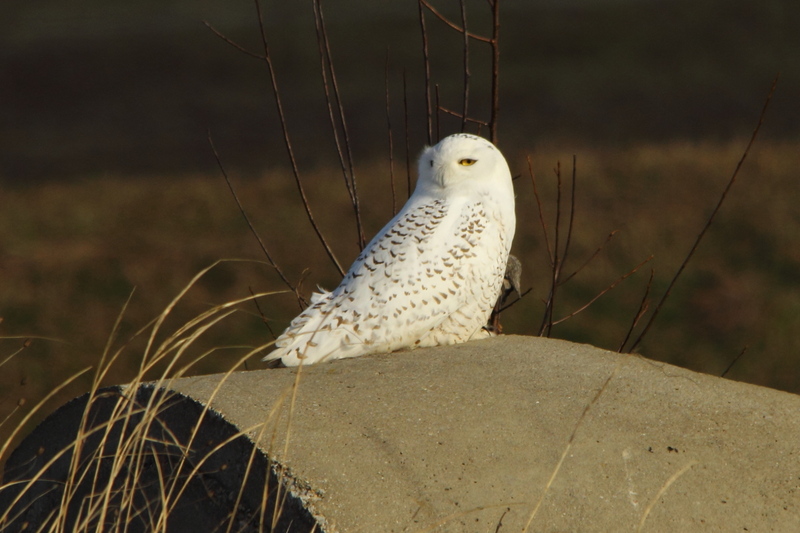 This post is a continuation about a trip that I made to Muskegon on December 6th, in which I asked myself if I’m spoiled by all the wildlife that I’m able to photograph. My answer was, yes I am spoiled. That plays into some of the reasons that I’m not able to get the quality of images that I would like to be shooting. That may need some explanation. 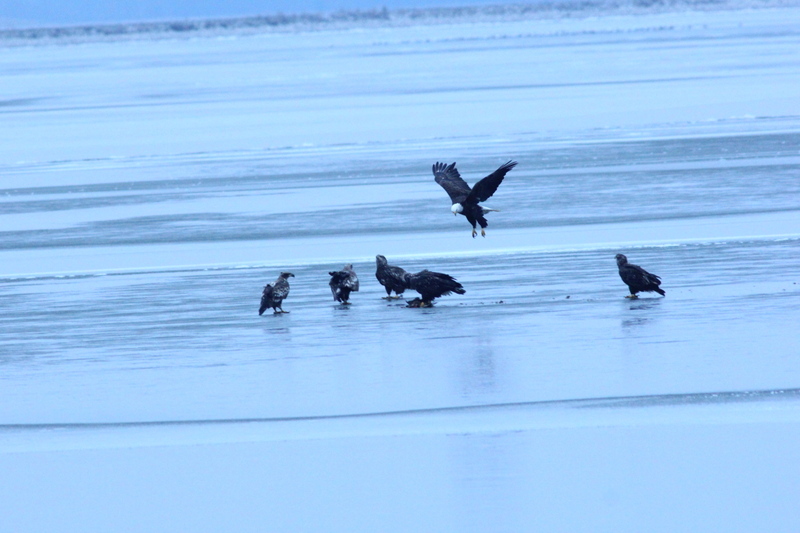 I went to Muskegon, and I was up to at least 14 eagles when I stopped counting eagles. It’s too easy not to work very hard at getting good photos when good subjects are so abundant, even if I seldom see those subjects in situations that would lead to great images. I assume that great photos will just fall into my lap if I go there often enough, but it doesn’t happen that way. Relying on luck is not the way to success, it’s like playing the lottery in hopes of getting rich. Another easy way to excuse my poor images is to blame the equipment, thinking that if only I could afford the best of camera gear, that my images would become that much better. Yes, and no. …a person I was talking to was using a Canon 600 mm L series lens, which retails for $12,000! That lens alone cost twice what all the gear that I have combined has cost me. Even if I could afford that lens, I probably wouldn’t buy it, I’d rather spend the money taking extended vacations to shoot more photos. Besides, what good is the best equipment if I don’t know how to use it, or I forget to prepare for the photo opportunities that it’s a safe bet will come my way? That’s where being spoiled by being able to see birds and animals that most people never see becomes a handicap in a way, like I said earlier, I assume if I go to Muskegon often enough, great photos will just happen, and I don’t think of the ways that I could improve my photos as I’m shooting them. And, because of how often I’m able to see rare birds, and my desire to add to the list of rare birds that I’m able to photograph, I lack the patience to sit and capture the moment that would result in a spectacular image. 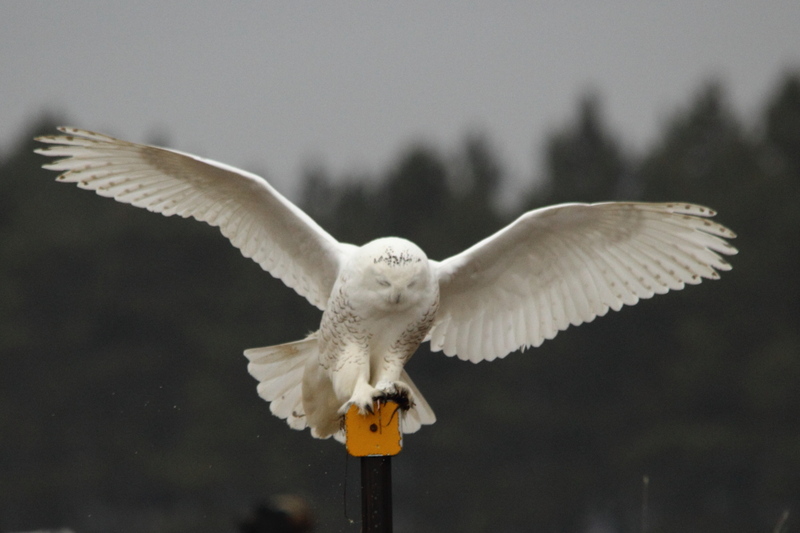 The snowy owl is a perfect example of that. 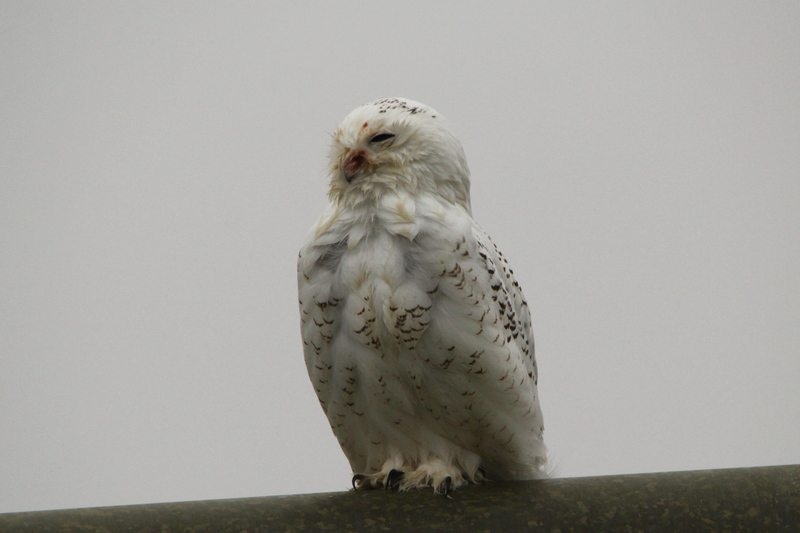 Due to the circumstances, I couldn’t get as close to the owl as I would have liked, so I knew that I would be cropping the images that you see here. 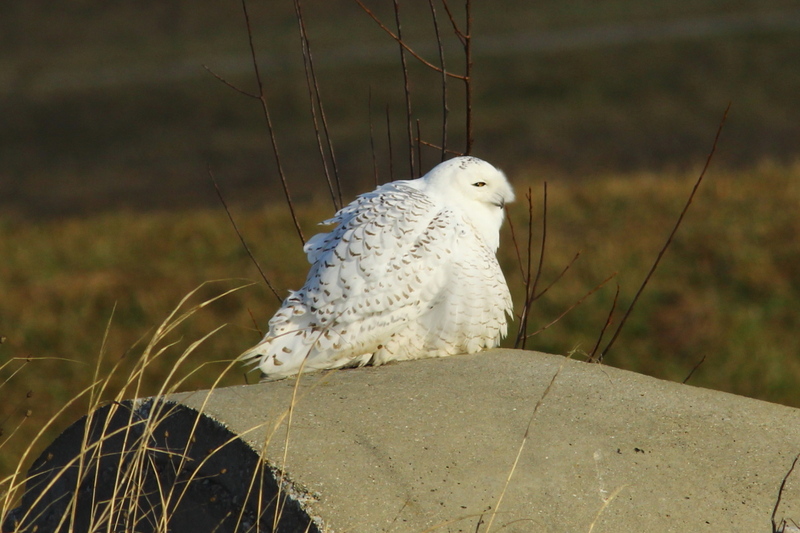 I sat there watching the owl, and occasionally shot a few more photos if it looked as if it was going to do something besides sit and soak up the sunshine. 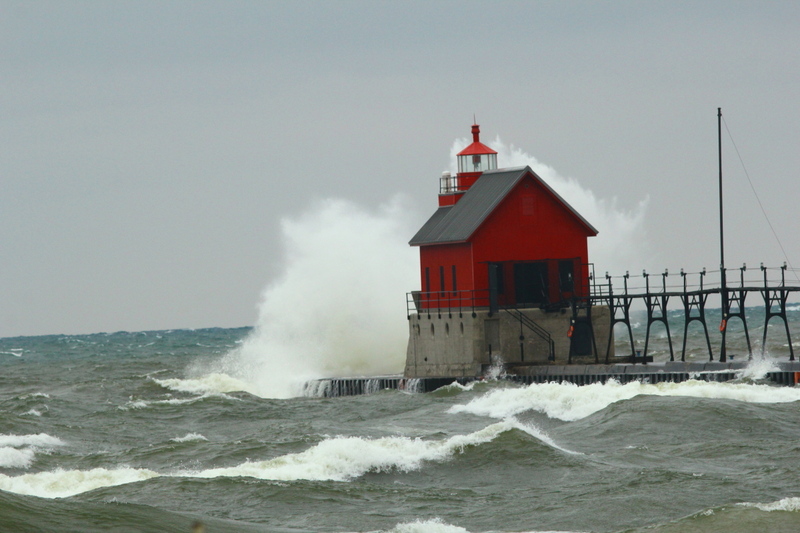 These may look like repeats of the same photos as in the last post from Muskegon, but they’re not. Wanting to make sure that I had good photos, whenever the owl moved at all, even if it was just fluffing its feathers, I shot more photos. After about twenty minutes of watching the owl, this is the way that I was beginning to feel about sitting there. 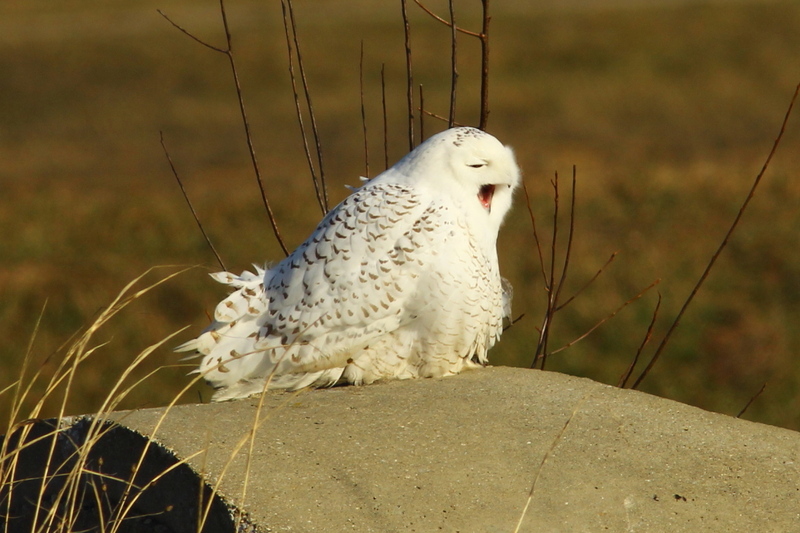 I did sit up and take notice when the owl turned into the wind to check out something that it had heard. I was getting bored sitting there, I wanted to go searching for something new to photograph, and I shouldn’t have been. 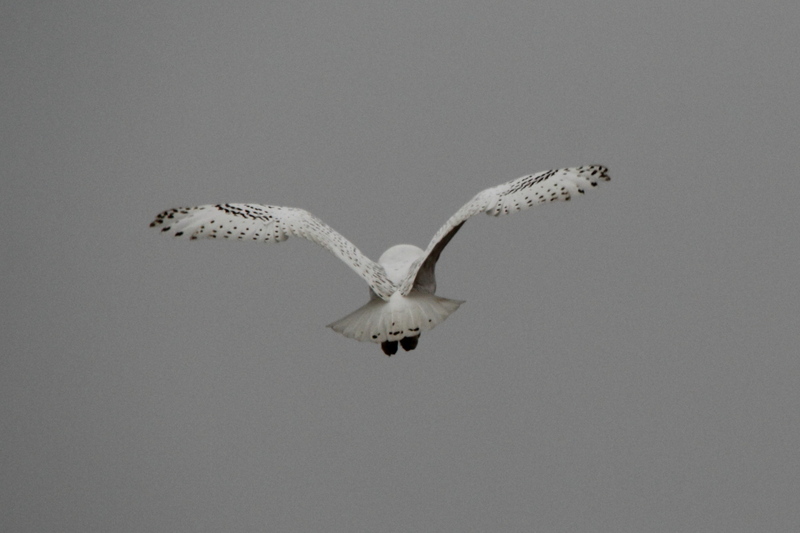 I should have been thinking of ways to get even better images of the owl, such as trying the 1.4 X tele-converter behind the Beast (Sigma 150-500 mm lens), but I didn’t. I should have gotten the other camera body that had the 300 mm prime lens and tele-converter on it ready for action photos, but I didn’t. So when the owl did take flight, I was totally unprepared, and not even paying much attention to the owl by then, so I missed the shots that could have been the great ones. 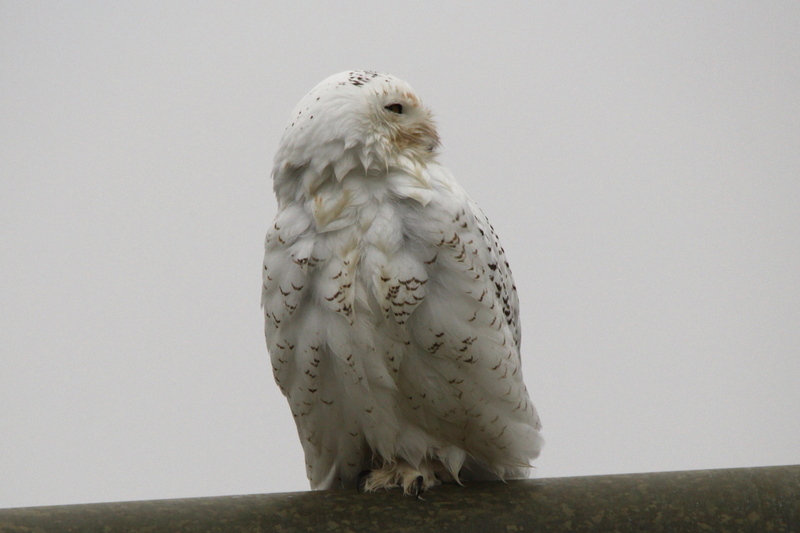 I lack the patience to sit in one place for very long, watching one perched bird, even if it is a snowy owl, for me to capture the special shots. 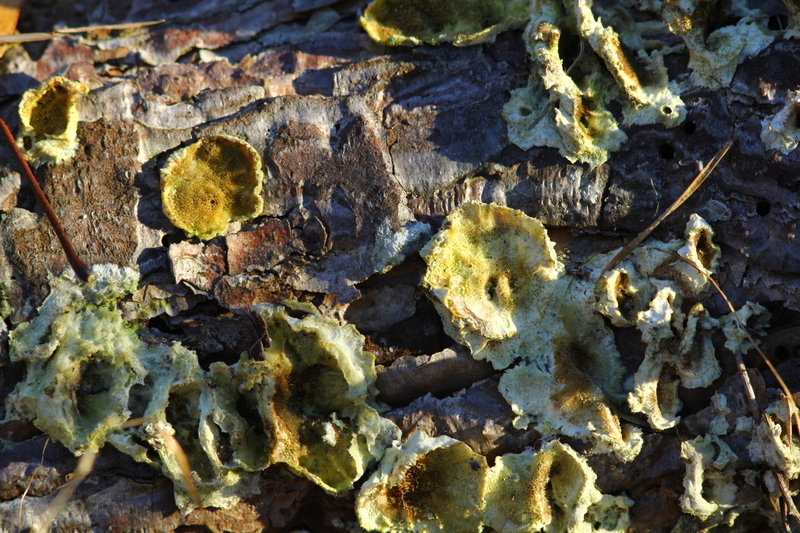 Well, that and who knows what I’ll find next to photograph, especially in the Muskegon area. The lure of seeing something new to photograph limits how long I am willing to sit in one place hoping to shoot a great photo. In some ways, starting the My Photo Life List project has been a mistake of sorts as far as my ability to sit and watch one bird is concerned. 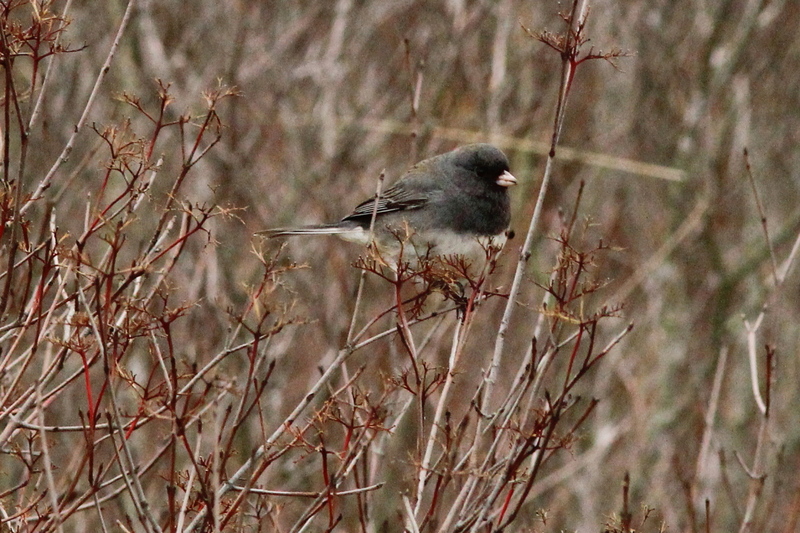 I’m more concerned with seeing and photographing new to me species of birds for that project, and less concerned with sitting in one spot photographing a species that I have already gotten reasonably good photos of for that project. 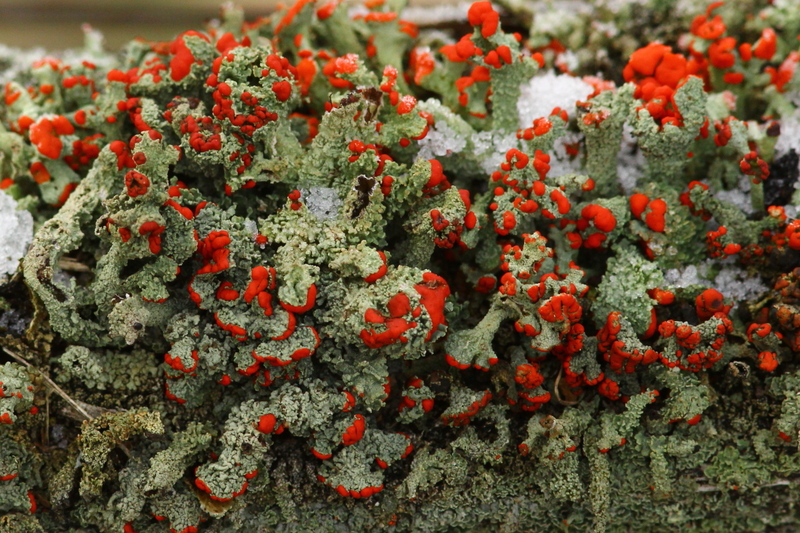 I need to strike a better balance between finding new species, and getting better photos of species I’ve already done. I’ve considered either making or purchasing hides, or as we used to call them, blinds, and try staying hidden in one to get the great images, but I doubt that I could sit still for very long. 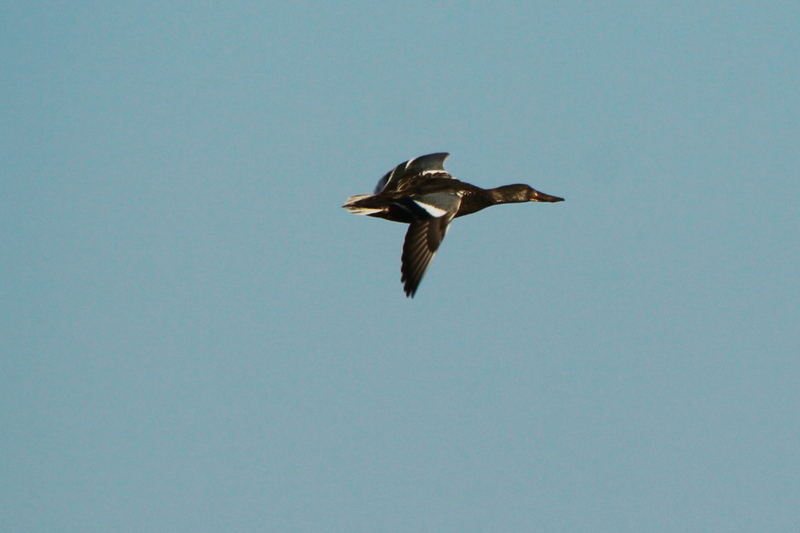 It’s much more interesting to me to chase the smaller birds around in hopes of getting a good photo of them. 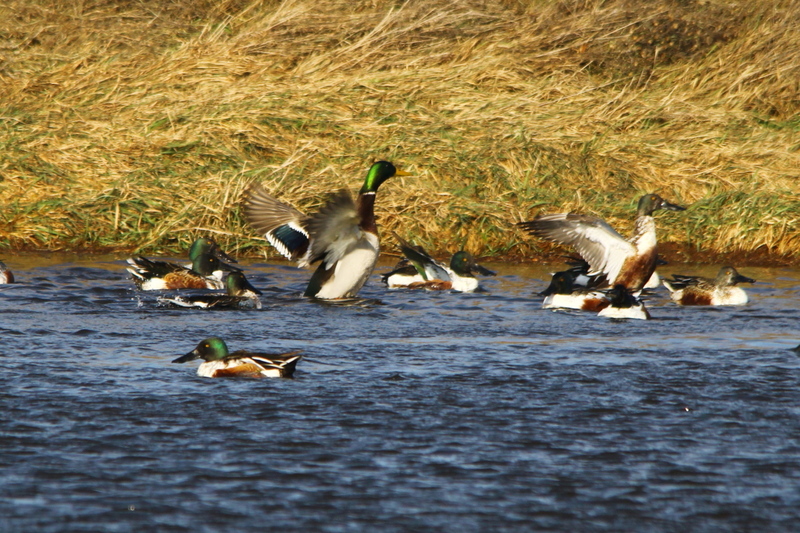 It’s the “thrill of the hunt” as it is in progress that keeps me focused on one bird at that time. I can hold the Beast (Sigma 150-500 mm lens) up and heave it around following the smaller birds around as they flit from place to place in search of food for as long as it takes for the bird to make a mistake and allow me a clear photo of it. 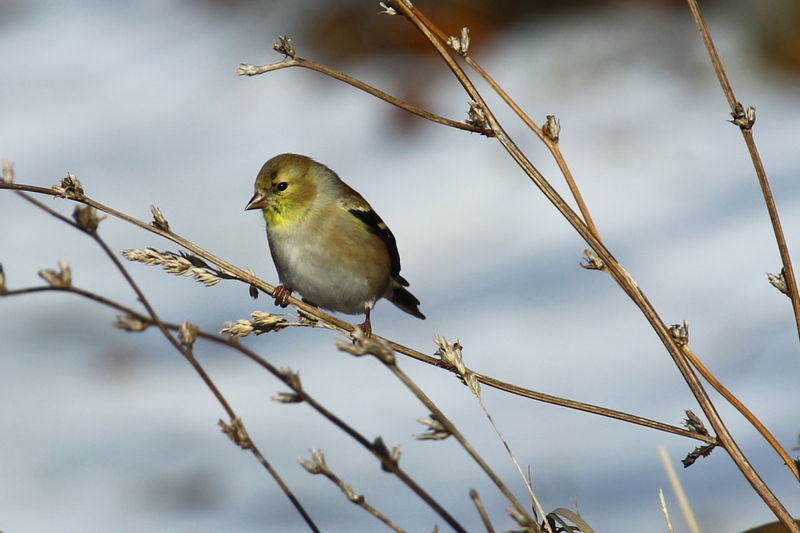 But photos of small birds seldom make people “oooo” and “aah” over them. If there are action shots to shoot, I can sit in one spot and shoot away for as long as the action continues. You may be thinking that these are pretty good, what’s this guy complaining about? Well, I tend to remember my failures more so than my successes. I had two major failures on this trip, one because of my forgetting to switch off the Optical Stabilization of the Beast, one because my 60D body with the Beast on it doesn’t auto-focus fast enough for what I was trying to shoot. 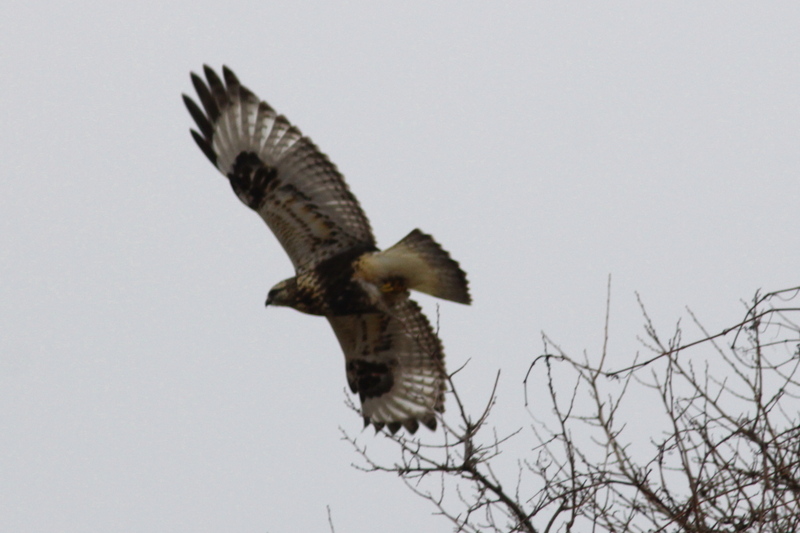 First, my failure, I saw a rough-legged hawk flying almost straight at me. The hawk began hovering nearly directly over my head, so I got the camera body all set as far as exposure and switched to the high-speed burst mode of shooting, but since I had the lens pointed nearly vertical, the OS of the Beast caused ghosting in every one of the nearly 100 photos that I shot before the hawk moved off. 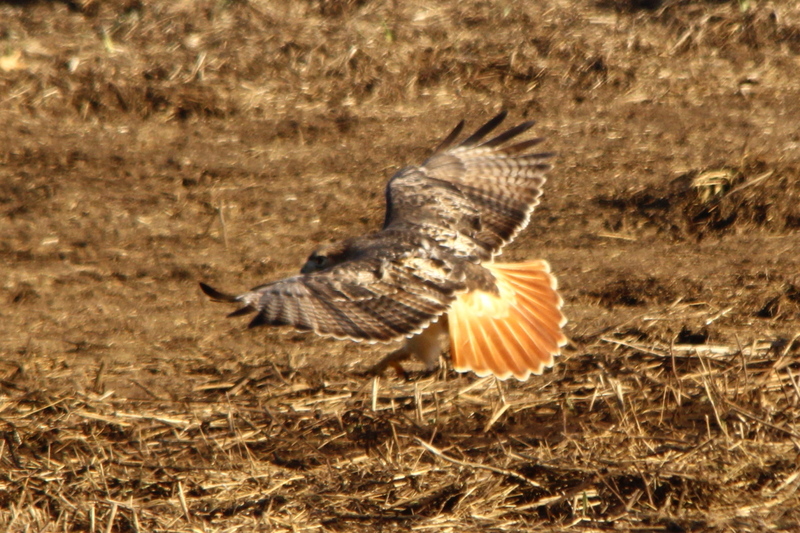 When the hawk did move off, it wasn’t very far, and it landed, but the heat waves coming off from the bare ground spoiled this image. 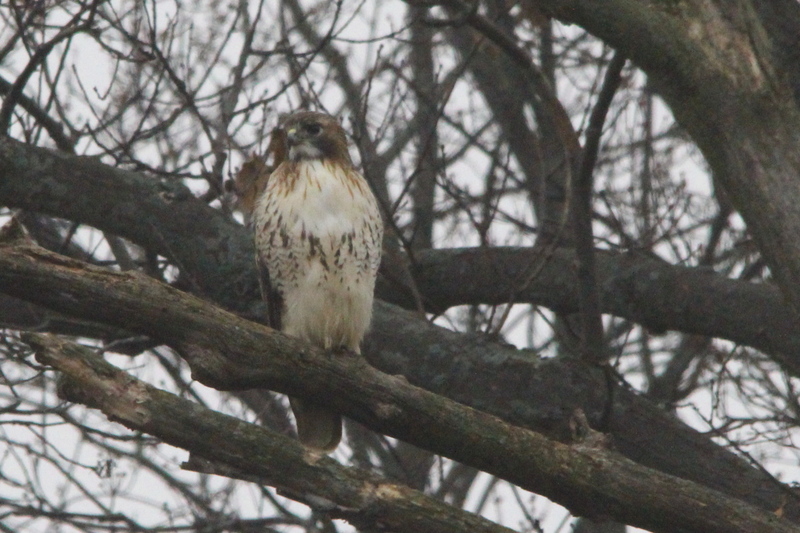 Now then, for the camera failure, I saw a red-tailed hawk being mobbed by crows, and the hawk flew right past me in an attempt to shake the crows off from its tail. 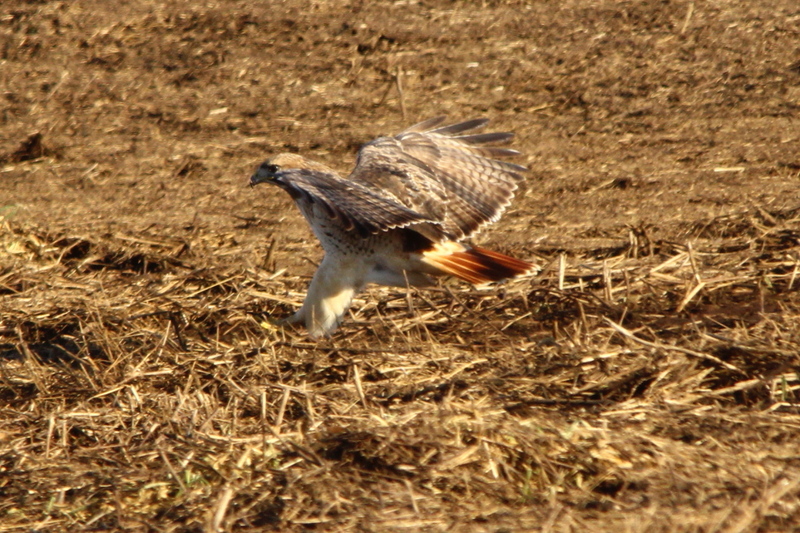 I started shooting, but the auto-focus system of my camera couldn’t keep up with the hawk, notice that each of these photos gets a little sharper as the hawk slowed down to land. 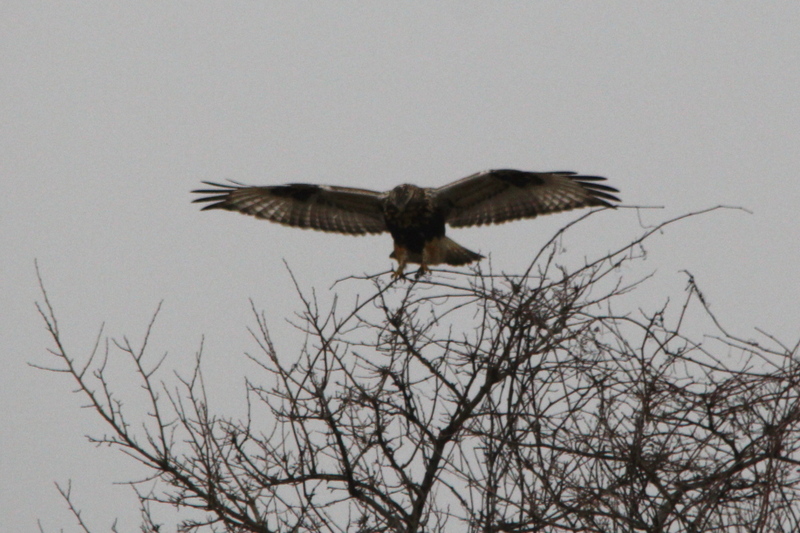 I zoomed out a little for these, as one of the crows made one last pass at the hawk. 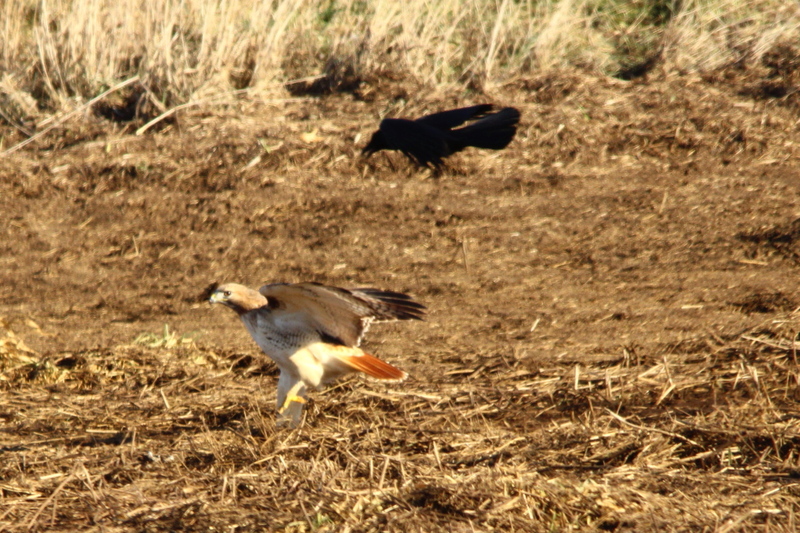 Then I zoomed back in to catch the hawk looking at me as if to ask why the crows were picking on him. One good thing is that if I have some good light to work with, my portraits of birds are getting better most of the time. Now then, we interrupt this post for a news flash! I did a dumb thing this afternoon, I went to the camera store to check out a new Canon 7D Mk II and also a 400 mm prime lens with doubler behind it, now I can’t stop drooling. What a camera and what a lens! To begin with, the 7D Mk II will auto-focus if I use the Beast and the 1.4 X tele-converter, giving me an effective focal length of 700 mm. 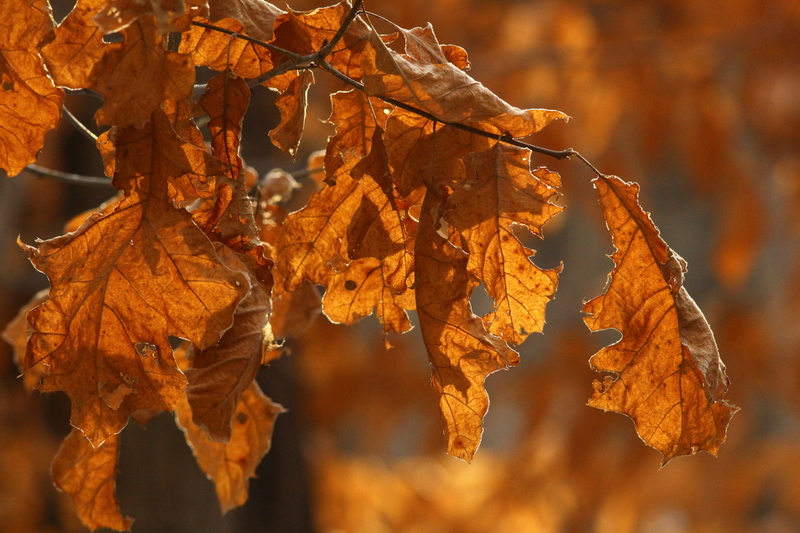 With my 60D bodies, I have to manually focus, and the images were only sharp if they were shot at close range. 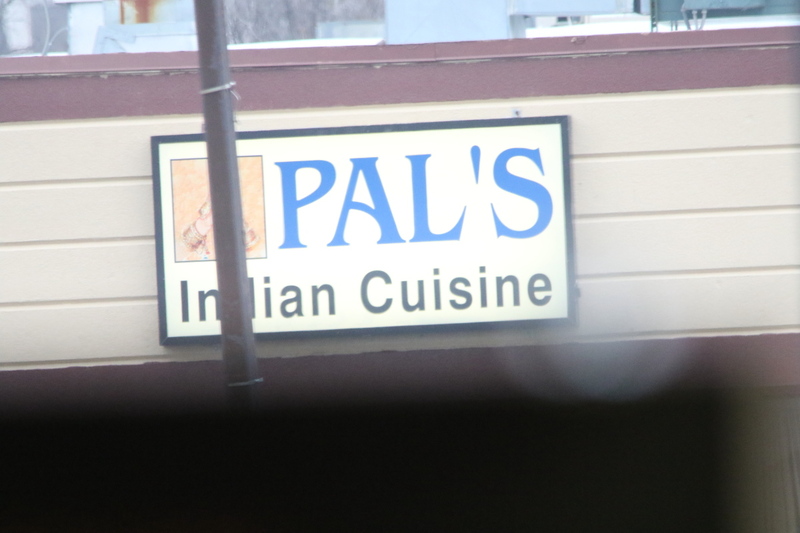 Here’s what the 7D, the Beast, and the Tamron extender can do together, shot through a dirty window. The 7D will also auto-focus if I use a 2 X tele-converter behind the 300 mm prime lens I already own. The 7D won’t auto-focus if I use the 400 mm prime lens and a 2 X tele-converter behind it, but here’s what I got manually focusing. 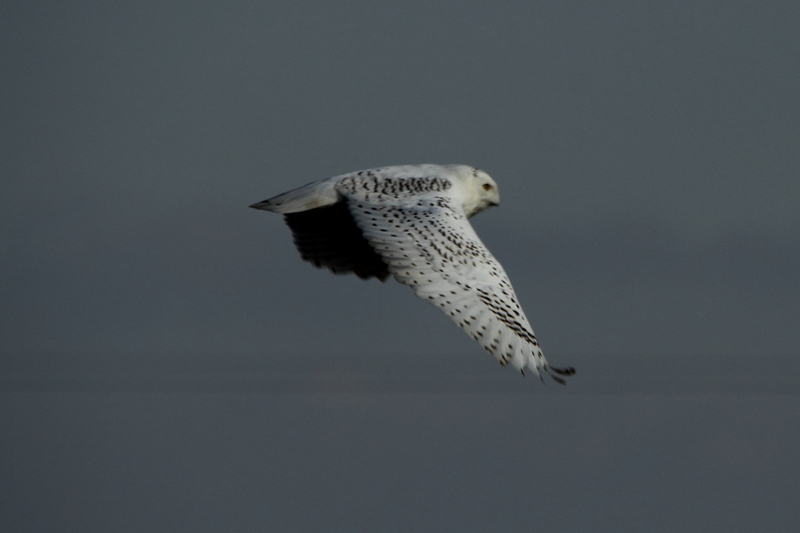 And, I got this shot inside, handheld at 800 mm and a shutter speed of only 1/100th! You’re probably thinking that these images aren’t that great, but I was giving the camera and lenses the torture tests, much higher ISO settings than I can get good photos with currently using my 60D bodies at extreme focal lengths and very slow shutter speeds for the most part. The first thing that I noticed is that both the Beast and the 300 mm prime lenses I have were sharp at all distances when using them on the 7D body. The differences that they show when used on my 60D bodies has to be due to the body, and not the lenses. I shot quite a few photos close, mid-distances, and far away, and the Beast didn’t go blurry past 100 feet as it does on my bodies, nor did the 300 mm prime go soft at mid-distances. I had stopped trying the 1.4 extender behind the Beast, the results were too poor. 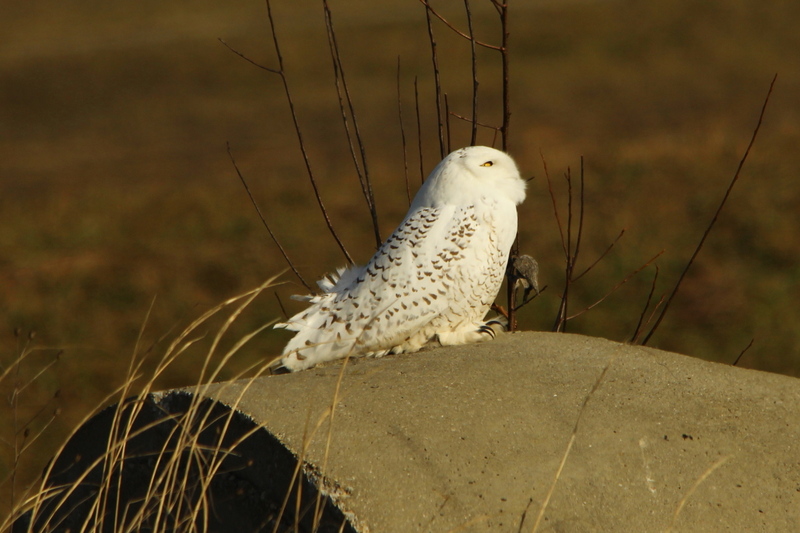 Not with what I saw from the 7D today, I’d have no qualms using that set-up for birds like the snowy owl in good light at any distance. Even with the 2X extender behind the 300 mm prime lens, it was sharp at every distance, and I didn’t have to play games with the focus to get the images sharp as I do now. 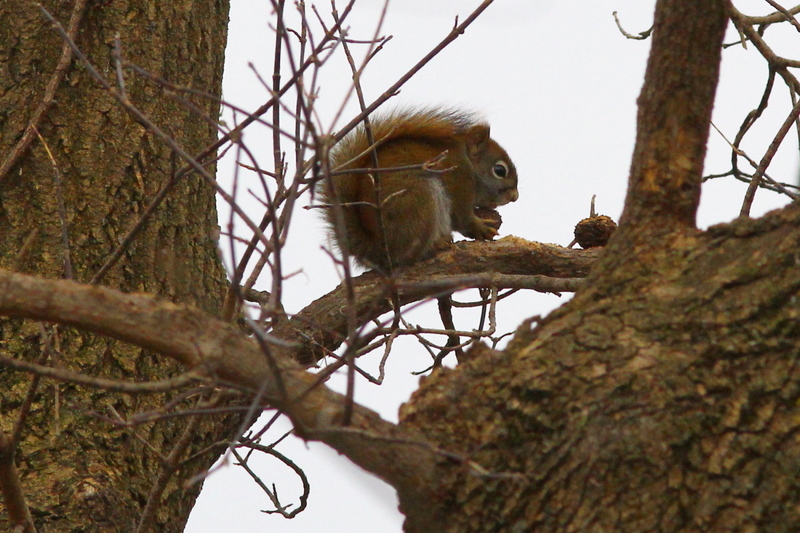 With the 1.4 X extender, it was also sharp at every distance that I tried. But the real shocker was how much better the 400 mm prime lens that I tried out is than either the Beast or the 300 mm prime lens. If you remember, I flipped back and forth between the 300 mm and 400 mm prime lenses for months, and purchased the 300 mm because of how close it can focus. I hate to admit it, but I should have purchased the 400 mm prime instead, maybe I will some day. First, I have to save up for the 7D body first, maybe I’ll find out once I get it dialed in for my existing lenses that I’ll have no need for the 400 mm lens. I see that I’ve been prattling on again, not making much sense. What my trip today all boils down to is this, the auto-focusing system of the 7D is head and shoulders above my 60D as is its high ISO/lower noise capabilities. Just what I need for shots like these. I’m really geeked at the idea of using a 7D Mk II next spring, so much so that it would be all that I could write about right now, so for now, this is the end. The blue-headed vireo is a Neotropical migrating song bird found in North and Central America. 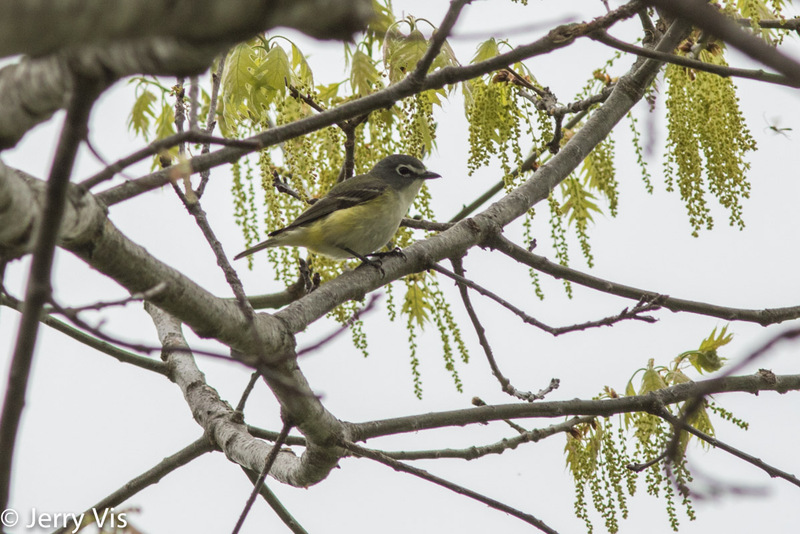 There are currently two recognized sub-species that belong to the blue-headed vireo. It has a range that extends across Canada and the eastern coast of the United-States, Mexico and some of Central America. 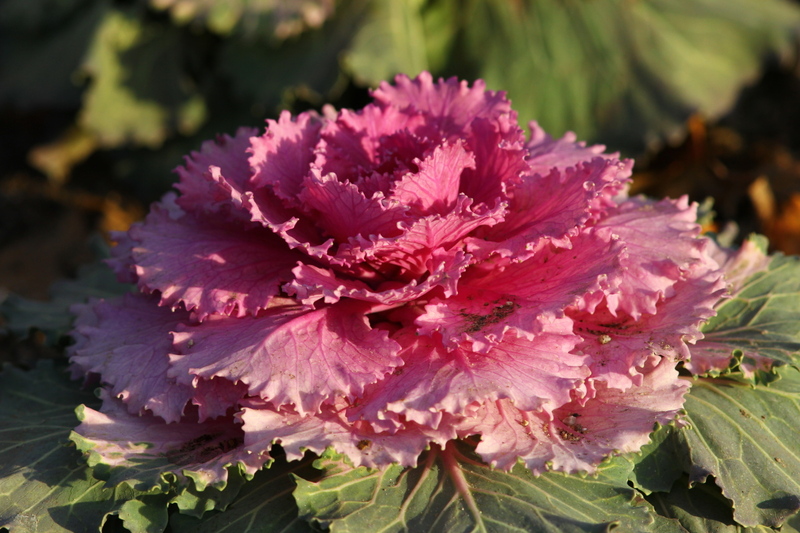 It prefers large temperate forests with a mix of evergreen trees and deciduous under growth. As the name suggests, the blue-headed vireo is characterized by its blue-grey head and bold yellow wing bars. 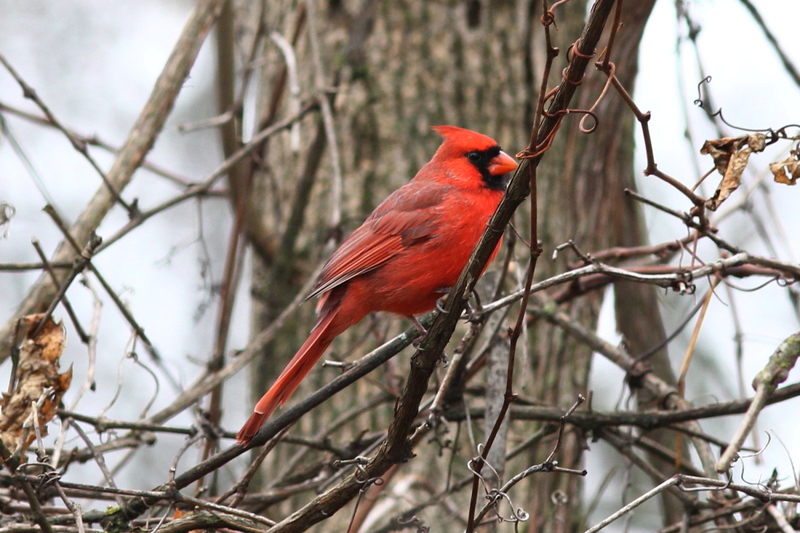 Both sexes are very similar in plumage and size. 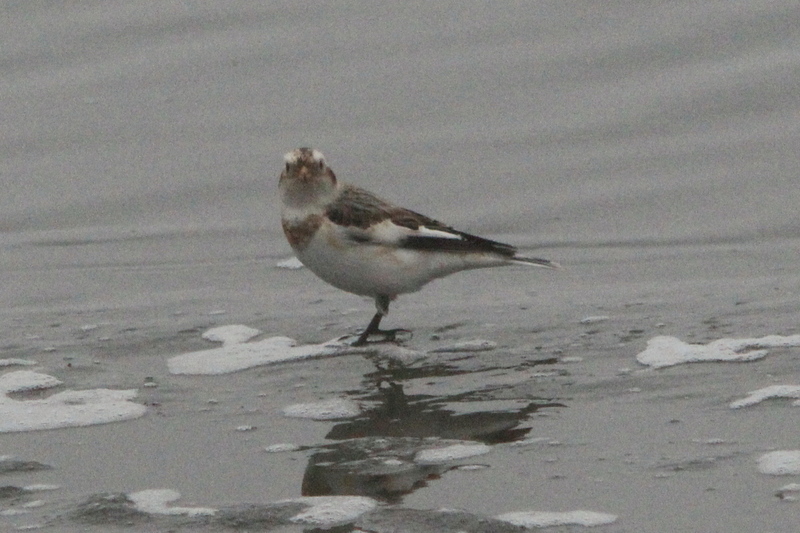 Juveniles also have a similar plumage. The blue-headed vireo has similar plumage year round and does not drastically change its appearance during the breeding season. 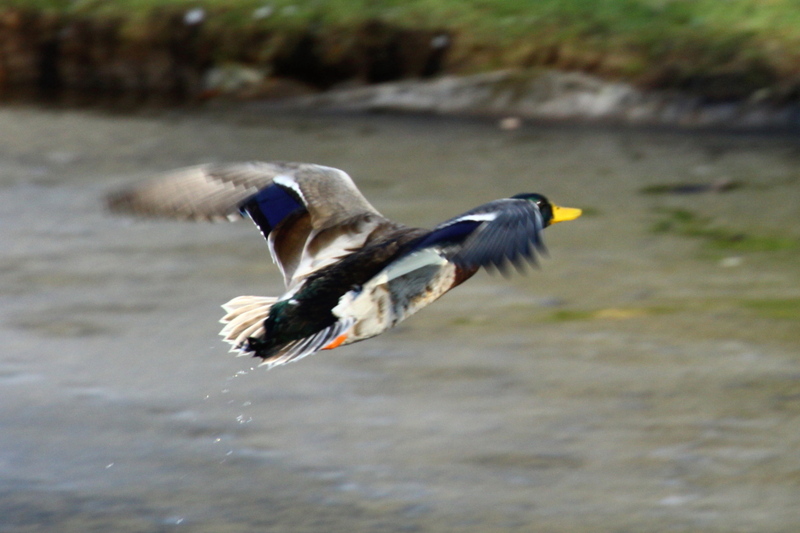 It can be characterized by its olive-green upper body, two bold yellow wing bars down the edge of its wing, and a deep blue-grey crown from which it gets its name. 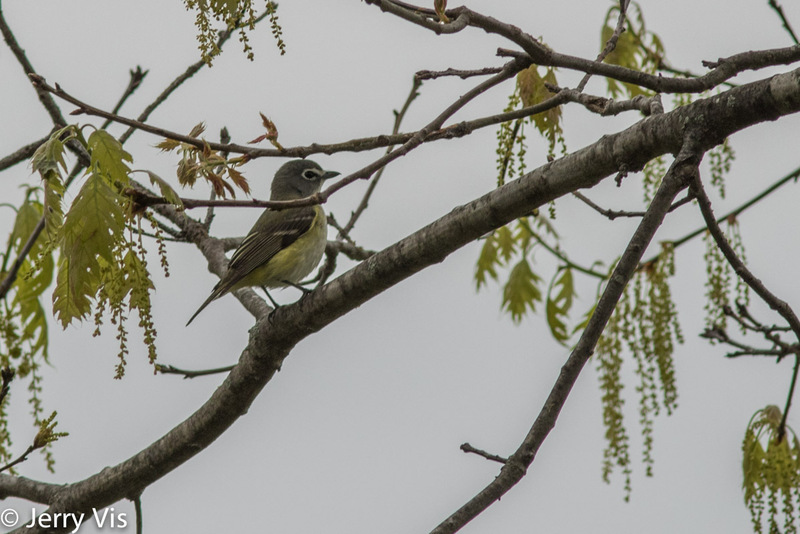 The juvenile plumage of immature blue-headed vireos is not distinct but very similar to the adult plumage. 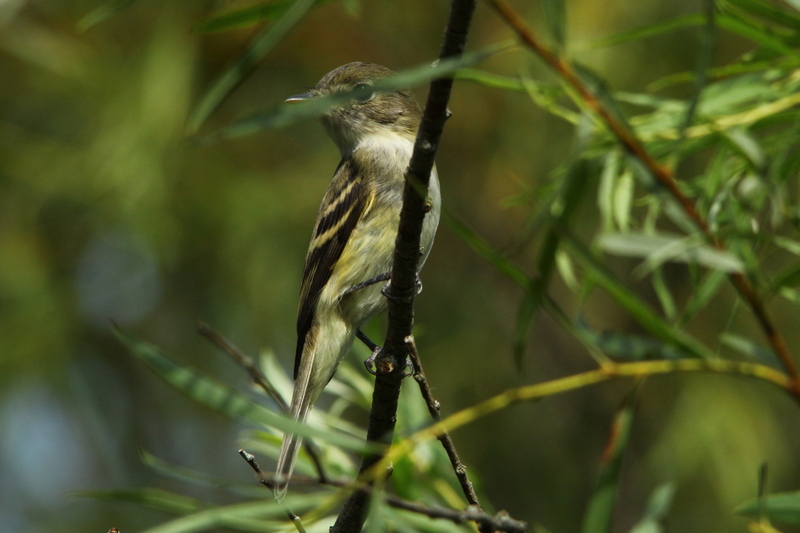 While this bird’s appearance is similar to the closely related Cassin’s vireo (Vireo cassinii), the Cassin’s vireo can be differentiated by its lighter yellow patches, a smaller, thinner bill, and a brownish-grey crown. 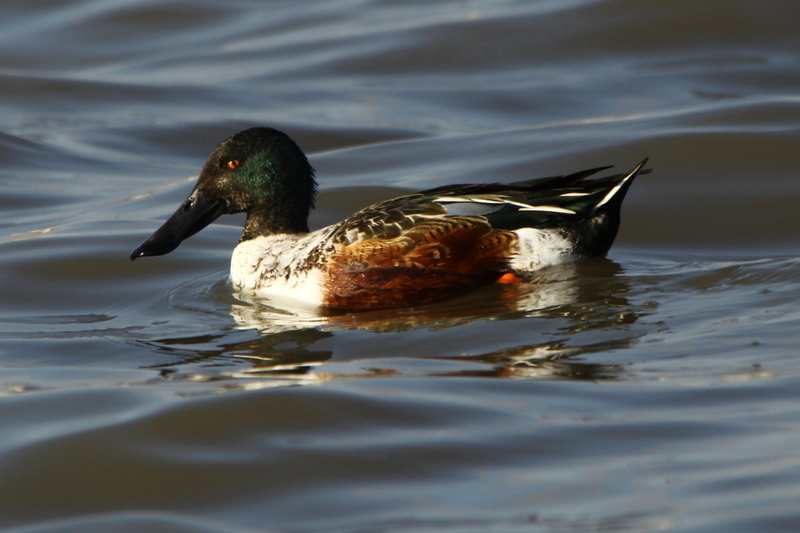 There is little to no sexual dimorphism between males and females as both are similar in plumage coloration and size. Like most Vireos, the blue-headed vireo is a relatively small bird with a length of 126–148 mm (5.0–5.8 in). 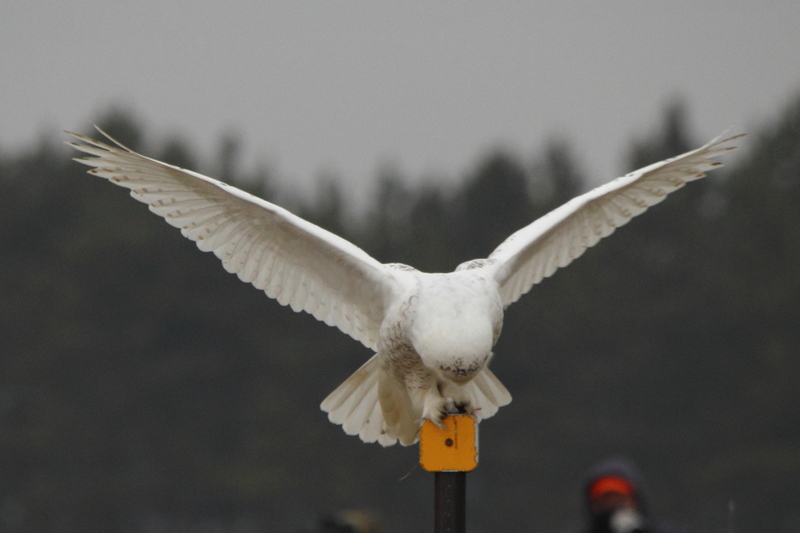 The wingspan is usually found to be around 200–240 mm (7.9–9.4 in) and their weight is typically 13–19 g (0.46–0.67 oz). The average lifespan of the blue-headed vireo in the wild has been measured to be approximately 7 years and 5 months. Native to North America, the blue-headed vireo enjoys a large breeding range that extends over an immense area of Canada and northern United States. The breeding range of V.s. solitarius extends from northeastern British Columbia across Alberta, Saskatchewan, Manitoba, Ontario and Quebec and down to southern Pennsylvania and New Jersey. 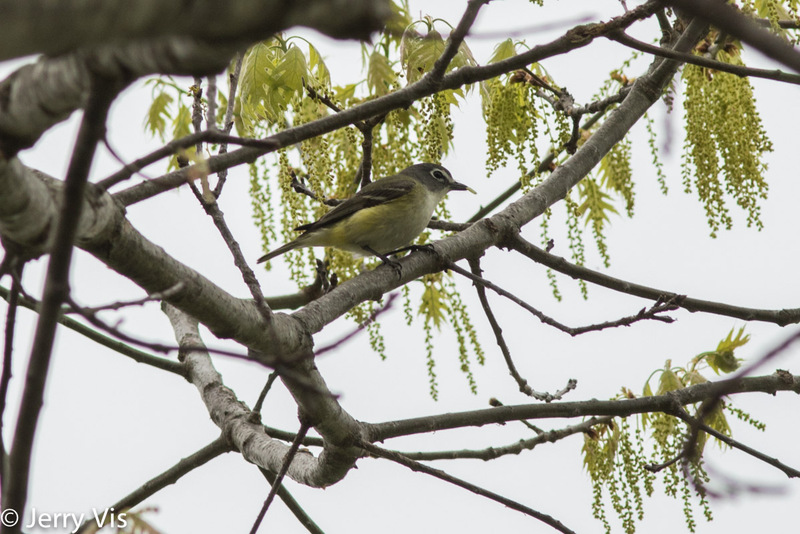 At the end of the breeding season, the blue-headed vireo migrates south to its overwintering area. 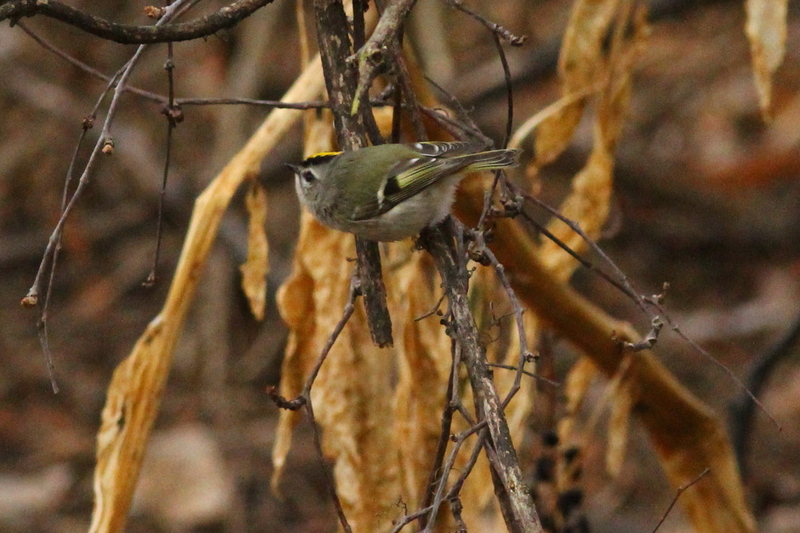 Blue-headed vireos prefer to breed in cool temperate forests, which in the southern part of its breeding range are found at higher elevations. 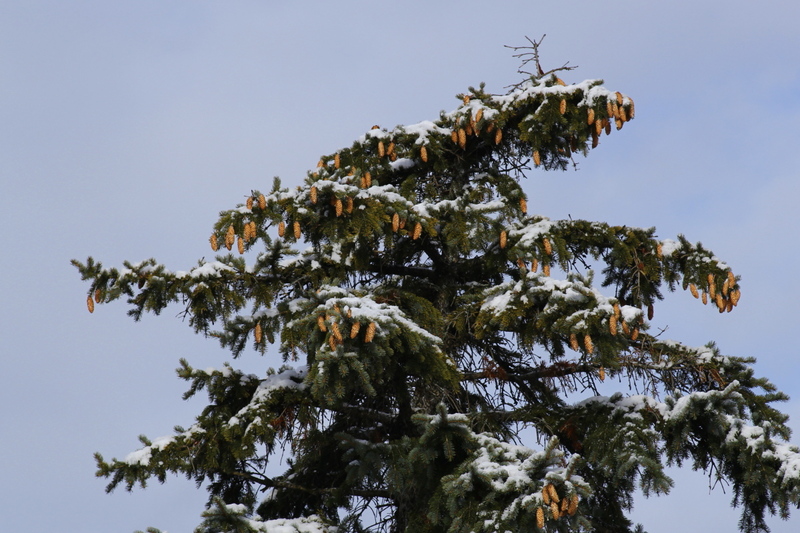 Evergreen forests with spruce, fir, hemlock, and pine mixed with deciduous growth such as alder shrubs, willow shrubs, poplar, birch or maple trees are the habitat of choice. 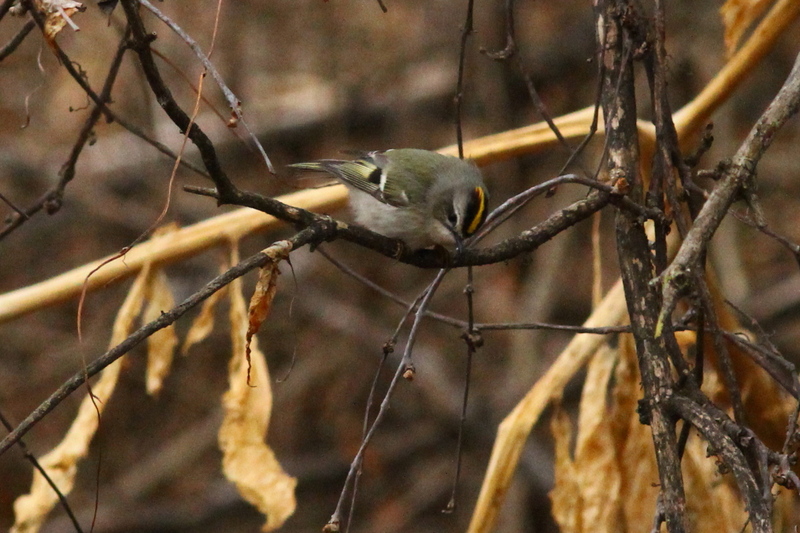 During the winter, blue-headed vireos inhabit mixed woods of pines and hardwoods. 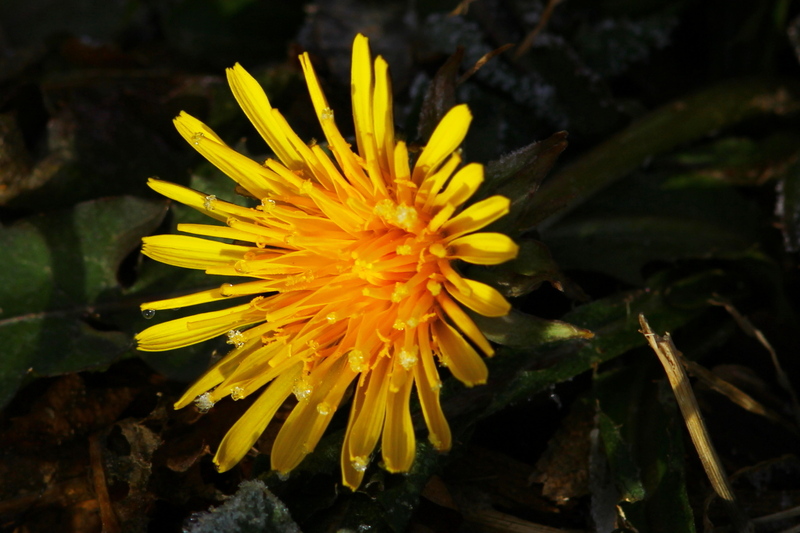 They are also found in coastal and flood plain swamps and low shrubby thickets. 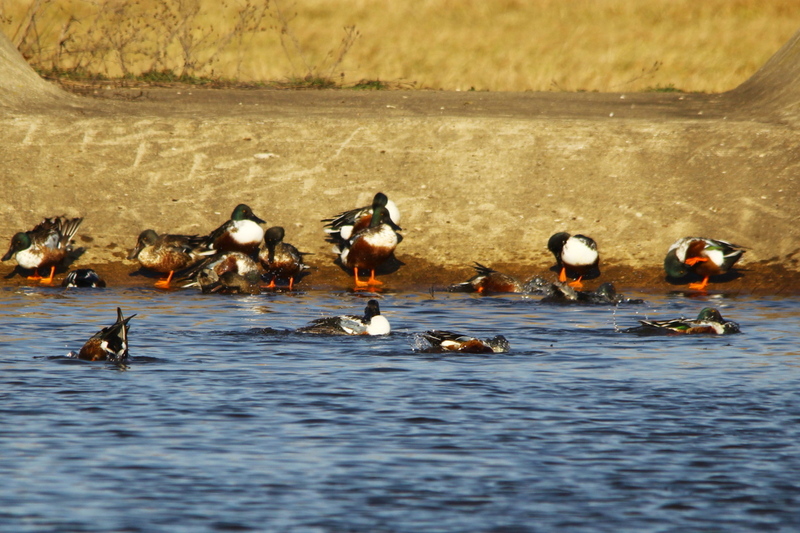 Year round, even during the breeding season, population density is somewhat low and spread out. 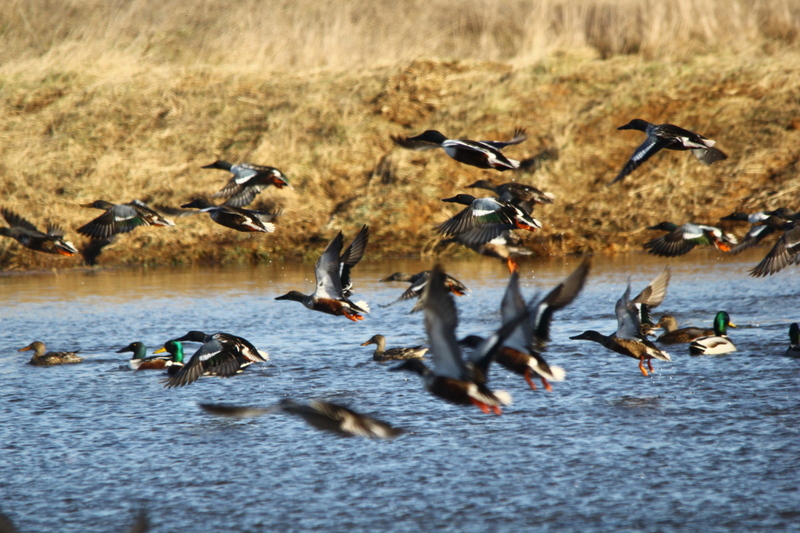 Overwintering population densities are usually found to be lower than in the breeding season. The density of the population ultimately depends on the type of forest being inhabited. During migration, blue-headed vireos are often found to flock with groups of different sparrow species but rarely with members of its own species. Blue-headed vireos are mainly insectivorous birds but are also known to eat fleshy berries and fruit. They are equipped with short, strong bills used for processing insect prey with a tough carapace such as beetles. 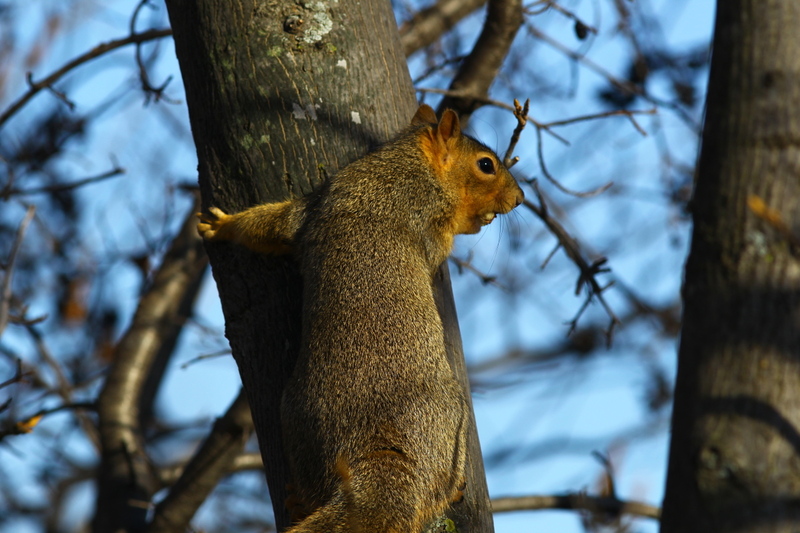 Foraging usually occurs in the mid level of trees. 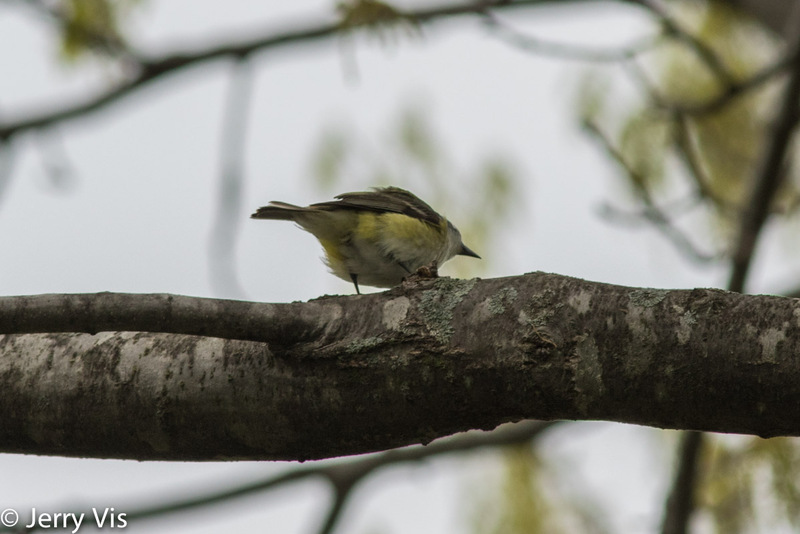 A foraging blue-headed vireo will hop from branch to branch on the same or to an adjacent tree and will then fly towards its prey to capture it. Typical prey consist mostly of caterpillars, butterflies and moths but may also include tree bugs, stink bugs, beetles, bees, ants, flies, dragonflies, grasshoppers, crickets, spiders and, on some occasions, snails. 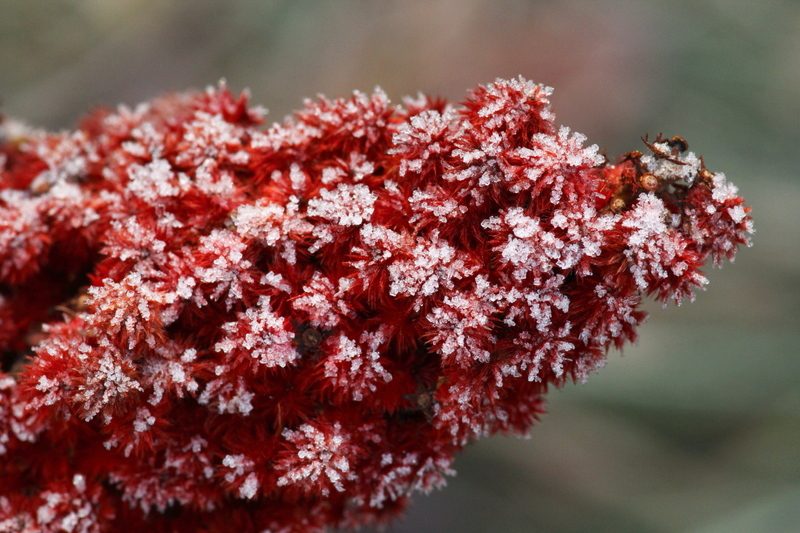 Fruit feeding occurs primarily during migration and overwintering, especially when overwintering in more tropical regions where fruit is more abundant or if the insect populations are low. This large and varied diet is an example of an opportunistic feeding strategy, allowing the blue-headed vireo to be plastic in its ability to adapt to resource availability. 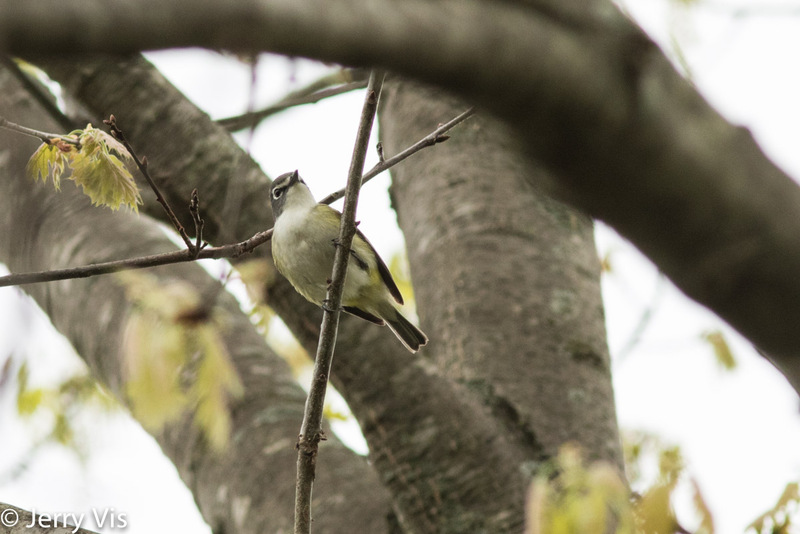 When arriving to the breeding ground in mid-April, male vireos will hold large, individual territories that can range from 1.5–6.6 hectares (3.7–16.3 acres). 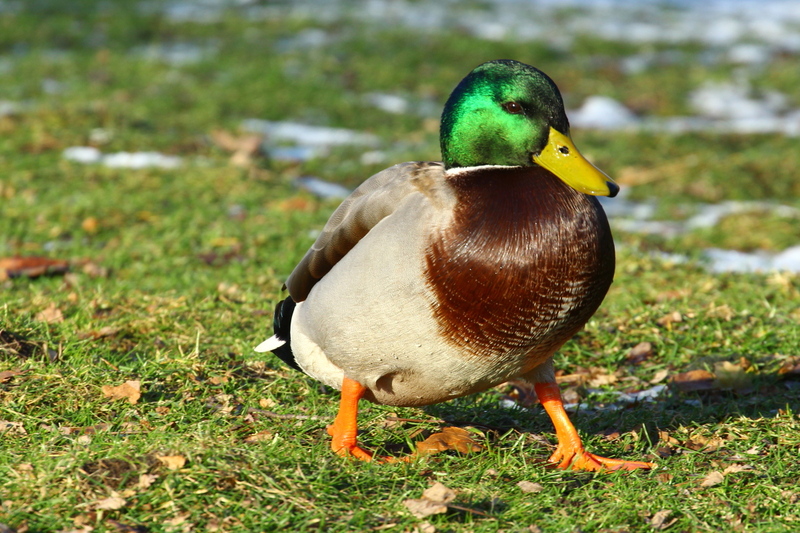 Females will choose a male to mate with depending on the male’s ability to defend and control a large territory. 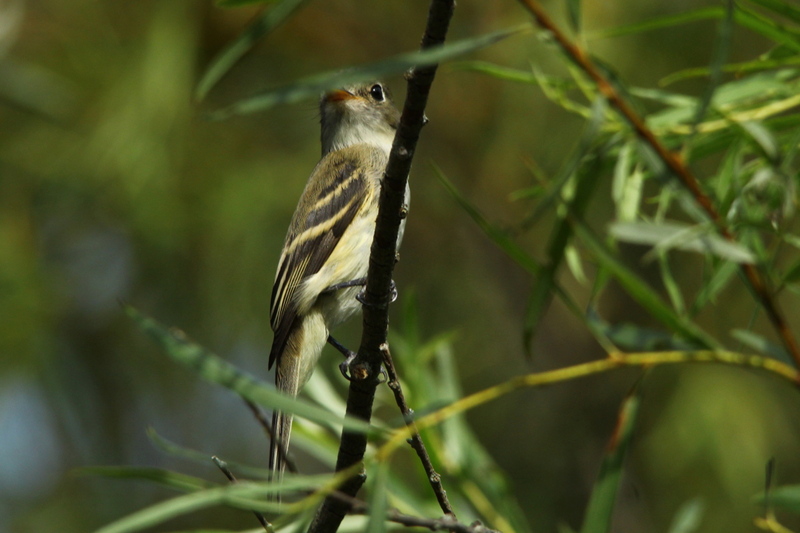 While defending their territory from other males, the male vireos will sing a primary song to attract females. 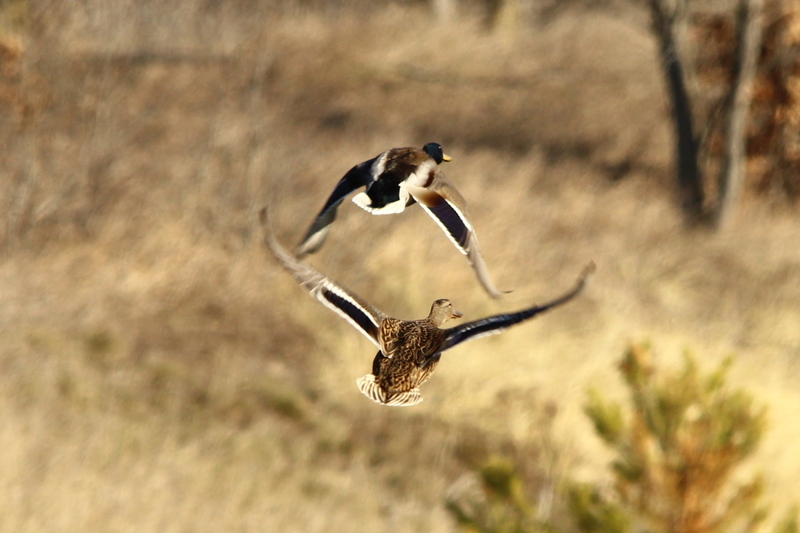 Undecided females can usually be seen flying along the edges of competing male territories; usually this will force the two males into direct conflict for the right to copulate with the female. Once a female has approached a suitable mate, the male will perform a series of mating rituals. 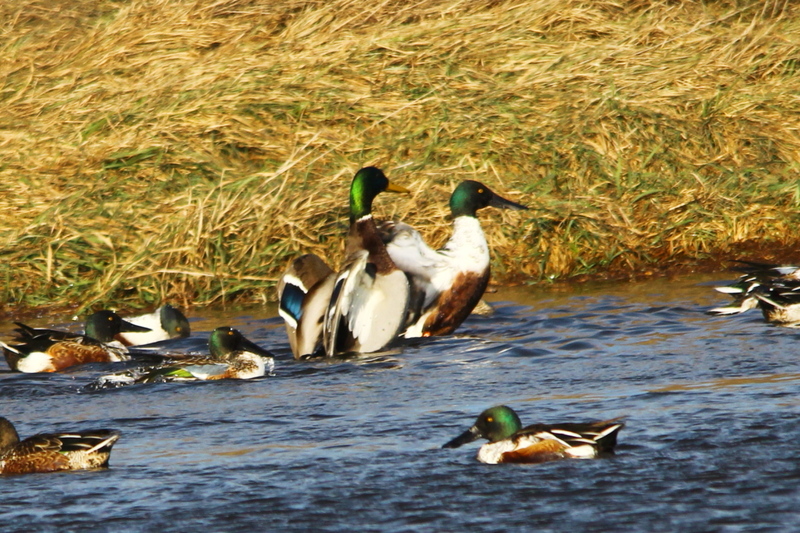 Typically, these rituals involve the male building a courtship nest for the female. The courtship nest is not a full nest but is most likely an attempt by the male to display his ability to gather resources. Once the pair is established, the courtship nest is abandoned. 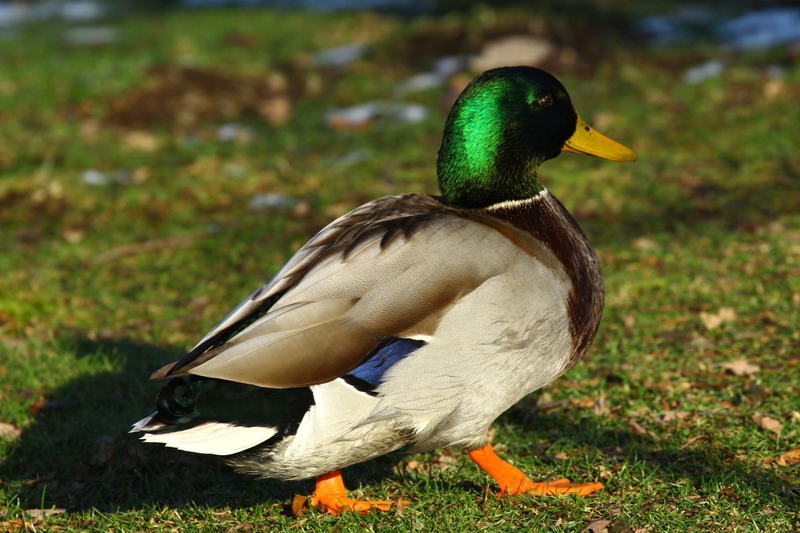 Mating does not occur for approximately 2 weeks after pair has been established. 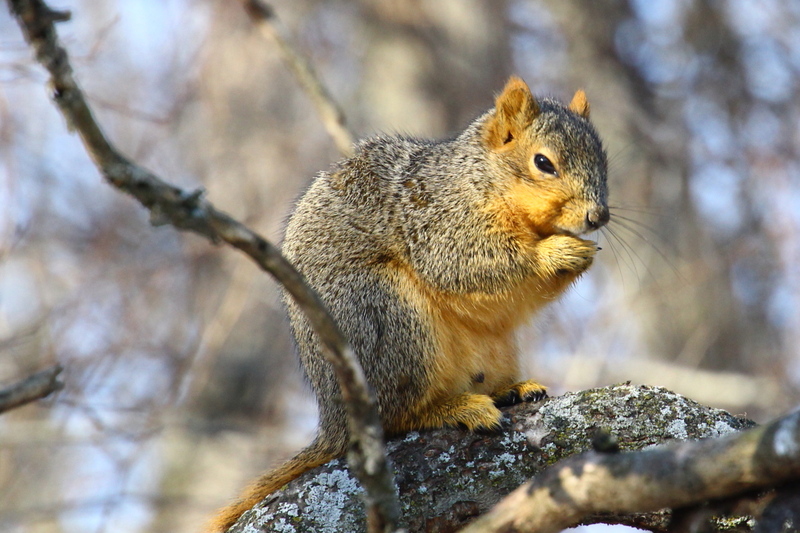 During this time, the male and the female will cooperatively build a breeding nest which is typically formed between forking mid-level branches of evergreen and deciduous trees and are composed of twigs and foliage. 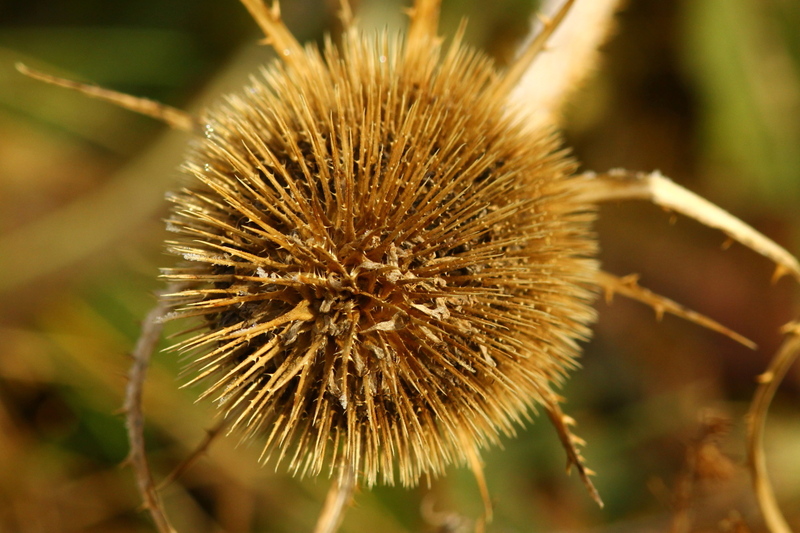 Breeding nests are not reused in following breeding seasons. 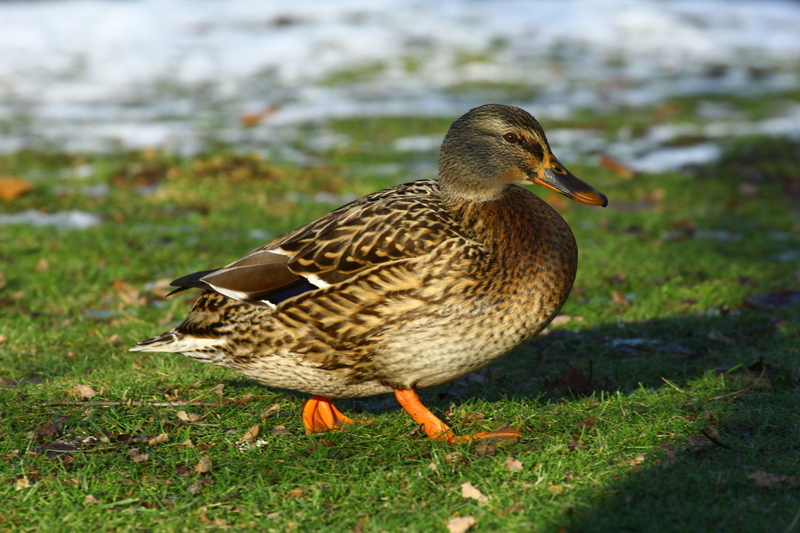 In one breeding season, a female will lay 3–5 eggs at a rate of 1 egg per day. Eggs are creamy white with brown or black spots and are 17–23.1 x 13.3–15.8 mm (0.055–0.075 in x 0.04–0.05 in). Eggs are incubated for approximately 14 days after being laid. 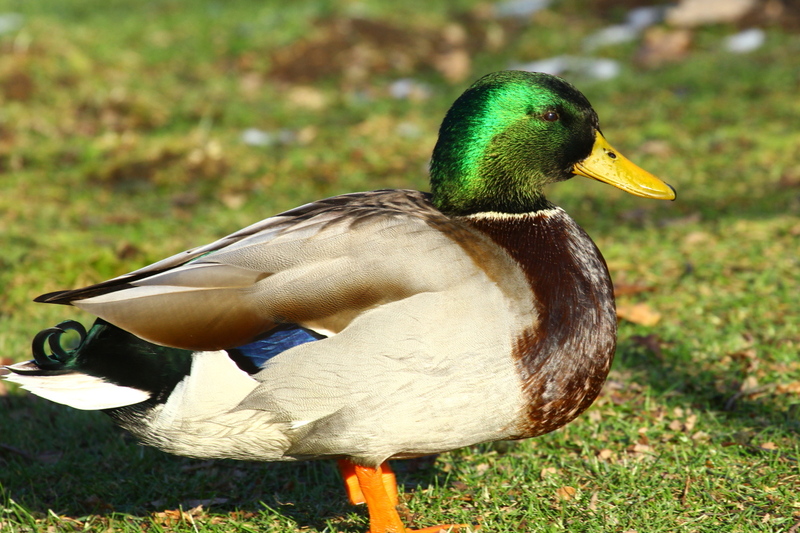 Once hatched, infants are highly altricial, often having little to no downy feathers. Infants open their eyes during day 5 or 6 and will begin to fledge after 14 days for a total chick-rearing period of 28 days. 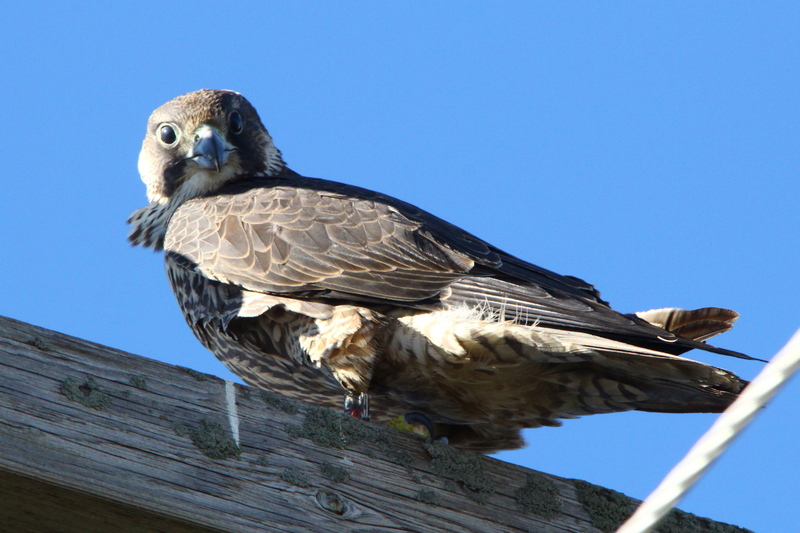 Once the young are able to leave the nest, the parents will split the juveniles and separate. 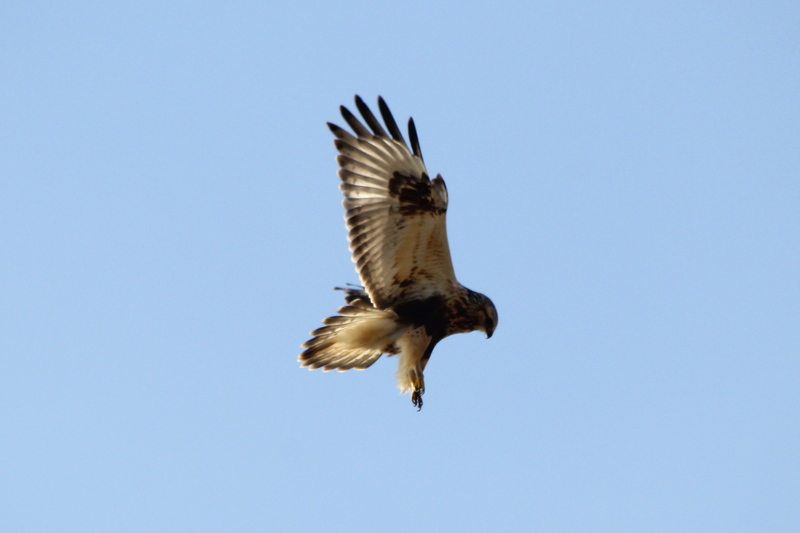 Juveniles are usually dependent on the parent to provide food for approximately 1 month after leaving the nest. 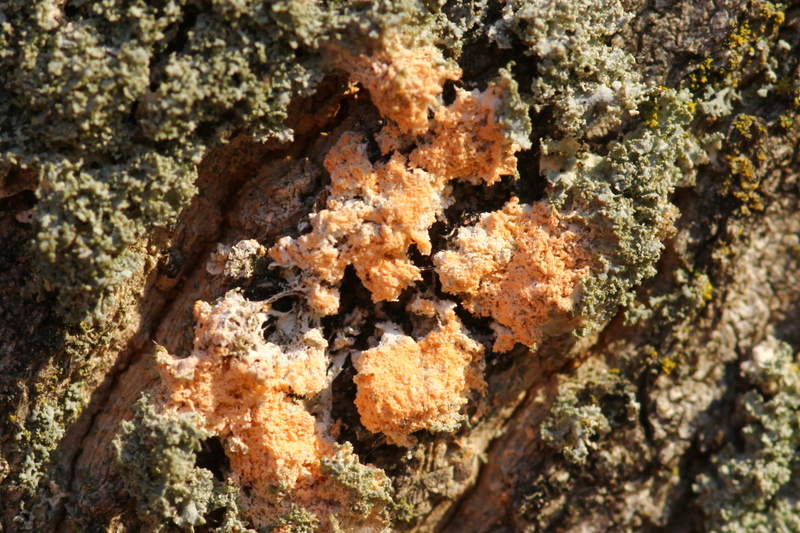 If the nest is destroyed or a mating pair produces a failed brood, an attempt to re-nest may occur but this ultimately depends on when the brood fails. 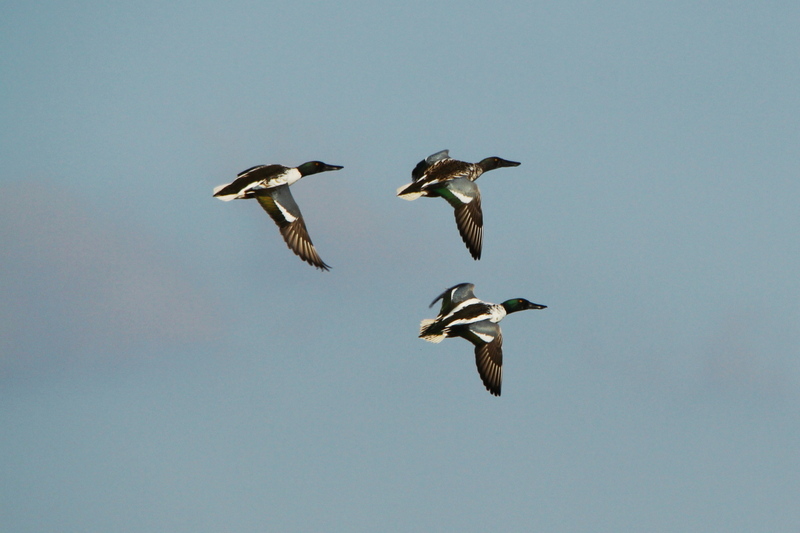 If the brood fails early on in the season, there is a higher chance that the pair will re-nest, if later, the pair will often separate and not attempt a second brood. Blue-headed vireos have a low nesting success rate, with about 10–30% of hatchlings surviving. Common predators of the blue-headed vireo eggs and chicks include blue jays, crows, and squirrels. Often, when a nest is attacked by a blue jay, the male and female will execute coordinated attacks on the approaching predator. This usually involves one partner swooping towards the blue jay while calling the mate who will then execute a second attack. Blue-headed vireos have also been known to nest close to nesting raptorial birds that do not prey on them. It is thought that they use the raptors as protection from squirrels that are, in turn, hunted by the these bird of prey. The largest contributor to the low nesting success rate of the blue-headed vireo is most likely the parasitic brown-headed cowbird. These birds will often lay their large eggs over the top of the existing brood, causing the parents to feed the cowbird which will ultimately starve the infant Vireos. This is number 169 in my photo life list, only 181 to go! 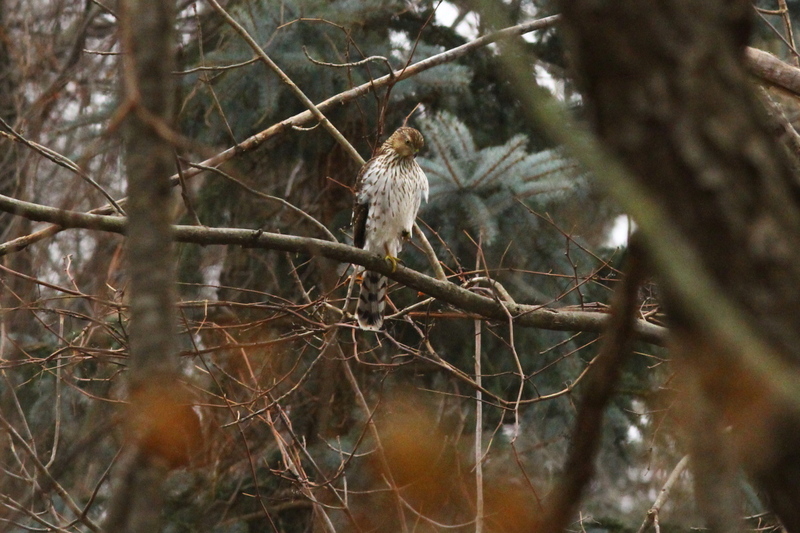 This post is about a trip that I made to Muskegon on December 6th, and I have to ask myself, am I getting spoiled by all the somewhat rare birds that I see so often? Maybe the better way to phrase the question is am I getting spoiled by everything that I see in nature that few people get to witness in a lifetime? 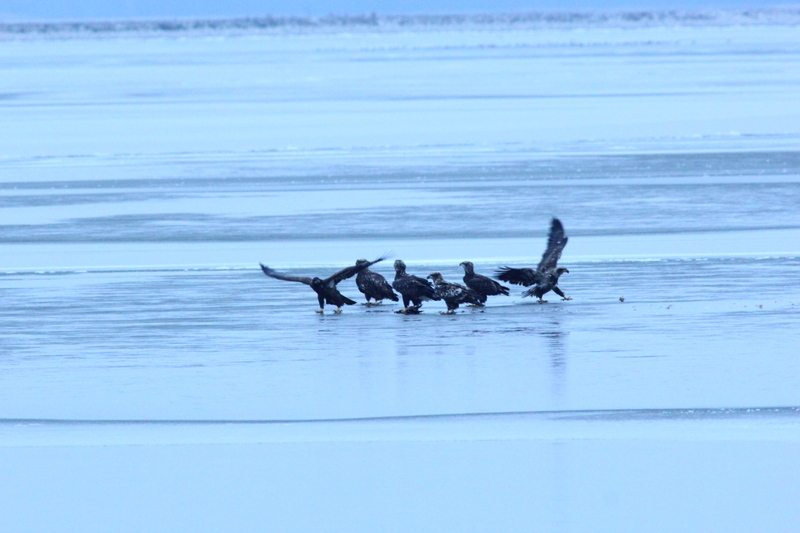 Seeing a bald eagle isn’t as rare of an occurrence as it used to be here in Michigan, but how many people ever see seven eagles together squabbling over a kill? 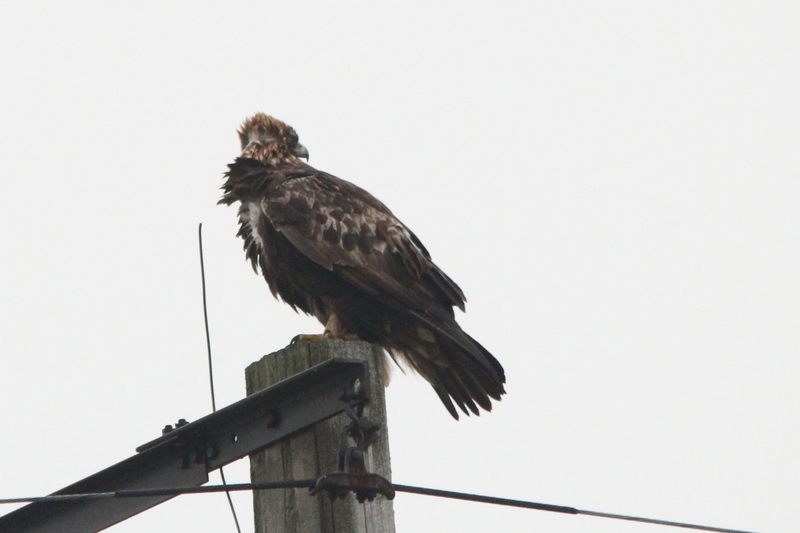 Or, as in my last post, get photos of bald eagles, a golden eagle, snowy owl, snow bunting, rough-legged hawk, and a red-tailed hawk all in the same day, no matter how poor the quality of the photos were. 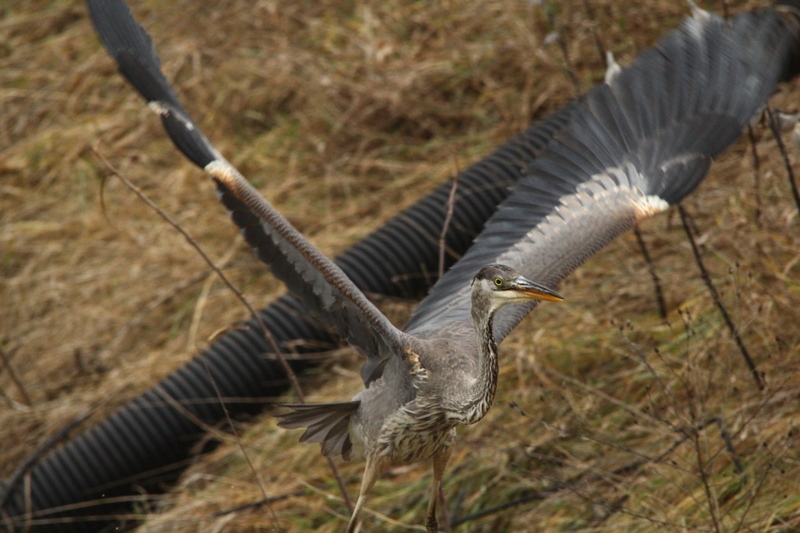 And speaking of my photos, I was thoroughly disappointed in the quality of them in my last post, except for the heron in flight, and most of the photos that will appear in this post. Warning: One of my long-winded rants is to follow! 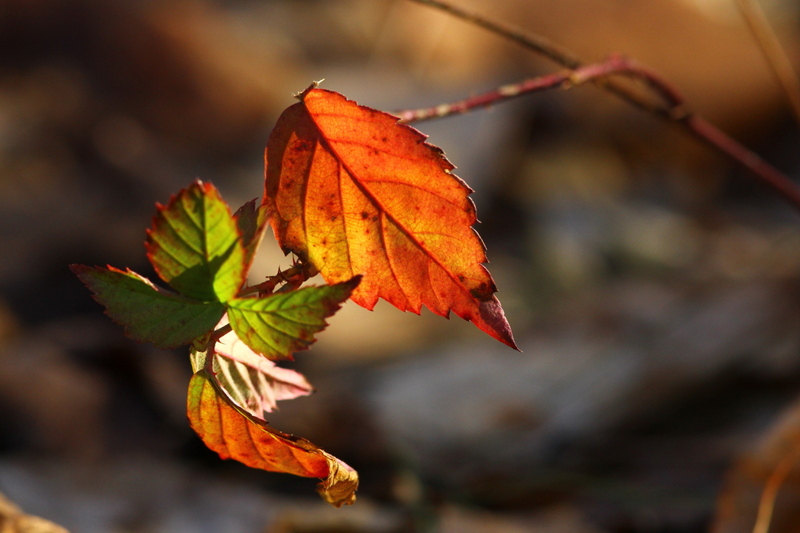 As you know, I’m planning to purchase a Canon 7D Mk II early next year, in hopes that it will improve my images. To make sure that I’m making a wise purchase that will actually help me to improve my photos, I have been watching some online video reviews of that camera. That may well lead to another rant, but I’ll stick to just one right now. One of the videos that I watched was titled something along the lines of “Photographing wildlife using the new Canon 7D Mk II”, so I thought that I would find it helpful, not really. It turned out that some guy who worked for an online photography magazine, and didn’t seem to know much about photography, joined one of Canon’s paid professional wildlife photographers with pre-production versions of the 7D Mk II. They didn’t go to some wilderness location to shoot actual wildlife, they went to an animal ranch where they shot semi-tame mountain lions and wolves. They were out at mid-morning, with great lighting, and first a handler brought out a mountain lion and fed it treats to keep it performing for the photographers, who didn’t have to worry about bad lighting or the big cat running off. Next up, another handler brought out two wolves, and fed them treats to perform for the photogs, who were just a few feet away from the “wildlife”. The longest lens the photographers used were 70-200 mm. I was thinking, that’s not the real world as far as wildlife photography that I know and do, any one can shoot good photos under the conditions that were shown in this video. 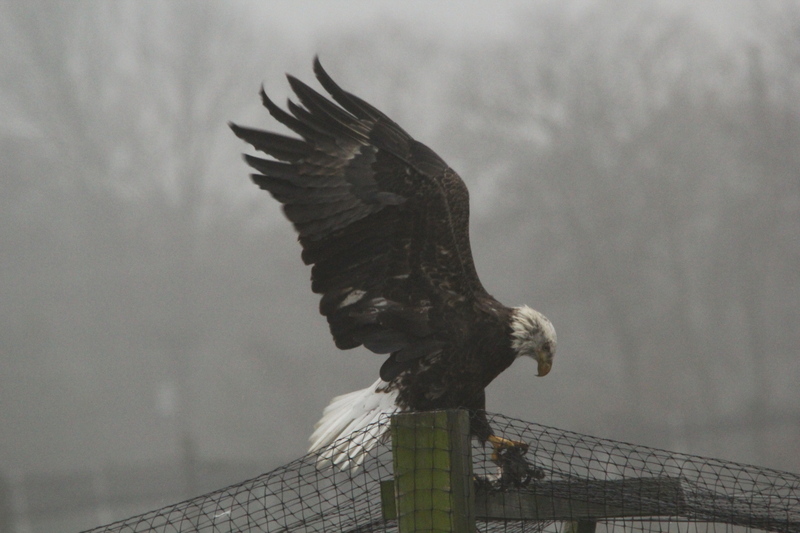 That video isn’t the only one that I’ve watched where the “wildlife” photographers were shooting in a controlled environment, another example is that many of the great images of raptors are shot at rehab centers for the raptors. The photographers can use a short lens, stick the camera right in an raptor’s face, and shoot away. They have the bird positioned for the best possible light and background, so of course they get great photos. In fact, the more that I try to learn how the experts get such great photos, the more that I learn that most of them shoot in at least somewhat controlled circumstances these days. I think that I read or heard of one award-winning wildlife photographer being “busted” for having shot many of his images at zoos. Well, I really don’t see much difference between shooting at a zoo, a raptor rehab center, or an animal ranch were trained wildlife is trotted out to perform for photographers. So, the question is, how can I attempt to get photos of equal quality when I’m chasing totally wild critters as they go about their business? I can’t, although I’m always disappointed in that. I suppose that I’ll always be trying, even though logic tells me that it’s a losing battle. However, that brings up something else, the dichotomy within myself. On one hand, I want to shoot the very best images that I can, on the other, I love watching wildlife in “action” and capturing those moments to share with others who never get the chance to see what I do. 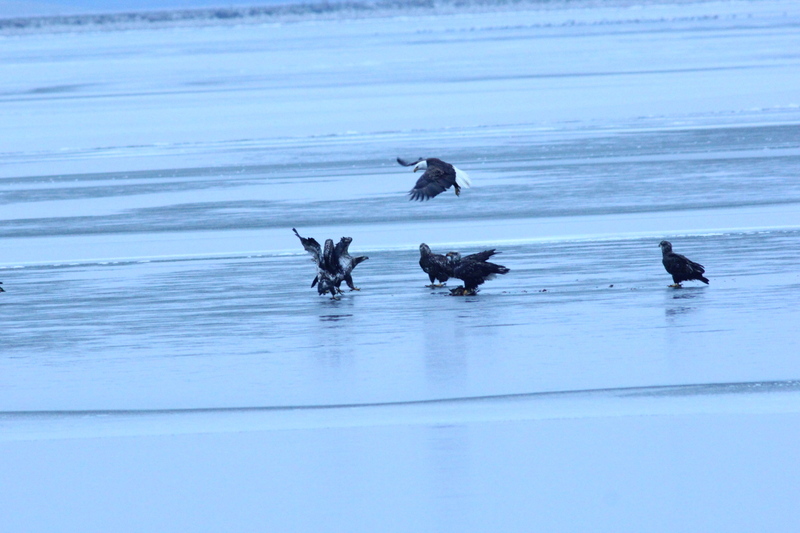 Here’s an example of that, how many people have seen a bald eagle slip and fall on the ice? Watch the eagle on the far right. Notice all the other eagles watching the one fall. Okay, that may be stretching it, but the eagles were very vocal, especially in this next sequence. 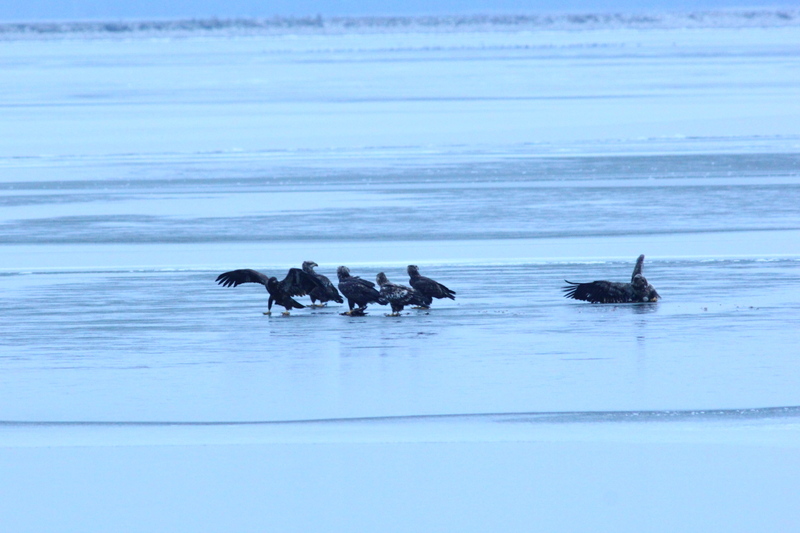 In the flock, there was one adult, with the rest of the eagles being juveniles of varying ages. 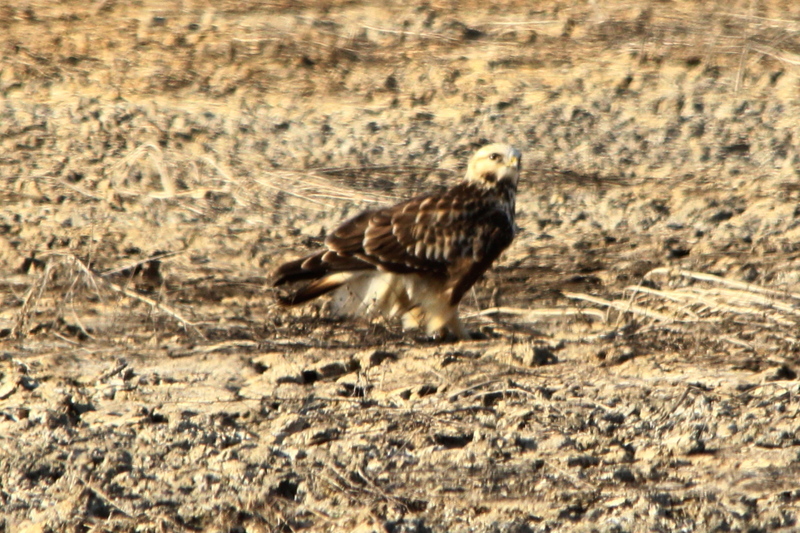 I think that the juvenile eagle with the kill was one of the adult’s offspring, and that the adult tried to chase the other juveniles off in this series. 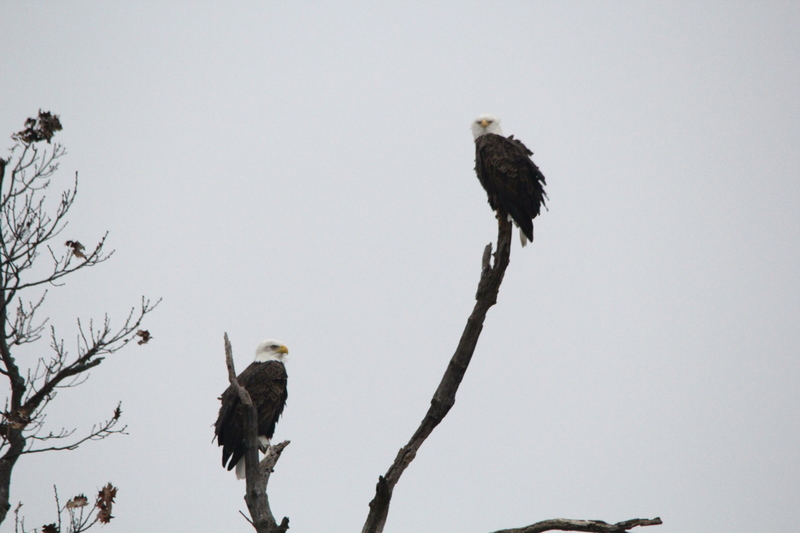 Notice the postures of the other eagles. 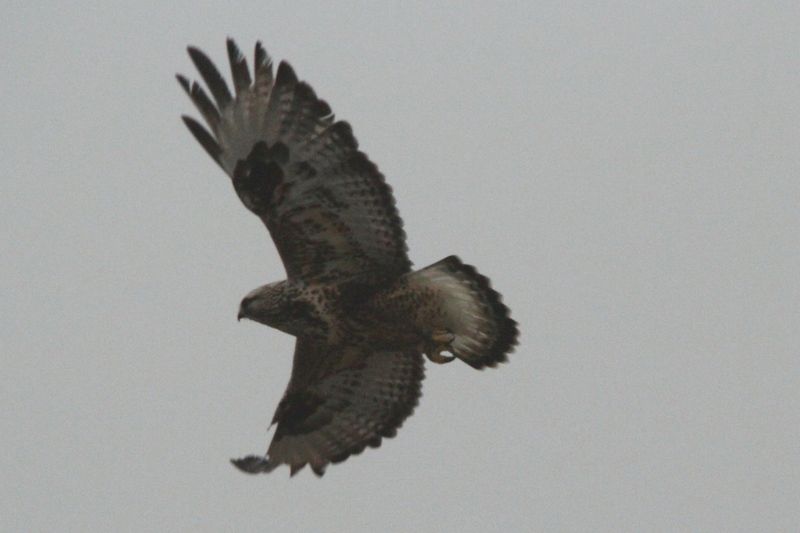 The adult was using the wind to provide most of the lift to keep it airborne, it hardly flapped its wings at all. 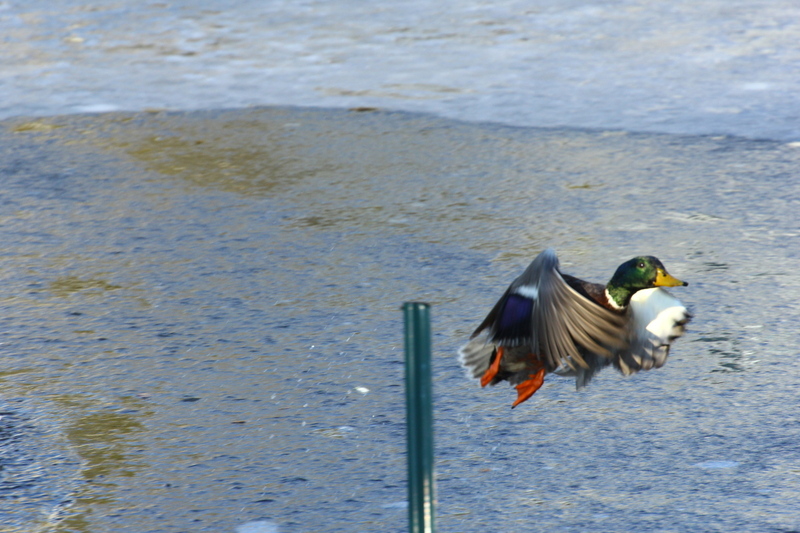 …where it made a very graceful landing on the ice. 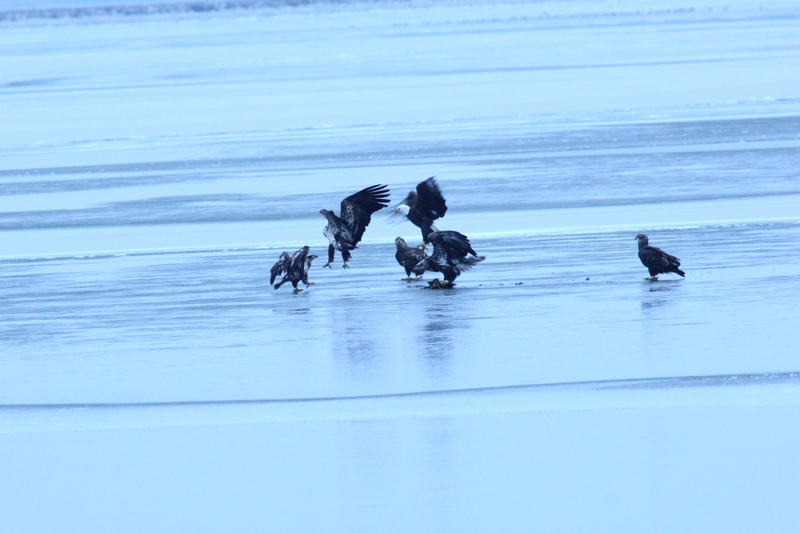 I also had photos of the adult skating across the ice by spreading its wings and letting the wind blow it across the ice, and a series of one of the other juveniles attempting to chase the one with the kill away from the food. But, the question is, how interesting would people who read my blog find those photos, when there are so many of the same flock of eagles? Another question is, how could I improve those photos? Well, I could have gotten the white balance correct for the conditions at the time. Those were shot just as daylight was providing just enough light to let me shoot those with the Beast (Sigma 150-500 mm lens), and the images were not cropped at all. 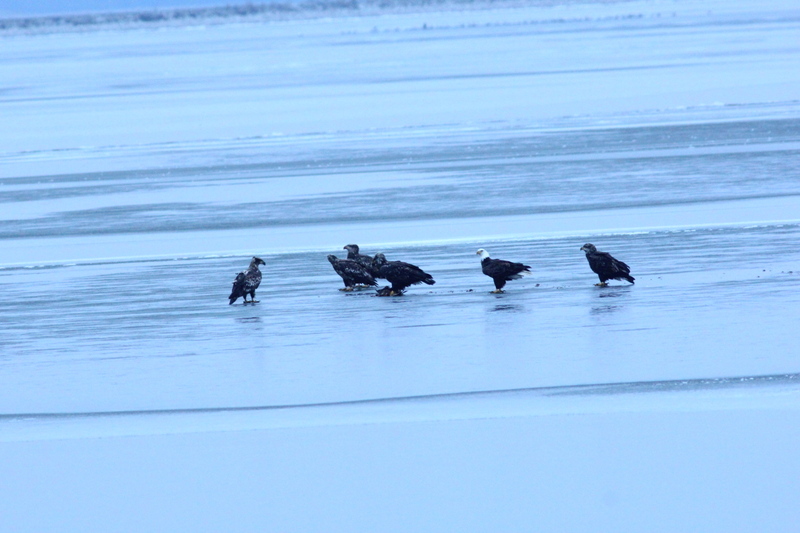 I suppose that I could have cropped a little, but the main point was all the eagles together on the ice. At least I got the white balance better on those than my first shot of the morning, an eagle flying over a flock of several thousand Canada geese. 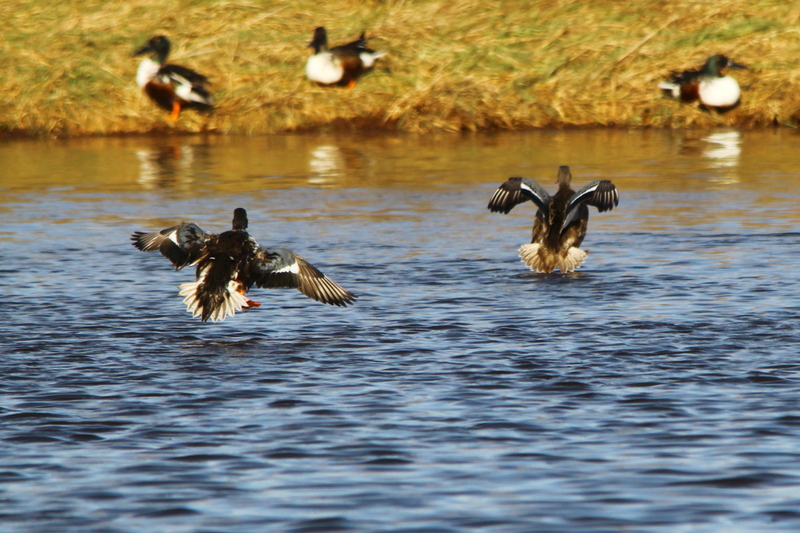 In my defense, I had anticipated a sunny morning, so I had my cameras set to sunny for white balance, and didn’t have time to switch the setting in time to capture the eagle over the geese. All that ice didn’t help either, turning everything blue, I suppose that I may have been able to fix that with software, we’ll see in a few months. This is one time when setting the white balance to auto may have been the best choice, as I tried both the cloudy and shade settings, and everything still looks too blue because of the early morning light on the ice. 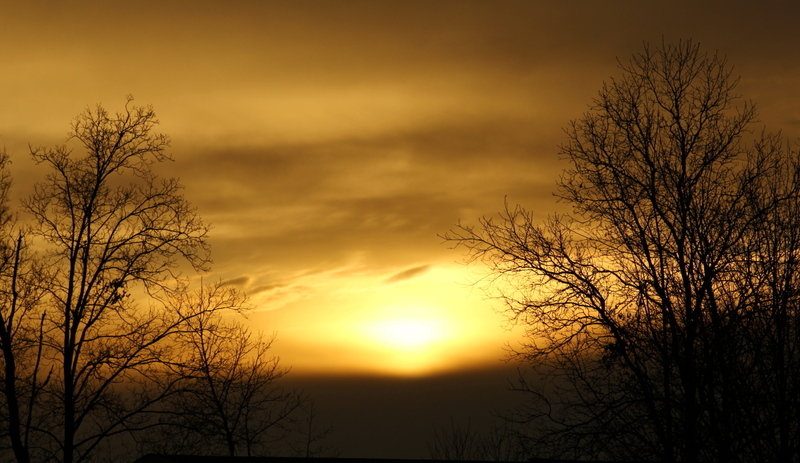 And, since it was daybreak as I shot the flock of eagles, the light was changing rapidly, as you’ll see. 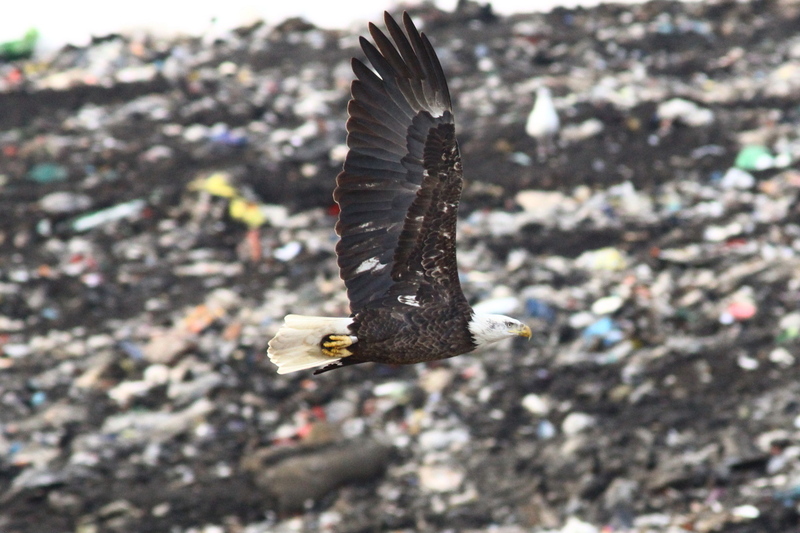 This is one of those bad photos that I love, the eagle with the kill decided that it had enough of the other eagles trying to take its food away from it, and took off hoping to find some peace and quiet. 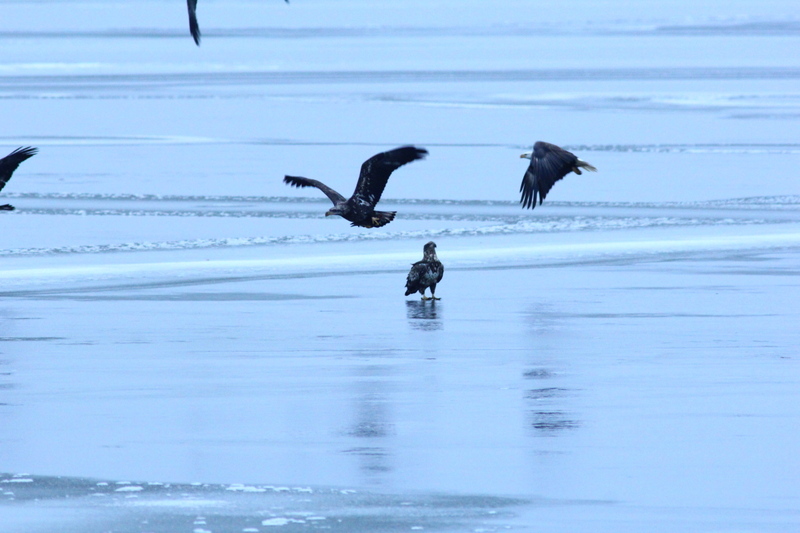 As all the other eagles were taking off, one was left standing on the ice watching the others as if asking “Hey, where is everybody going?”. 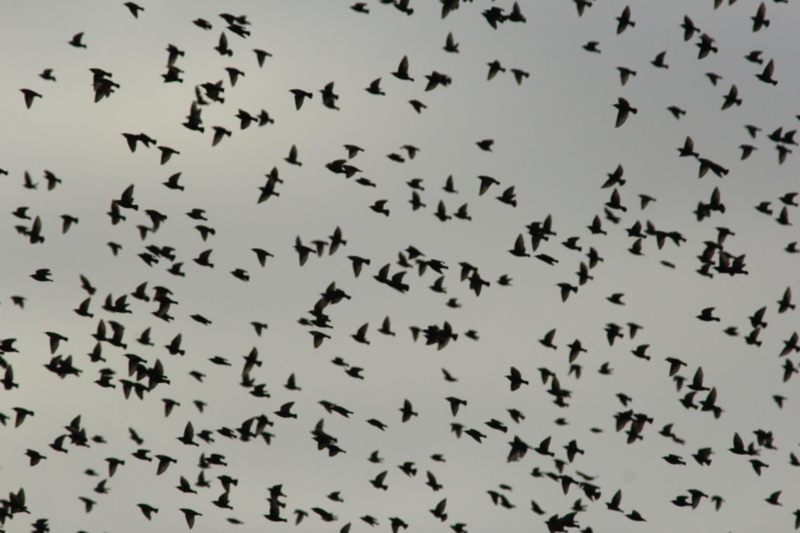 …and eventually, the entire flock. 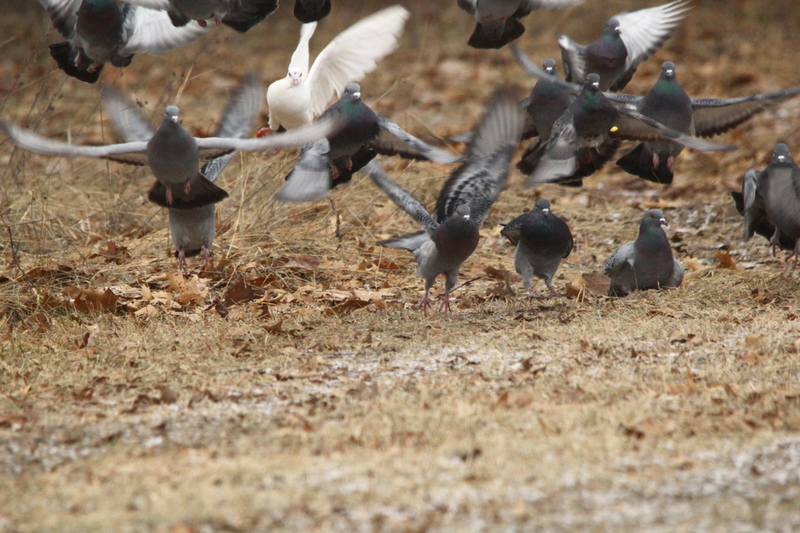 The one with the food landed, and the squabbling began all over again. 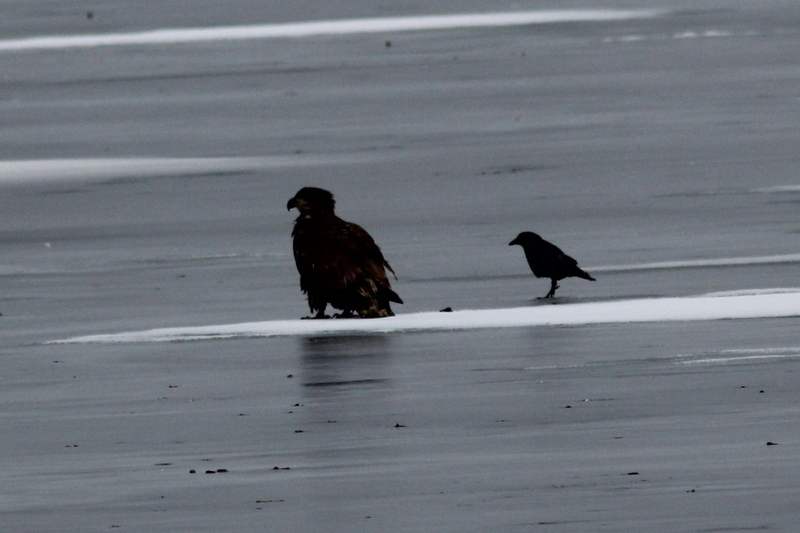 These next two images, while very poor, show how brave, or foolhardy, a crow can be. 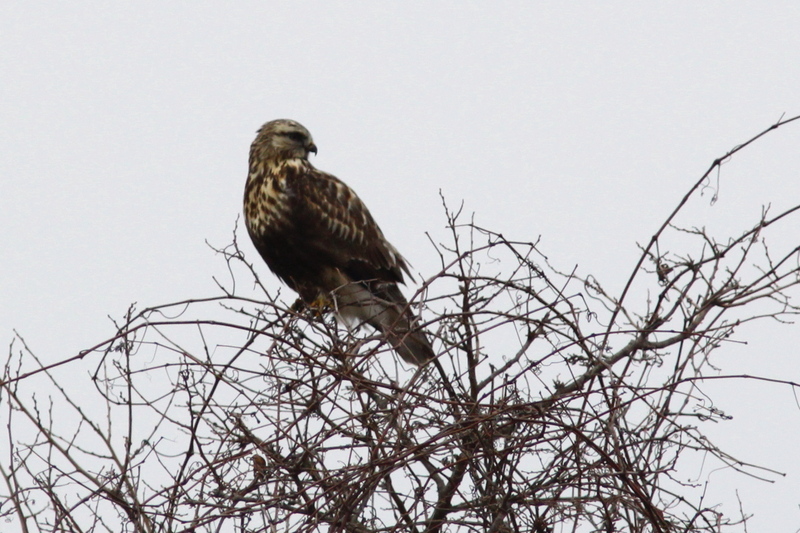 I’m not sure, but I think that the eagle is the golden eagle, but the light was too poor for me to be able to make a positive ID. It doesn’t matter, either species of eagle could have had the crow for breakfast if it were a mind to. 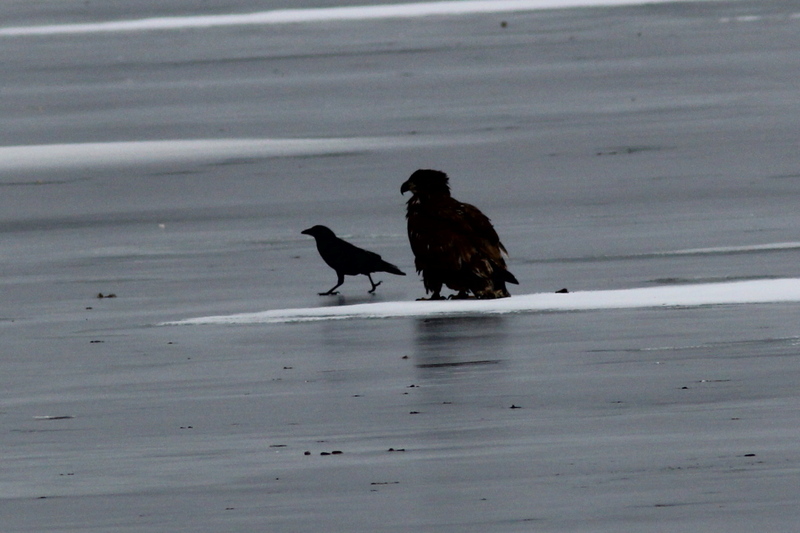 So, how did the crow know that it was safe to walk that close to the eagle? 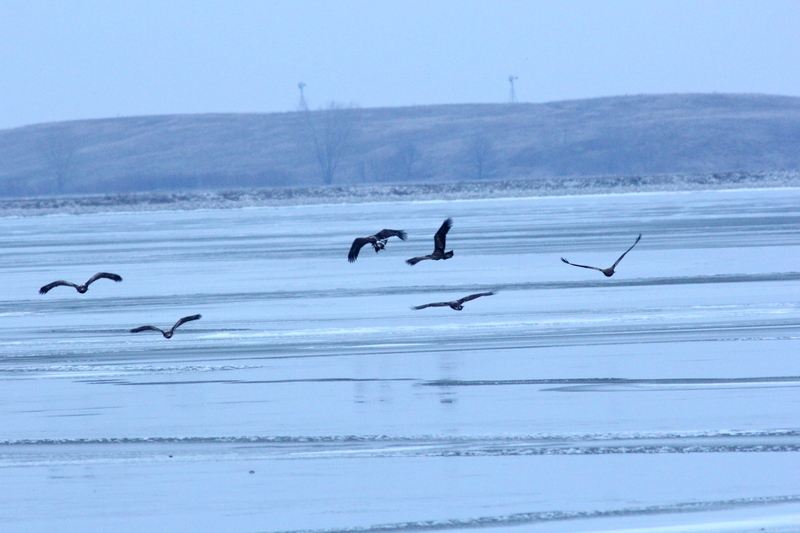 I drove over to the Swanson/Laketon fields in hopes of finding some snow geese, no luck there, but there were four more eagles there as this poor photo shows. 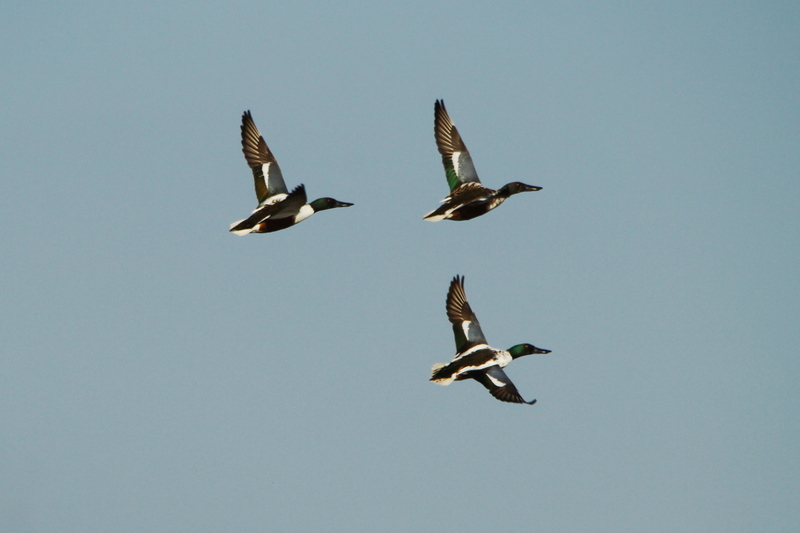 I know that these four can not be part of the flock on the ice, there’s no way that they could have flown past me without my having seen them. 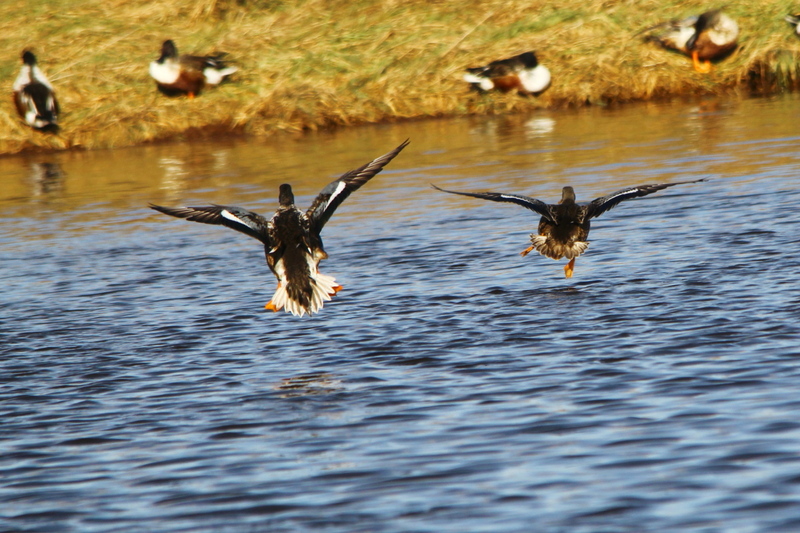 Besides, I shot poor photos of one of those four flying past me, coming from the opposite direction of where I had left the flock of seven just a few minutes before. 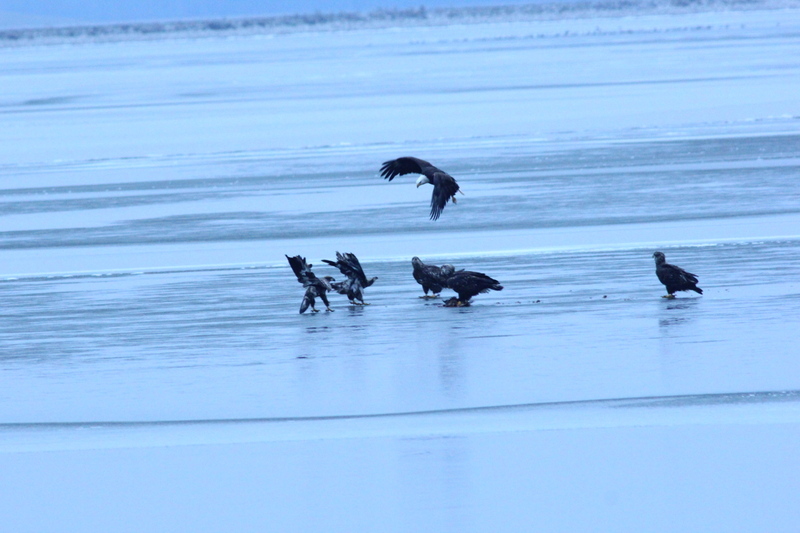 So, that’s thirteen eagle seen so far, the seven fighting for food, the eighth on the ice, out of the frame, the eagle with the crow walking past it, now these four. But still, no photos that I would consider to be very good at all. 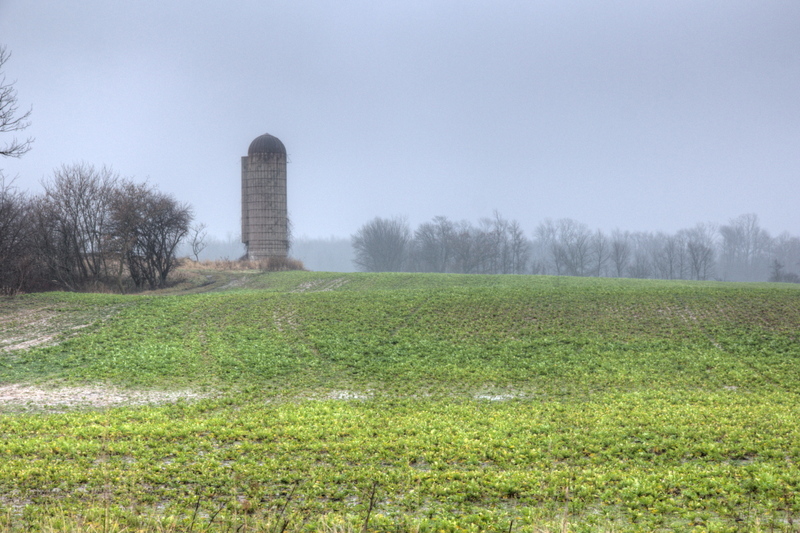 While at the Swanson/Laketon fields, I shot my favorite silo to capture the mood of the morning in a HDR image. 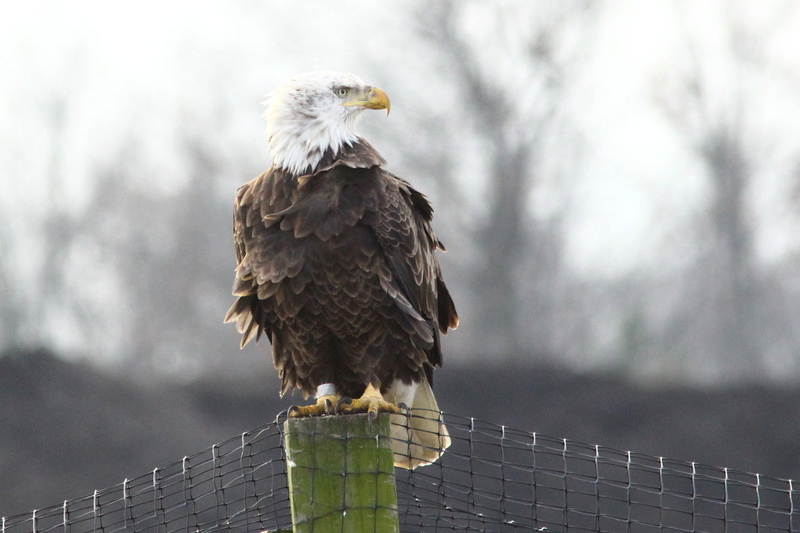 The 14th eagle of the morning let me shoot a few better photos, this is the same eagle on the same fence post as in my last post. You may be able to tell that I had to shoot with the eagle between myself and the early morning sun, and that I moved around, trying to get the best light and background. You may also be able to tell that it was a bit windy. 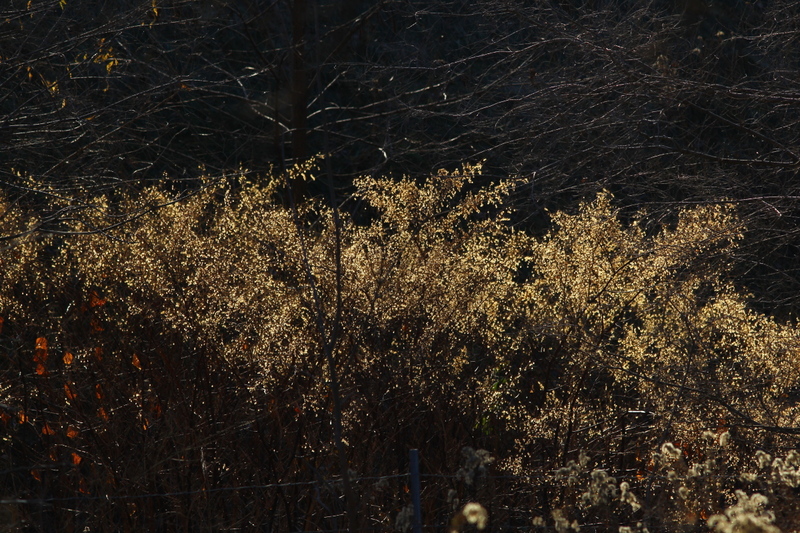 As I was shooting the eagle, a huge flock of starlings flew past, resulting in this horrible photo. 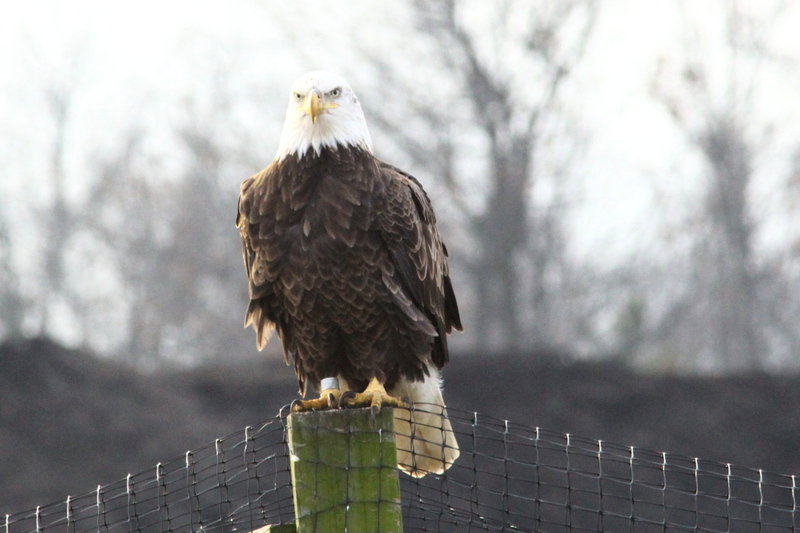 My only reasons for including it is to show what I saw, and when I returned to photographing the eagle, I could tell that it was unhappy about being upstaged by a flock of starlings. 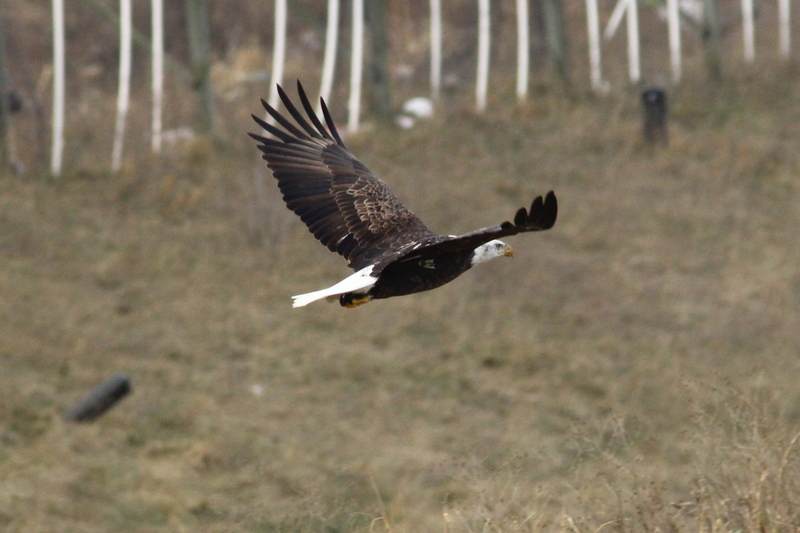 Then, it gave me my best photo ever of a bald eagle in flight, sort of. These two have not been cropped at all. Just my luck! 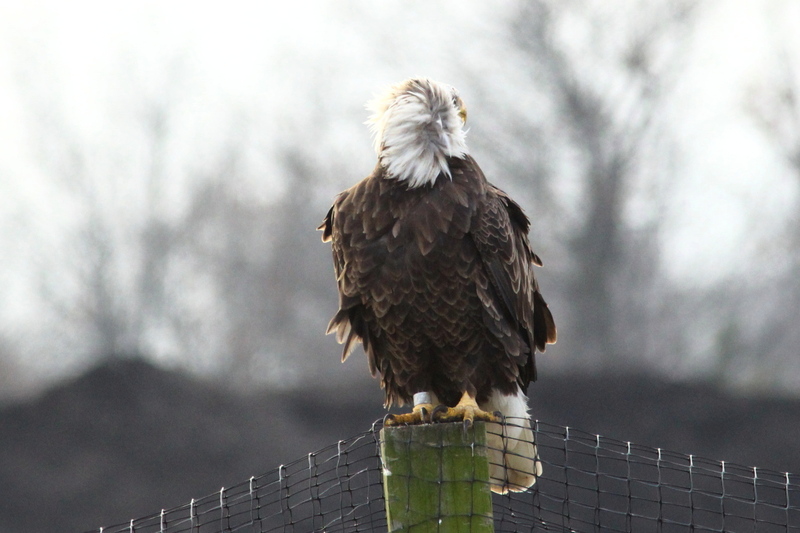 This eagle has chosen a fence post that borders the county landfill as one of its favorite places to perch, and when I catch the eagle in flight, it’s with the landfill in the background, sigh. That gets back to how I began this post. On one hand, I had eagles up the wazoo, up to fourteen at this point, and I saw plenty more over the course of the day. But, as the day went on, it was too difficult to keep track of which ones I had already seen, and which ones were “new”, so I stopped counting. 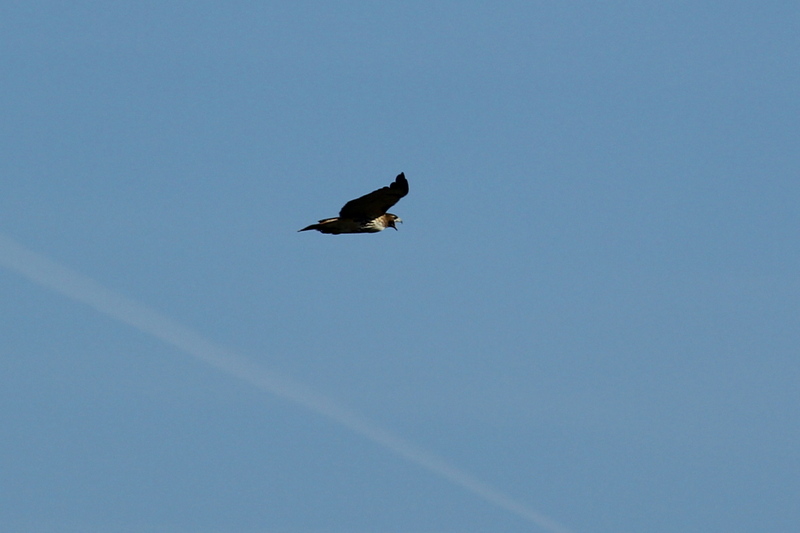 On the other hand, I saw fourteen eagles and got only fair shots of one of them, with bad lighting and background. 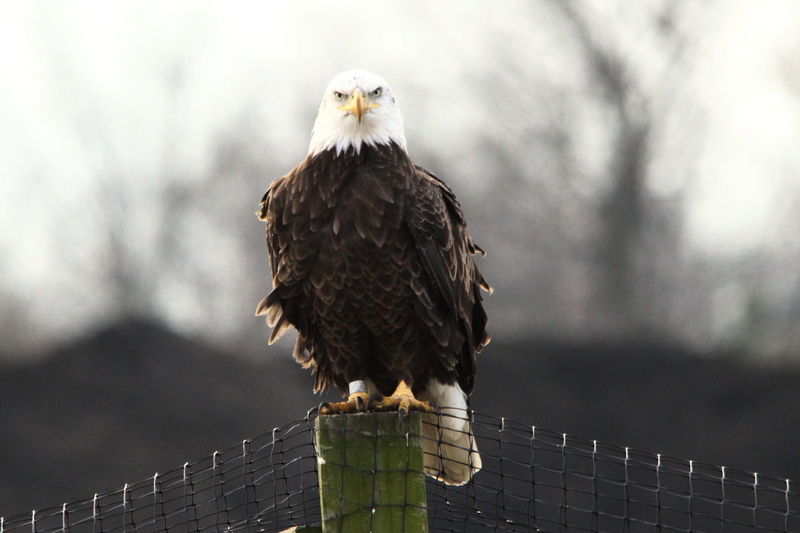 I could have easily gone to the Blandford Nature Center, where they rehab raptors, and shot great images there without having to work for the photos. 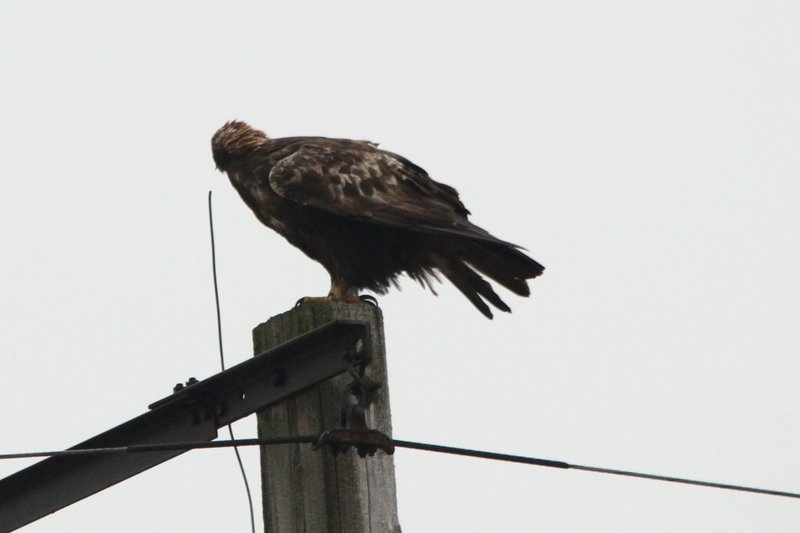 I also tend to forget that most people never see fourteen (or more) eagles in a year, let alone one day, but that’s Muskegon for you. 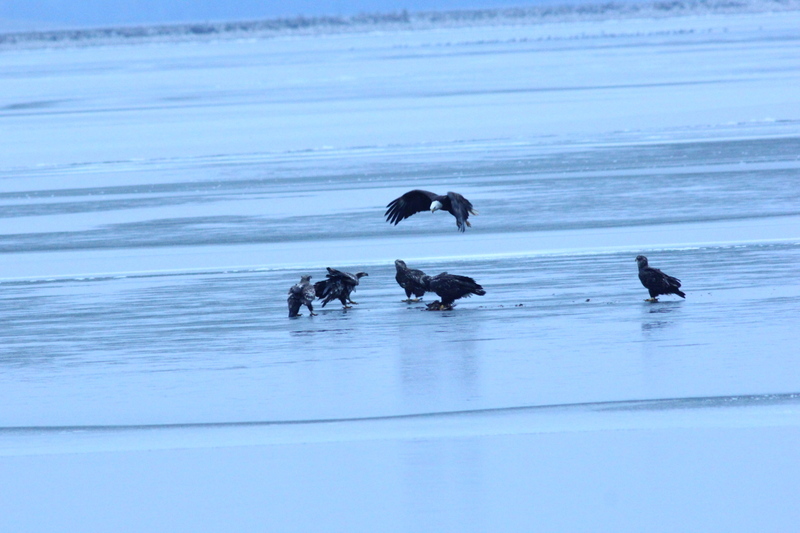 There are several breeding pairs of eagles in the Muskegon area to begin with, then, as the inland lakes begin to freeze over, the eagles that reside in those areas migrate out to the Lake Michigan shoreline so as to be able to find fish, their favorite food. 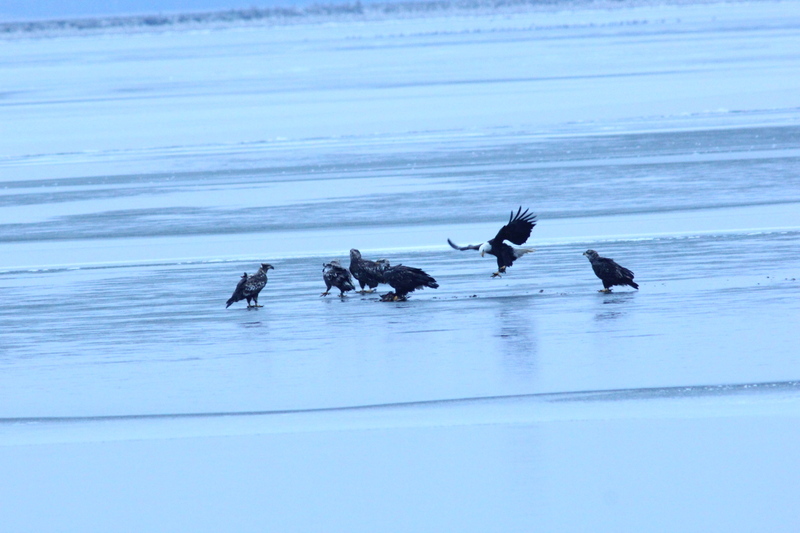 Some of you may remember a post I did a few years ago in the spring, when another photographer and I watched nearly three dozen eagles in action, fishing a small patch of open water on Mona Lake. 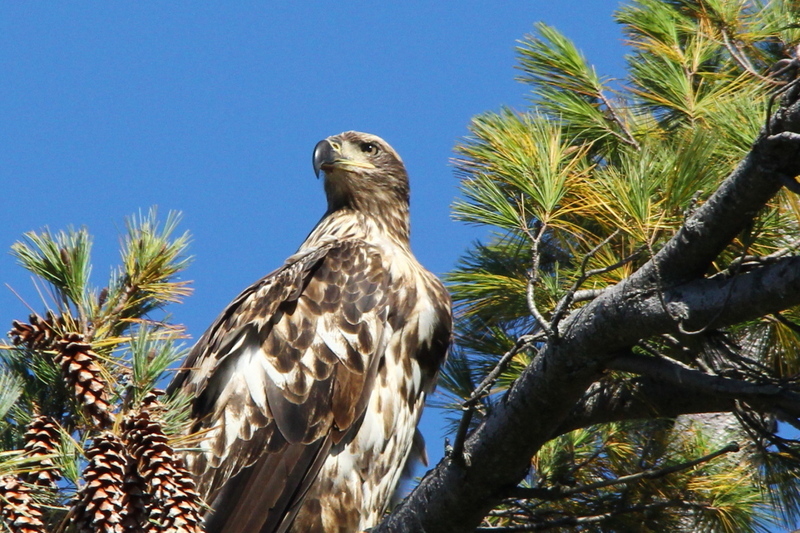 I try not to become jaded, but after a while it becomes “Oh, another eagle, I want to see something new”. That’s probably a bad thing, but it does say a lot about the comeback that the eagles have made here in Michigan. It’s no longer a surprise to see one anywhere, anytime. It’s not even unusual to see several of them together any longer. 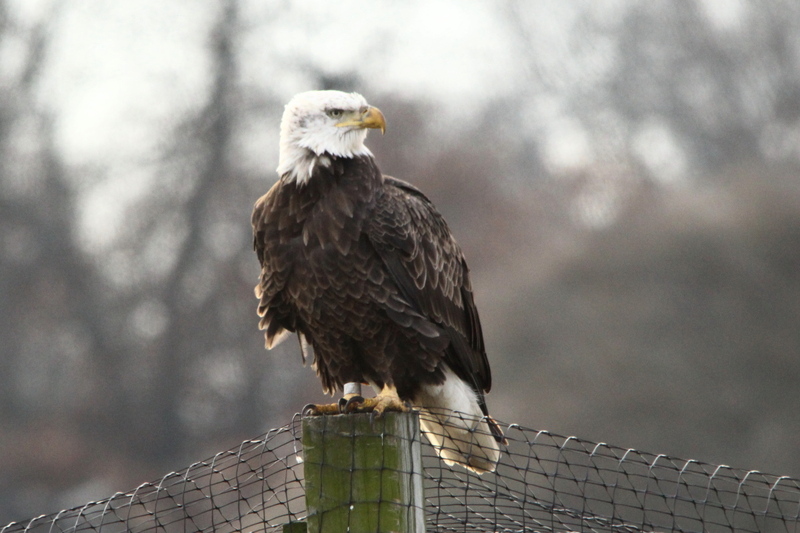 Still, the photographer in me wants far better photos than any that I have gotten to this point, and I tend to forget that it was just over a month ago that I shot some really good photos of two eagles. Sorry, I had to throw that one in to remind myself that I do shoot good photos from time to time. I know that I’ve done several posts along the same lines as this one, bemoaning the fact that the critters and weather don’t often cooperate in ways that would enable me to shoot better images more often. It’s also something that I struggle with as I’m choosing which photos to save and put into my blog posts. I could put more emphasis on just posting very few, but higher quality images…. 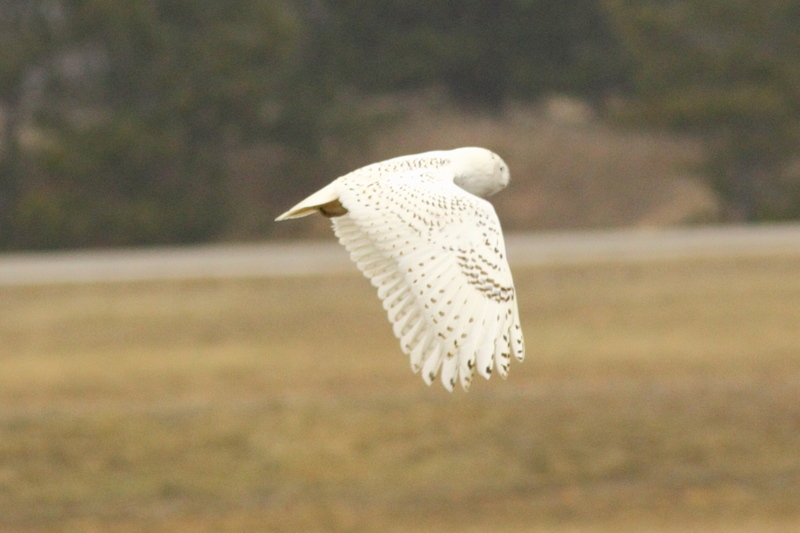 …for how many people have seen a snowy owl, let alone one watching a bald eagle soaring overhead. 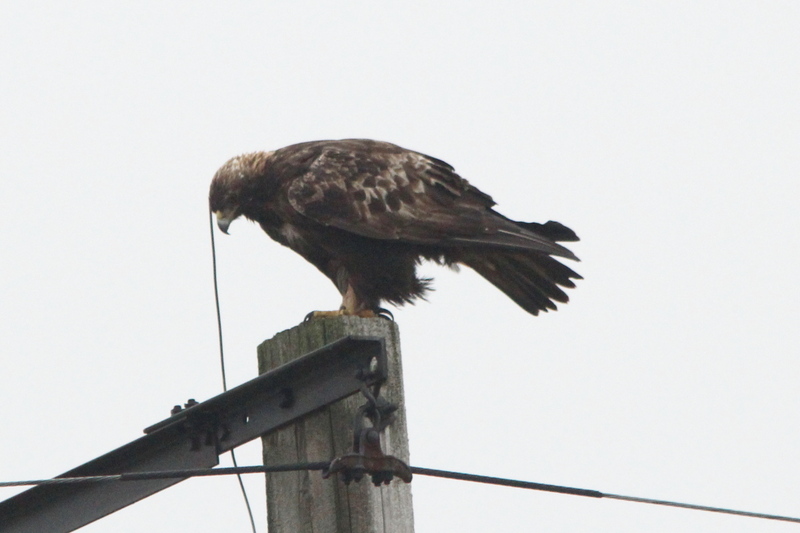 I deleted the photo of the eagle, as I’ve posted enough of them already, and it wasn’t very good. 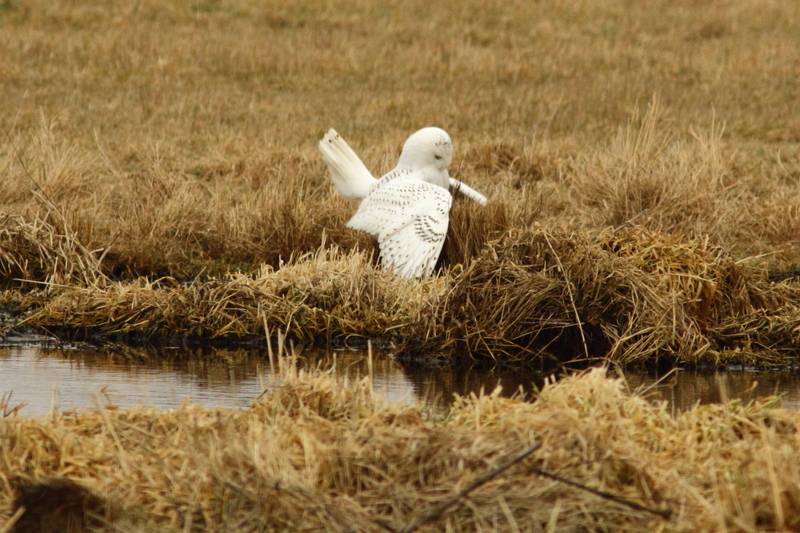 I did shoot a few videos on this trip, the “goose explosion” in my last post was one of them, here’s another, of the snowy owl. 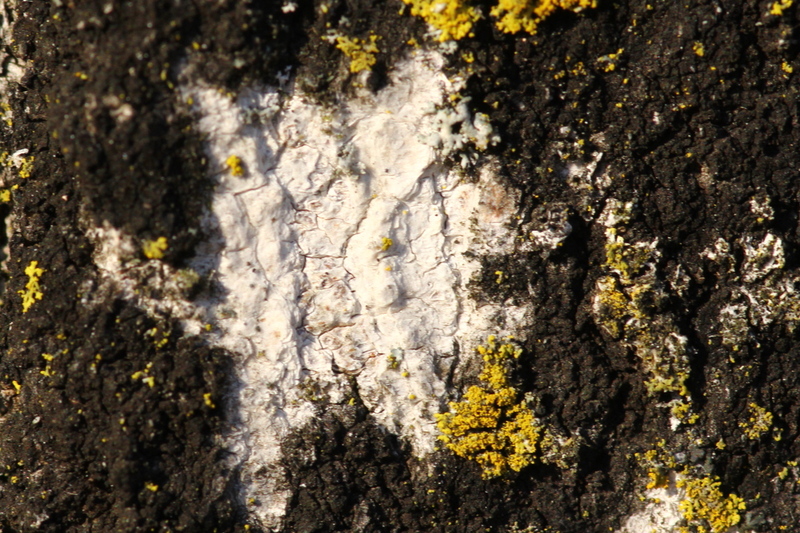 I removed the 1.4 X tele-converter from behind the 300 mm prime lens for that video. 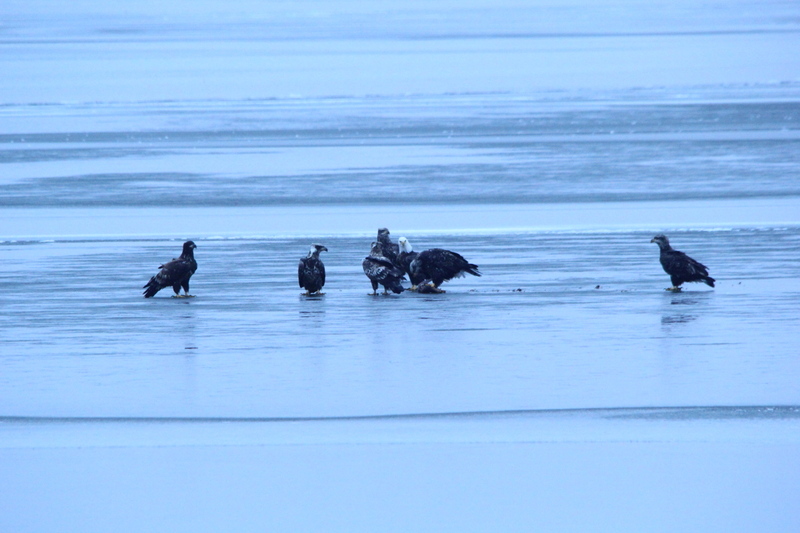 Here’s the flock of eagles from earlier, as shot with the Beast. 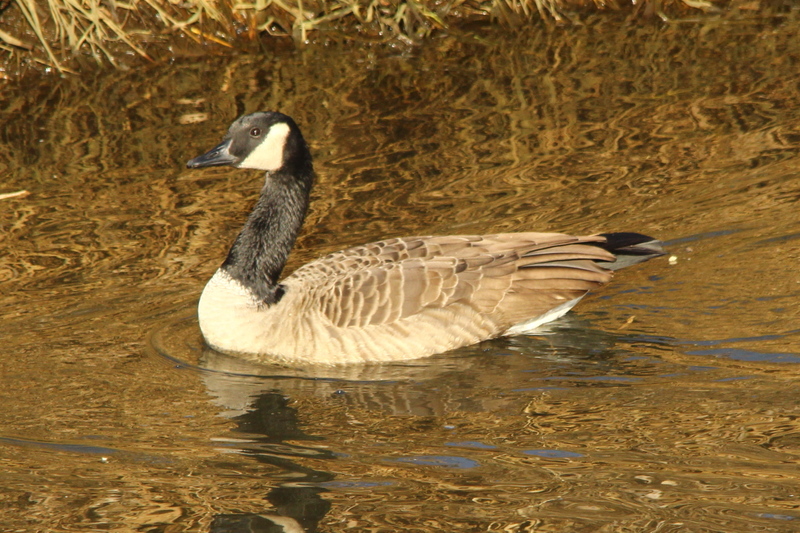 All my videos seem to share three common elements, the wind, the sounds of geese honking, and the need for improvement on my part in shooting video. 😉 Add a fourth thing to that list, most of my videos have been rather boring. 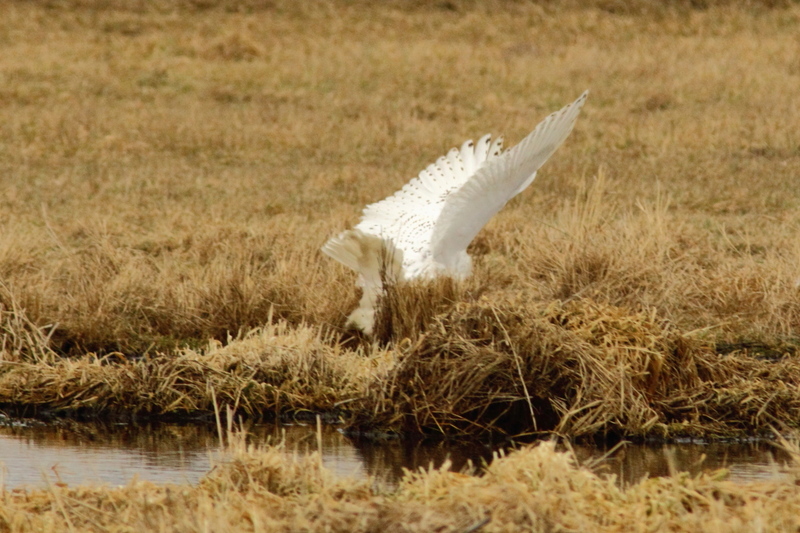 All the owl did was turn its head back and forth, and the eagles were taking a break from their fighting while I shot the video of them. 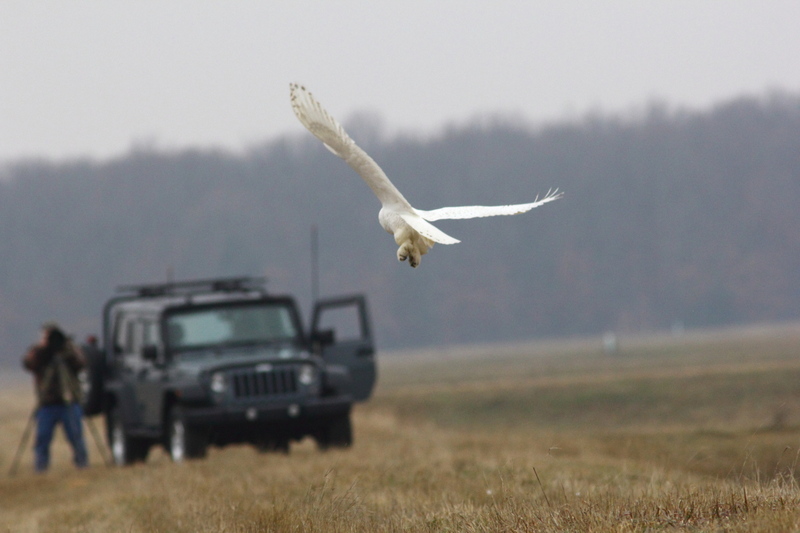 However, that ties into my rant about wildlife photographers that shoot under controlled conditions, there wasn’t an animal handler just out of view tossing treats to either the eagles or the owl to keep them within range of my camera. I never know what’s going to happen, or when it’s going to happen. And, when it does happen, the critter may be moving at the time, resulting in a slightly blurred image. 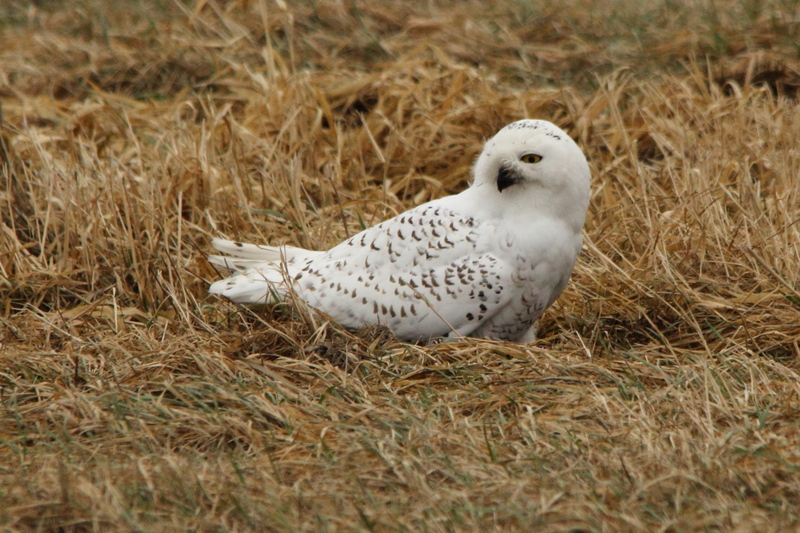 By the way, that was the second snowy owl of the day, here’s the first, shot at very long-range and cropped as much as I dared to. So, am I spoiled? Yes I am! 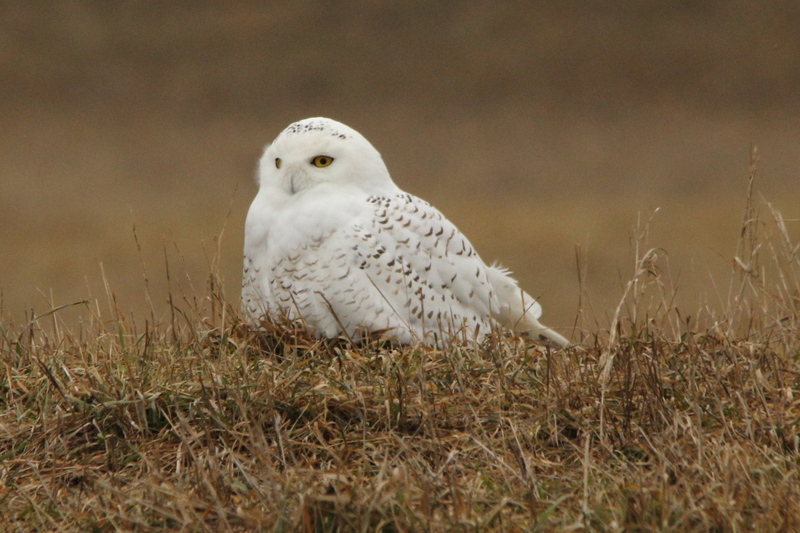 I live 45 miles from a place where I can watch over a dozen bald eagles, see at least two snowy owls, and all the other wildlife that I’ve posted photos of over the past few years. I’m not as spoiled as the “wildlife” photographers who shoot captive critters though, and I’ll probably never be able to match the quality of their photos. 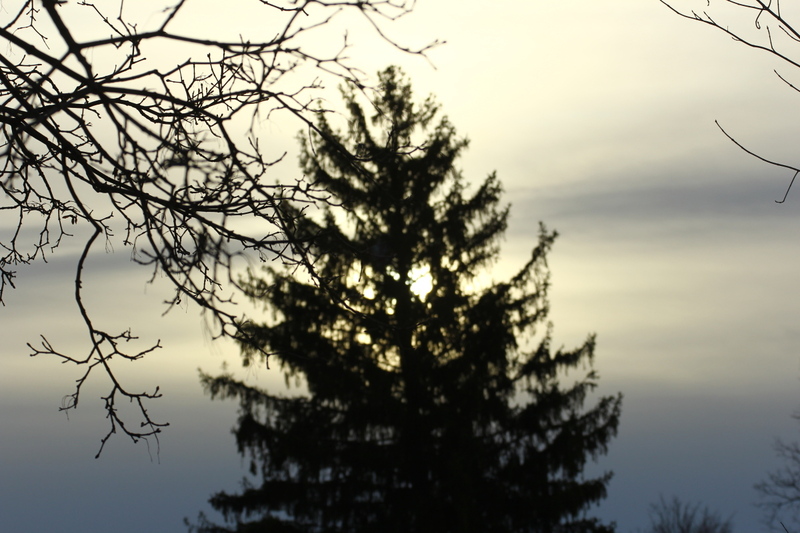 However, I still have a long way to go in improving my photography skills. I try to analyze things that I did right, and things that I did wrong after every photo outing that I make, even my daily walks around home. One thing that stands out about this trip is that I need to think ahead more, and be better prepared. I have two camera bodies, and two fairly long lenses, but up to this point, I’ve been using both set-ups the same way to account for the differences in performance between the Beast and the 300 mm prime lens as far as how sharp that each lens is at different distances. 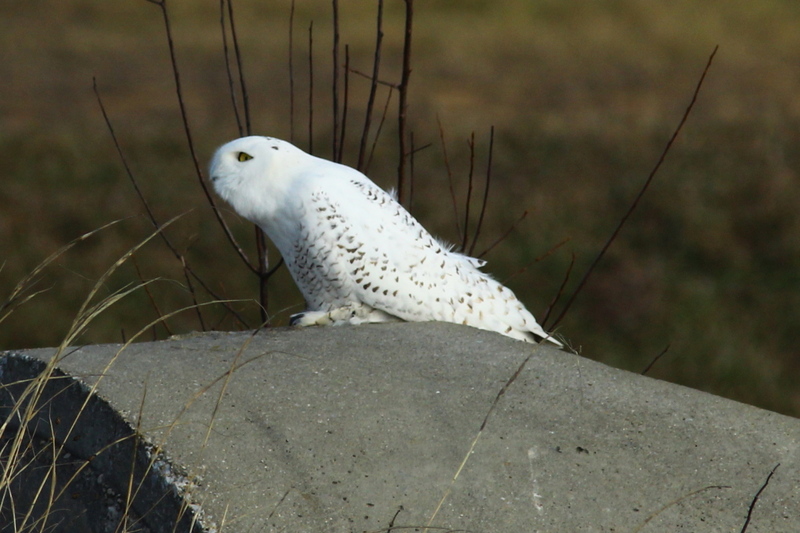 One thing that I did right, when I first saw the second snowy owl, was that I shot a few photos in jpeg using each camera set-up. Then, since the owl wasn’t going anywhere soon, I switched over and shot RAW using the Beast for all the rest of the images, in anticipation of being able to edit my images in the future. 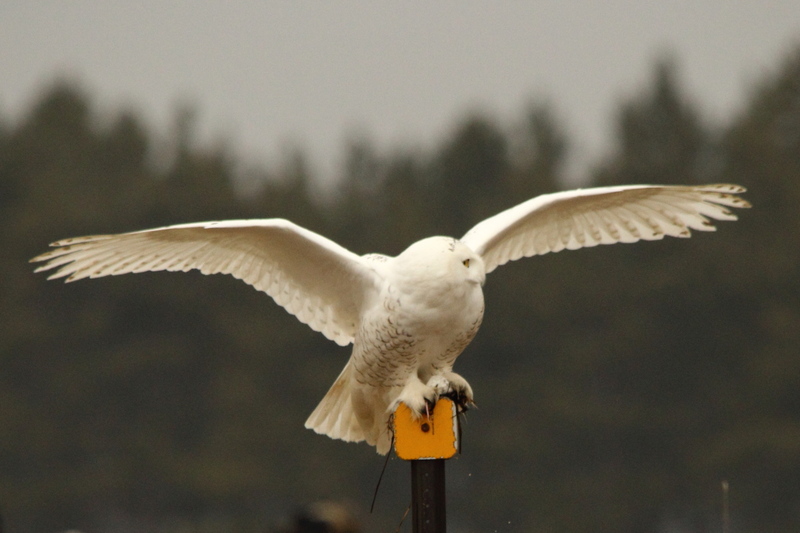 What I should have also done was to set-up the second camera body to shoot action photos in case the owl had decided to fly away, which you know that it did eventually. But silly me, I still had both set-ups dialed in for portraits, so when the owl did fly away, I only was able to get one fair shot of it. ..and I sat there just watching it, rather than getting ready for what I should have known was going to happen, leaving me with photos like this one. 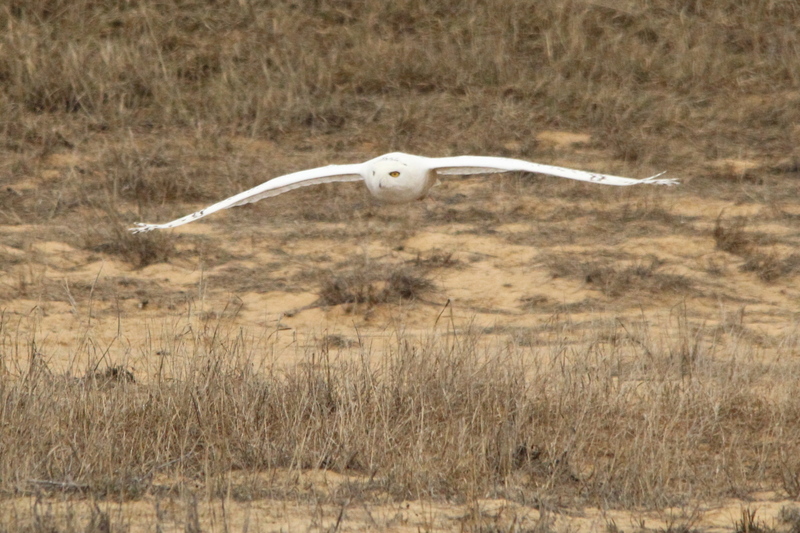 If I had set-up the second body to shoot the owl when it flew off, I could have gotten a much better image, as I did here. This post is about a trip that I made to Muskegon on November 30th, and it will be relatively short. 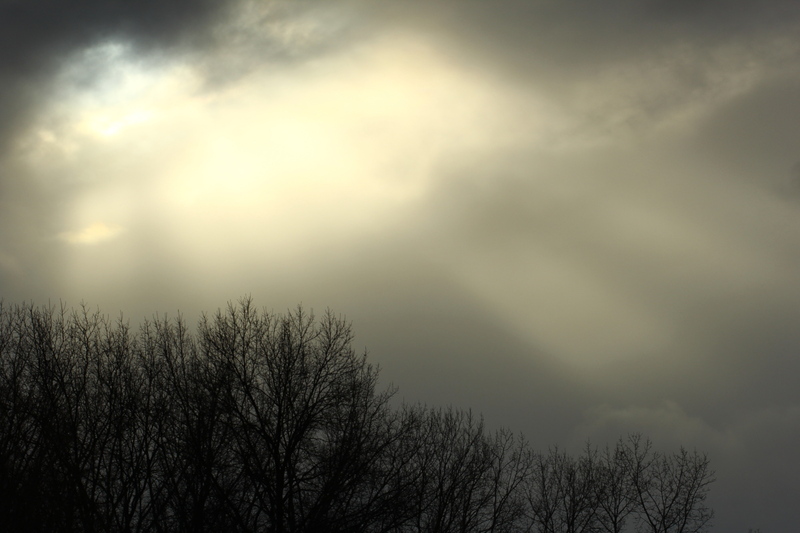 The weather report had promised a nice morning, with a front arriving during the mid-afternoon, bringing some rain. They were wrong, it was already raining lightly by the time that I got to Muskegon just after sunrise. Making things worse as far as photography, there was also a fog developing, which became so thick at times that it was hard to see the birds, as you will see. 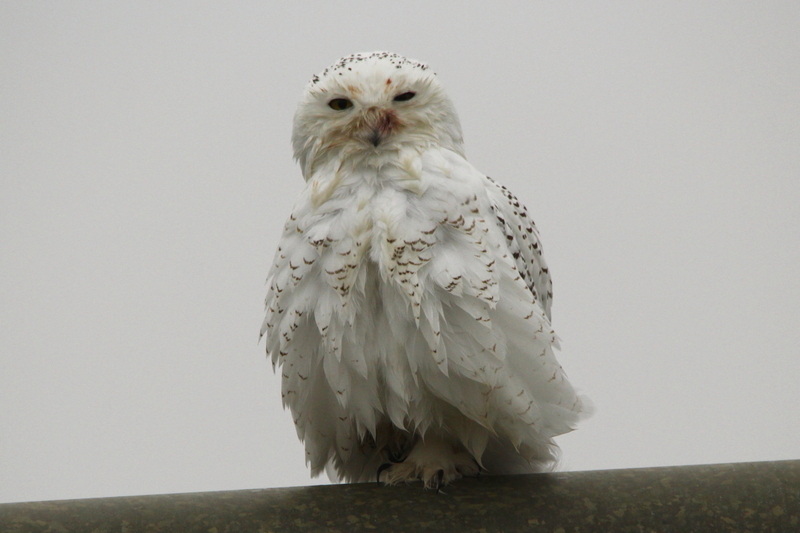 I did get the bird that I went after though, a snowy owl. 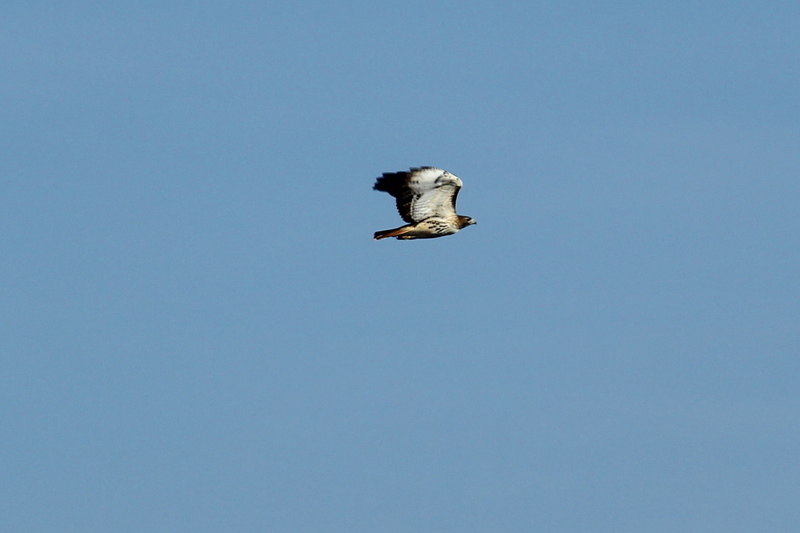 But, back to the beginning of the day, two bad images of a rough-legged hawk taking flight. 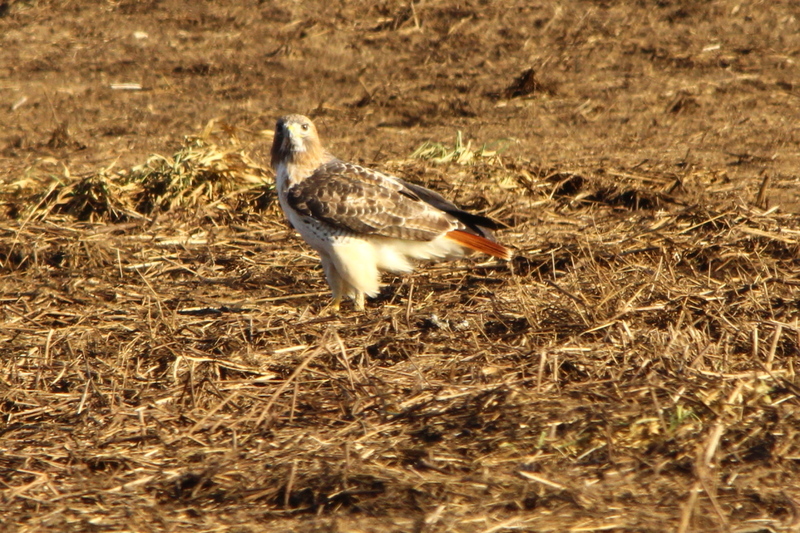 Here’s a red-tailed hawk for comparison. 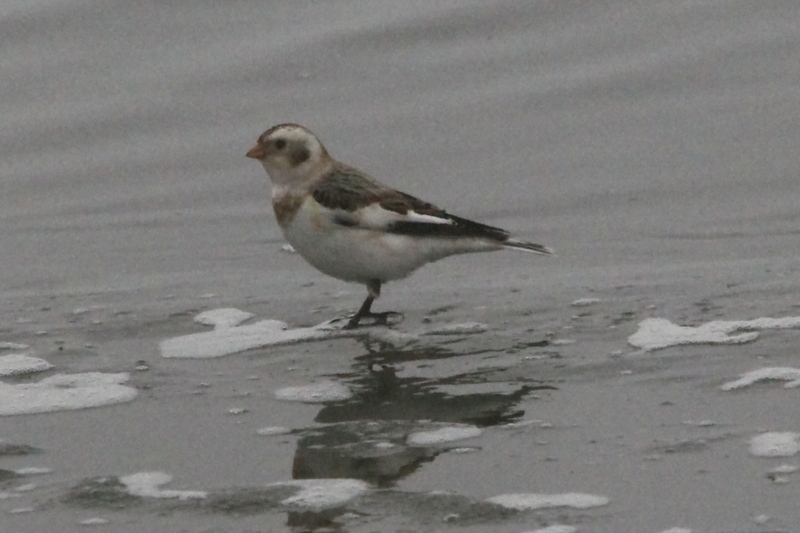 I also shot these very poor photos of a snow bunting, which ticks me off, since this is the first time that I’ve seen one out in the open. I tried the noise reduction software that came with my camera on this next image, it didn’t help. 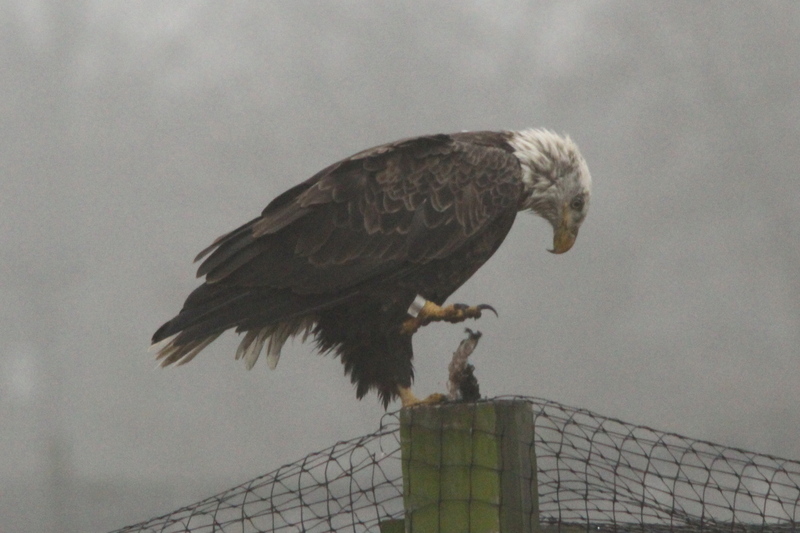 I saw a number of bald eagles, and shot photos equally as poor as the ones so far, but one eagle did perch close enough to me for a few photos of it playing with its food. 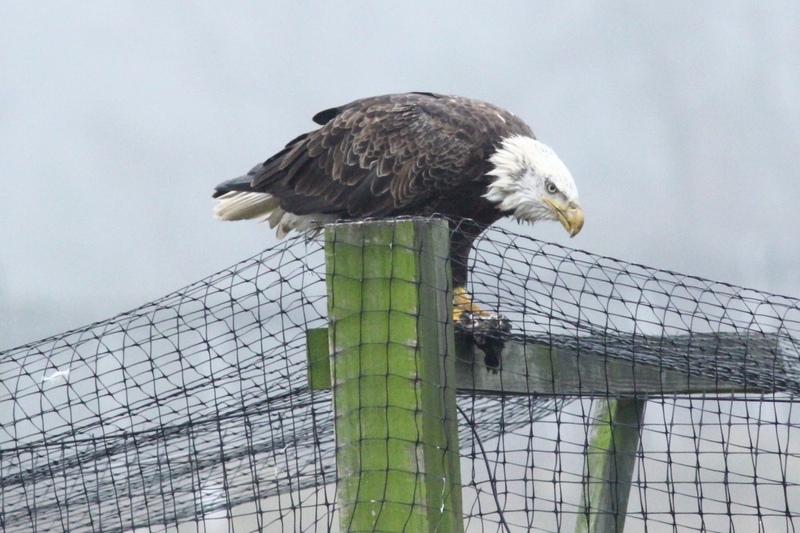 You can see that the eagle had been banded (ringed), which I didn’t know still took place with bald eagles, since they have become so numerous around here. 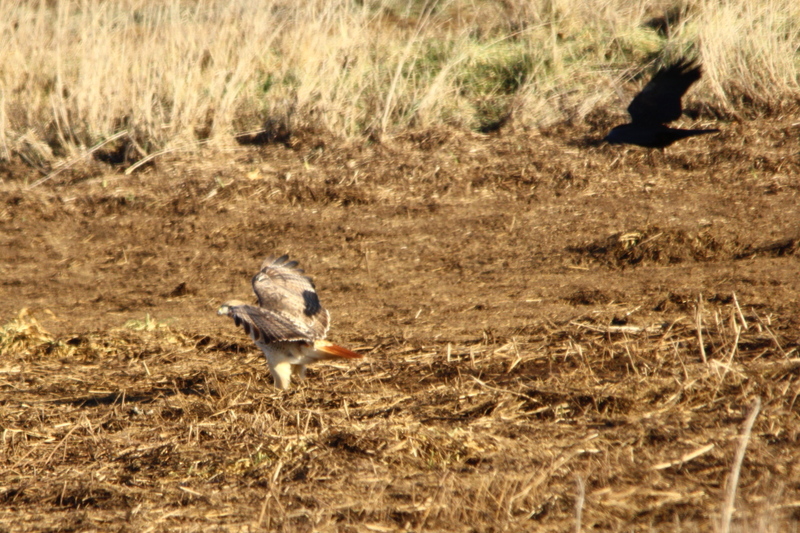 Anyway, here’s a uncropped image of the eagle moving so that I couldn’t see what it had killed that morning. By the way, these were shot with the Beast (Sigma 150-500 mm lens), and as well as that lens performs in good light, in poor light, it doesn’t do well as you can see. 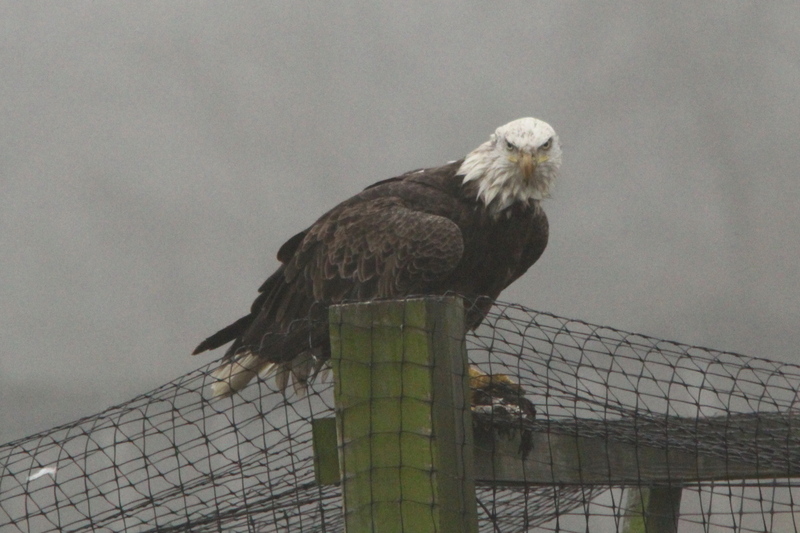 One more from it, of the eagle letting me know that it didn’t appreciate being photographed as it ate. I also had the Canon 300 mm L series prime lens set-up with the 1.4 X tele-converter on the second camera body, and used it for this one. I have to say that the Beast produced images that look almost exactly as the scene looked, fog and all, but that the 300 mm lens was able to cut through the fog, and produce a much better image, most of the time. 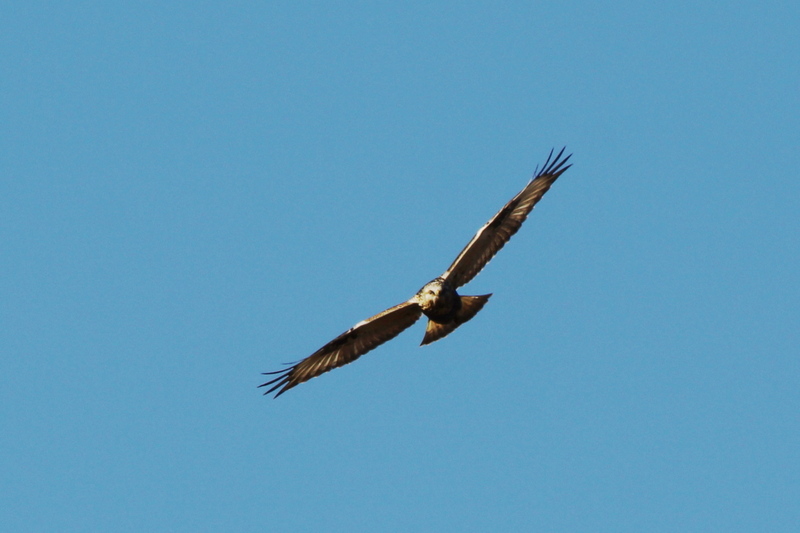 Later, I saw a golden eagle, and the 300 mm prime produced a sharper, clearer image, but the color of the golden eagle’s neck didn’t reproduce accurately, so I’ll I have use the ones from the Beast. I even tried running an image through Photomatix HDR software to get rid of the noise, and for more accurate color, but it didn’t help. 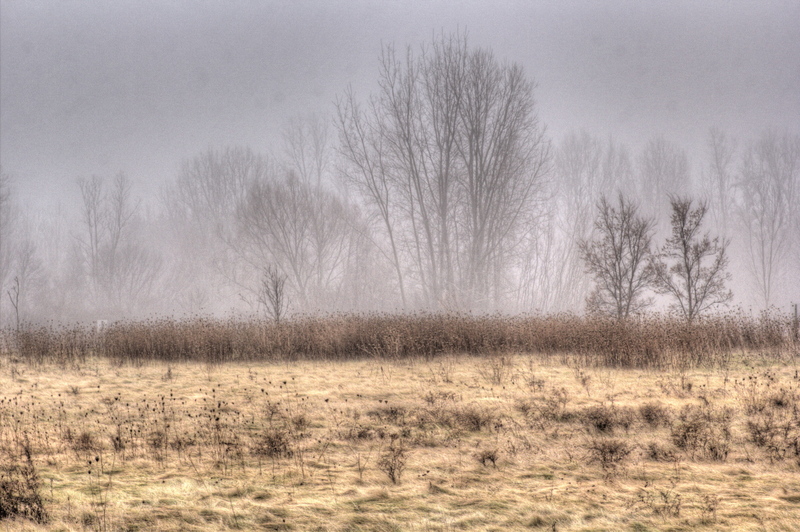 …and Photomatix removed most of what little fog that the fog that the wide-angle lens had captured. I had forgotten that telephoto lenses make a fog look thicker than it is, and wide-angle lenses make the fog look less thick. 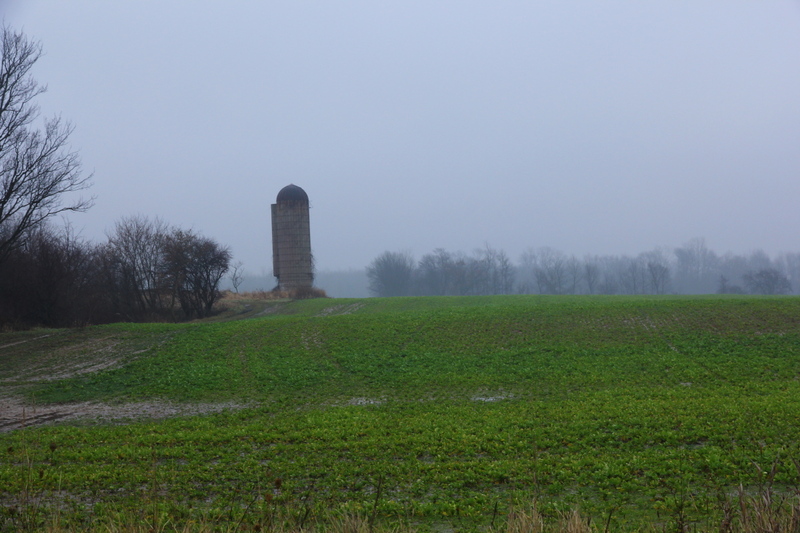 Darn, I liked the scene as it appeared to the naked eye, with fog partially obscuring the silo and woods behind it. 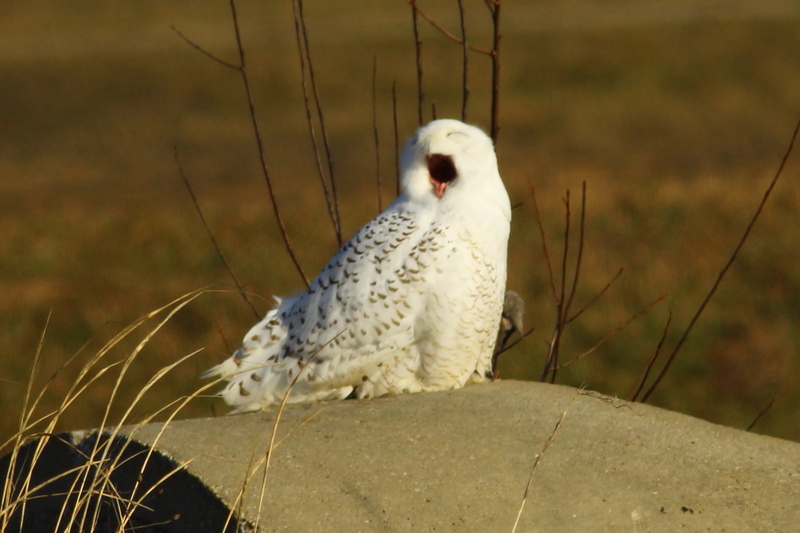 You’re probably wondering if I was able to shoot any good photos, sort of, I got close enough to the snowy owl to get a few good ones. But, I made a mistake while shooting those. Because of the poor light, I opened up the aperture of the Beast so that I could shoot at a lower ISO setting. 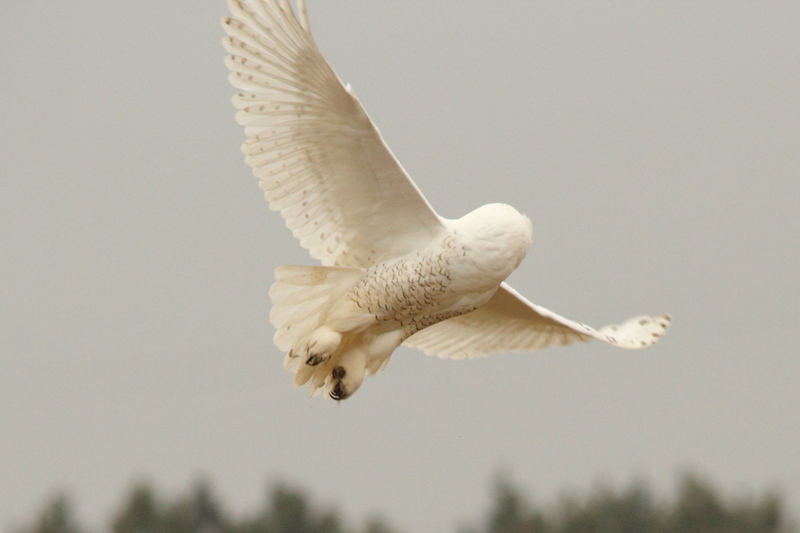 Then, to make sure that I got the owl’s face perfectly in focus, I switched from using the center focusing point to the highest one available on my 60D. 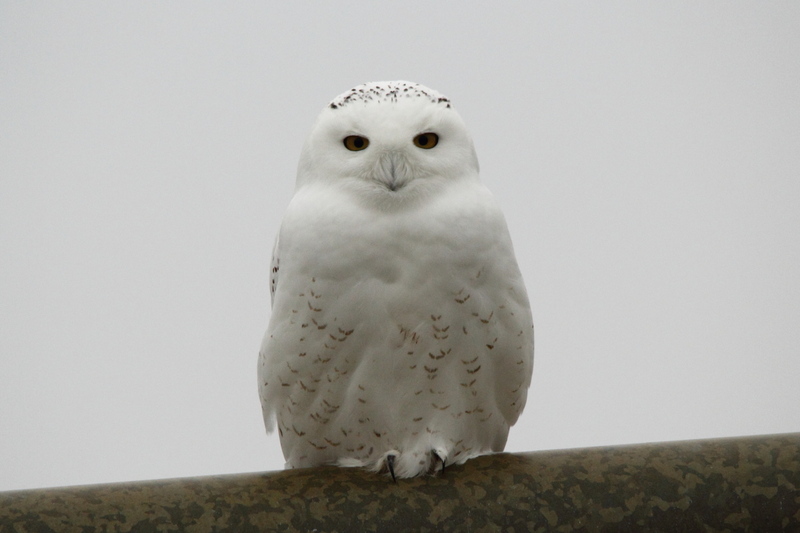 The owl was ten to 12 feet above me, so I was shooting up at more of an angle than it looks in these photos. 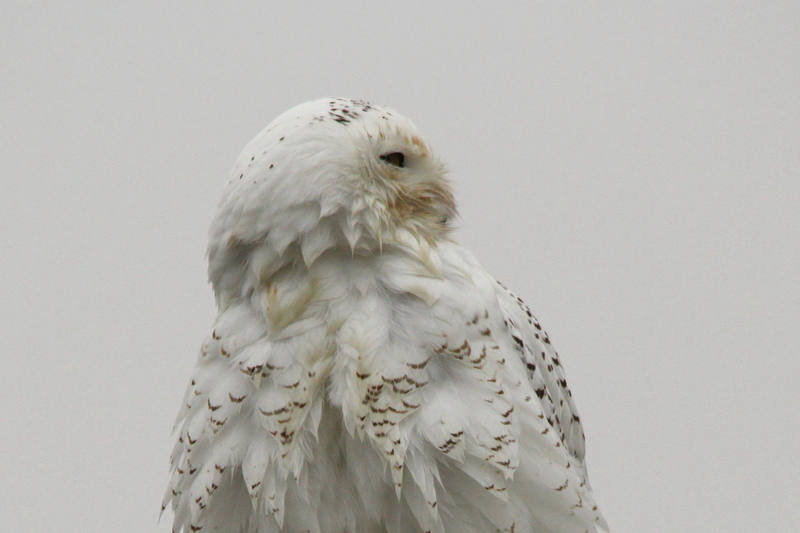 I was worried that if I used the center focusing point, I’d get the owl’s chest in focus but not its face. It did work great while the owl was perched. 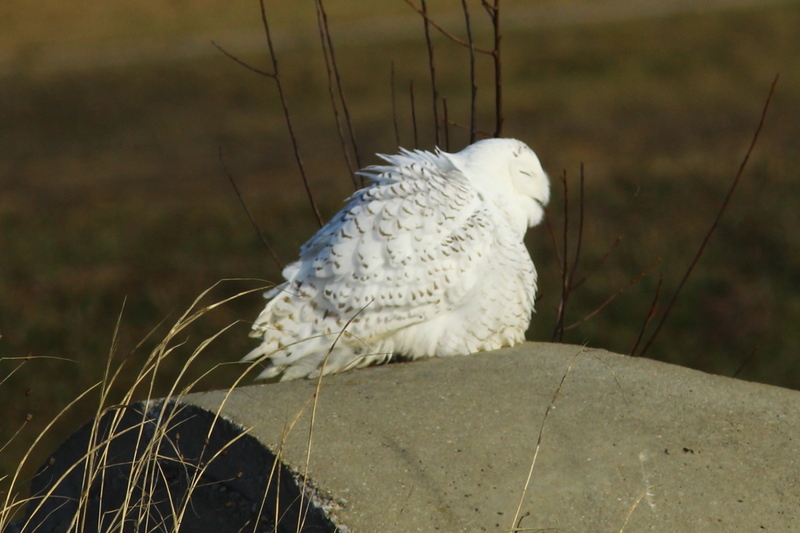 I had shot quite a few photos of the owl, then stepped back a short distance while I reviewed a few images to see how well that they had come out. 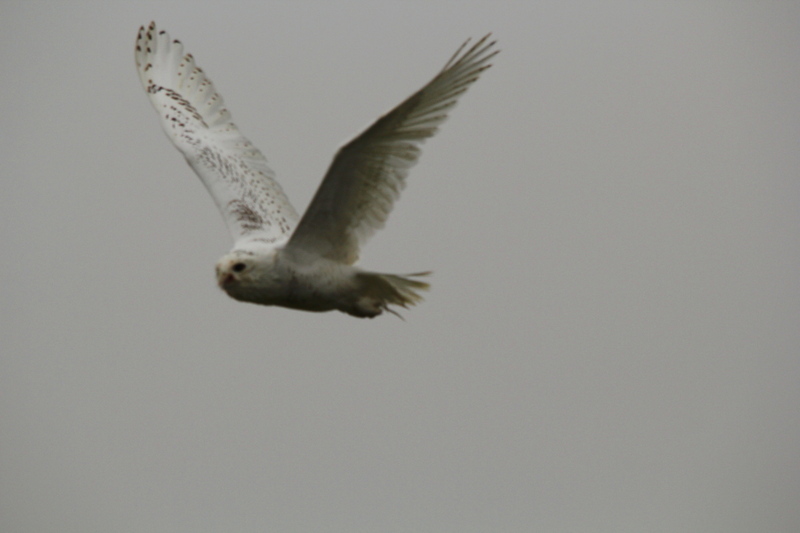 It was then that the owl decided to give me a great photo-op, by circling around me, which I completely blew! In the first place, swinging the Beast around isn’t easy. 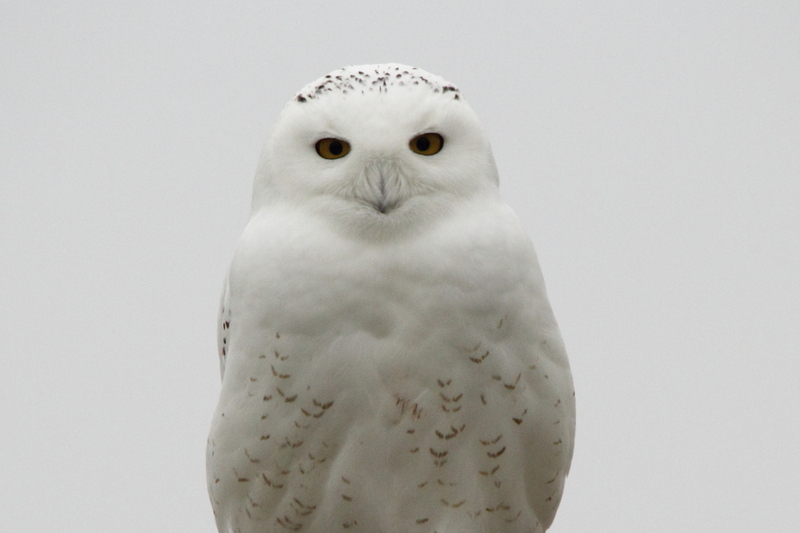 In the second place, the owl was so close to me that I couldn’t get him all in the frame at 500 mm. 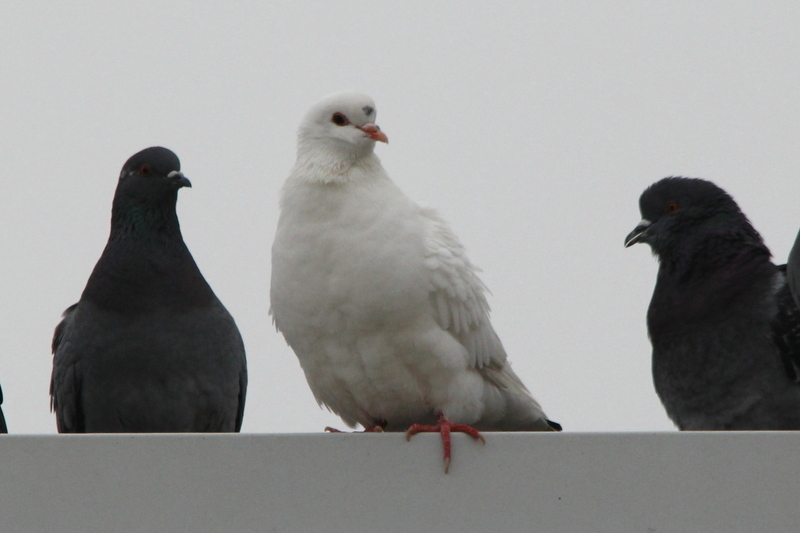 To make things worse, do you know how hard it is to find a white bird against a white sky? 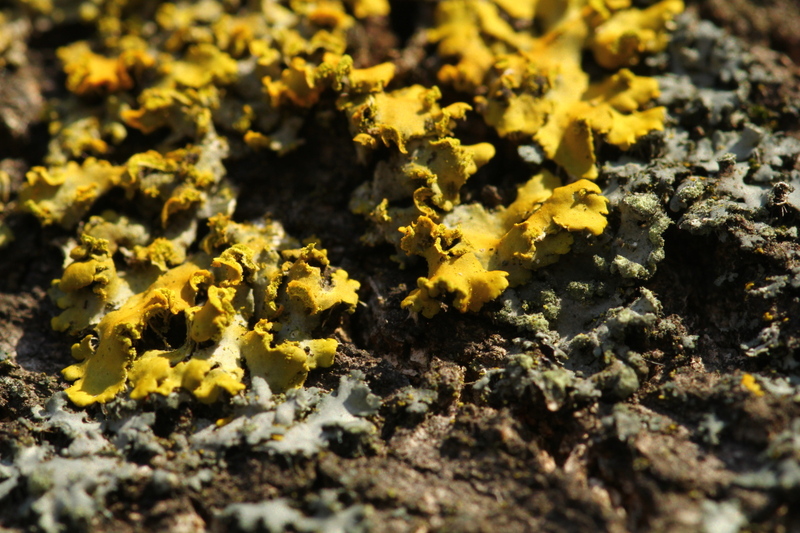 And, to top everything off, I still had the camera set to use the highest focusing point. 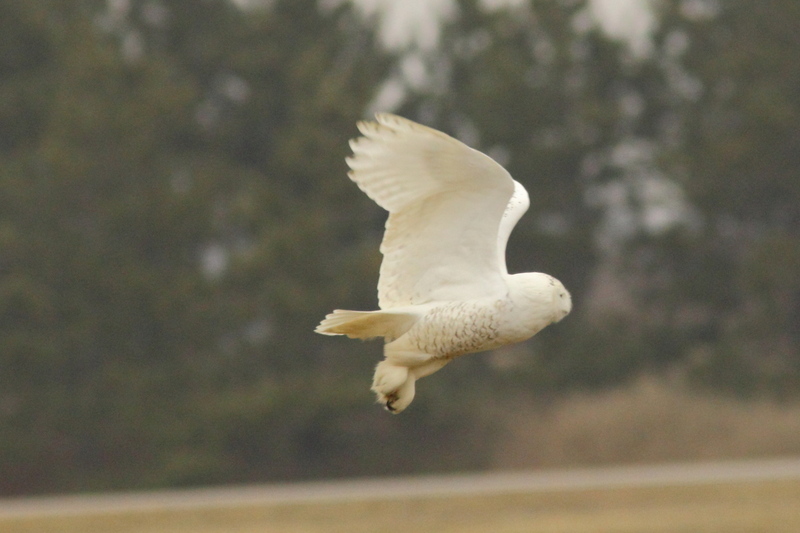 I couldn’t figure out why the camera wouldn’t focus on the owl as it flew past me at first, then, I remembered the focusing point, and tried to keep the right one on the owl instead of keeping the owl in the center of the viewfinder. 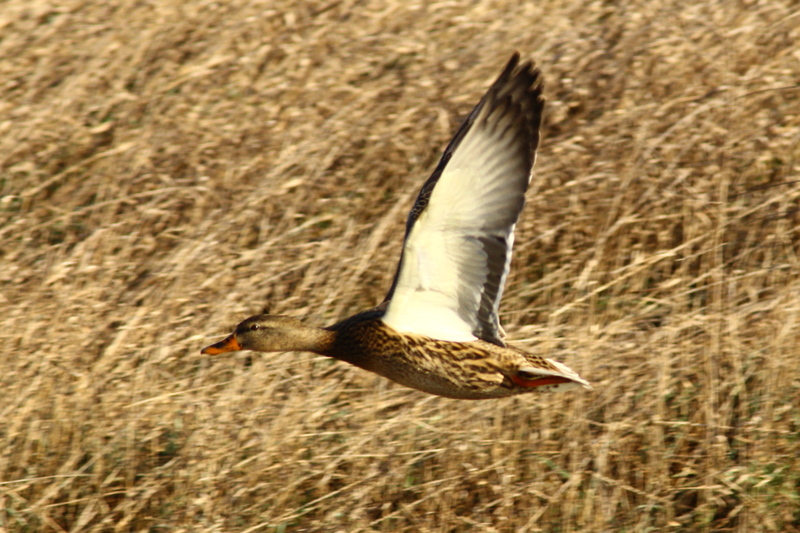 I did get it’s far wing in focus, sort of. 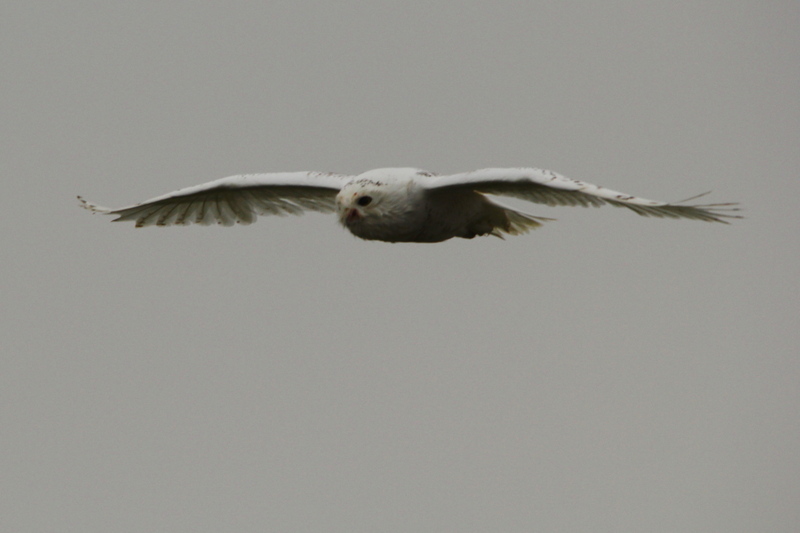 The camera didn’t like focusing on a white bird against a white sky very much either. But, the real killer was this one. 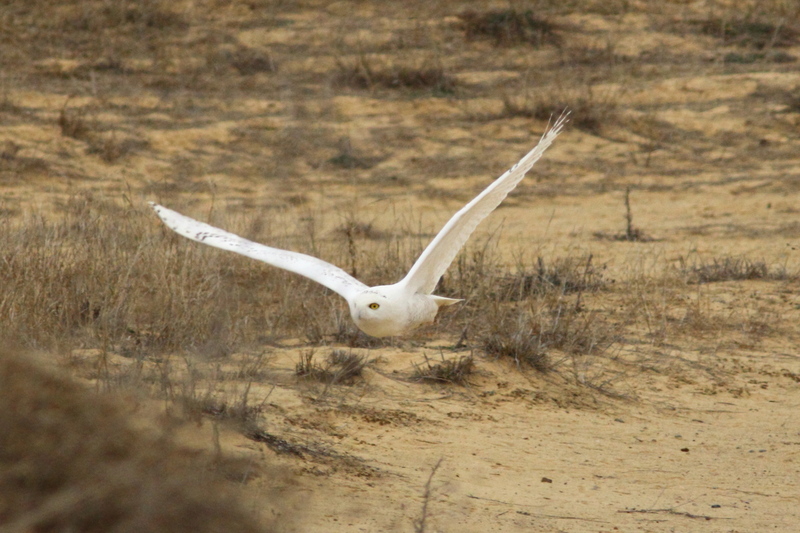 I had the upper focusing point on the owl, but then, most of the owl was out of the frame. The owl had made a tight circle around me, landed in the same spot it had taken off from, but didn’t stick around long after. He took off for the far side of the field, and I was left to kick myself repeatedly for not getting better photos because of my stupidity. 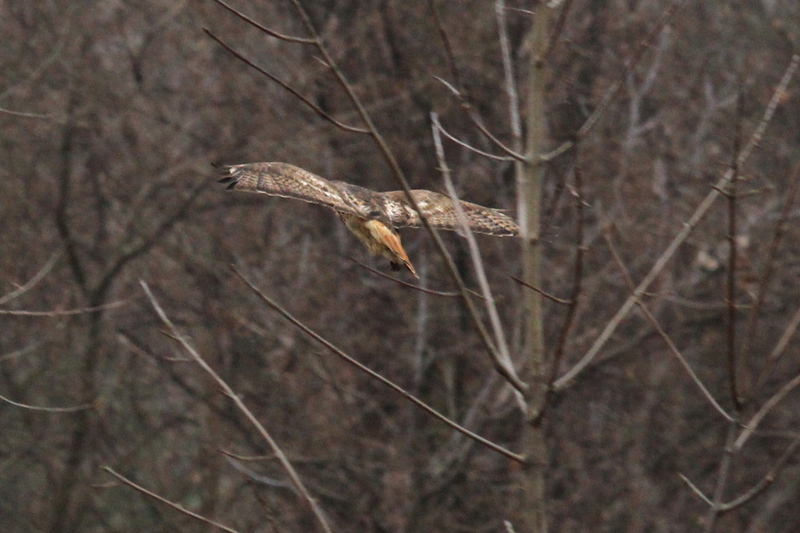 You may ask why I didn’t switch the focus point as the owl flew around me, I didn’t have the time. 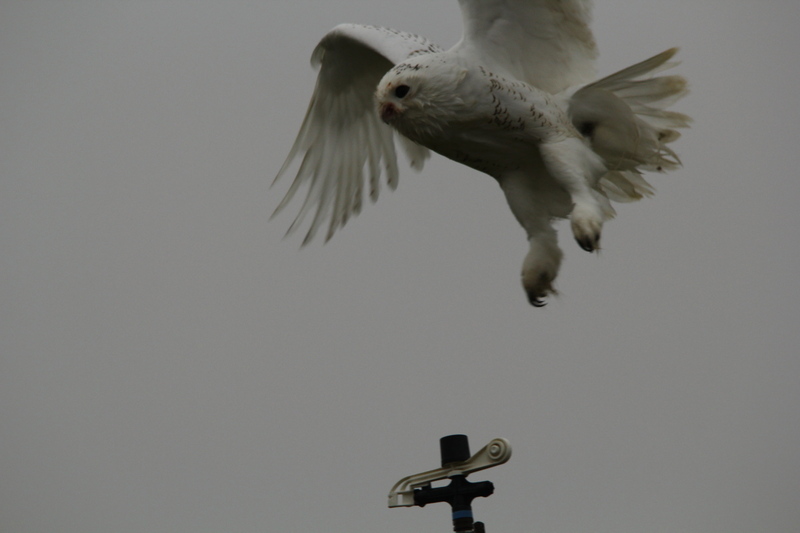 The owl’s flight lasted less than 10 seconds, and I have to push three buttons to change focusing points. 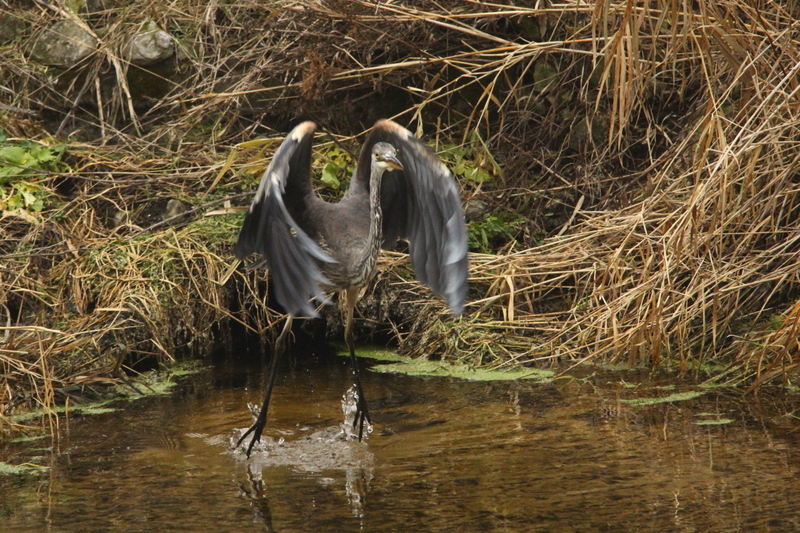 Anyway, I did get very good shots of a great blue heron, although the first one isn’t that great. 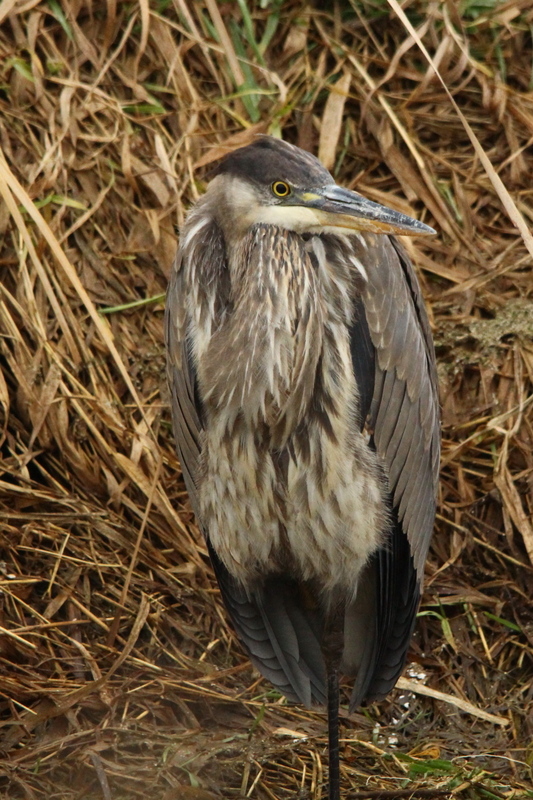 I was as surprised to see a heron still there, and the heron was surprised to see a human out on a day such as it was. Two things about that photo, one, I didn’t have a chance to get set before I began shooting, so I missed the composition that I would have liked. Two, that was also shot with the Beast in the fog, why these came out so clear is beyond me, but I’m glad that they did. 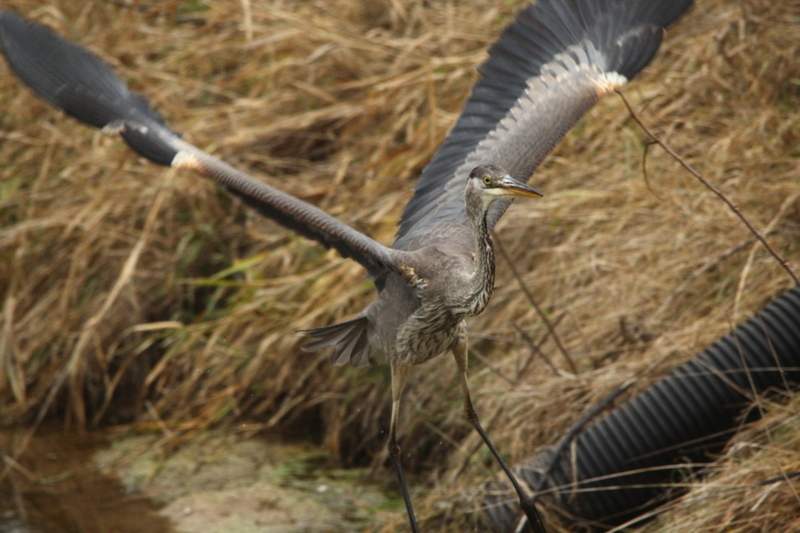 The heron kept coming almost straight at me. Needless to say, none of those were cropped at all. 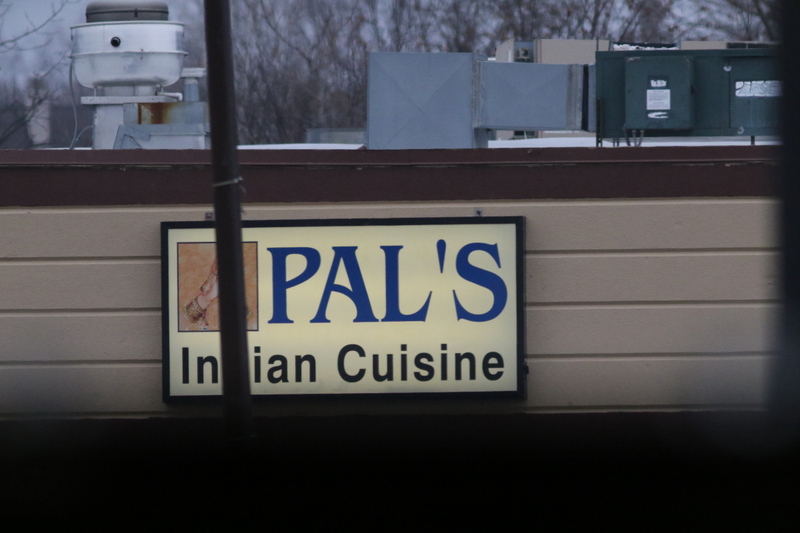 I only wish that the black drainage pipe wasn’t there, I wonder if I could Photoshop that out? 😉 Those were shot at ISO 3200, the eagles at ISO 1600, there are times when I’m not quite sure why images end up looking as they do. 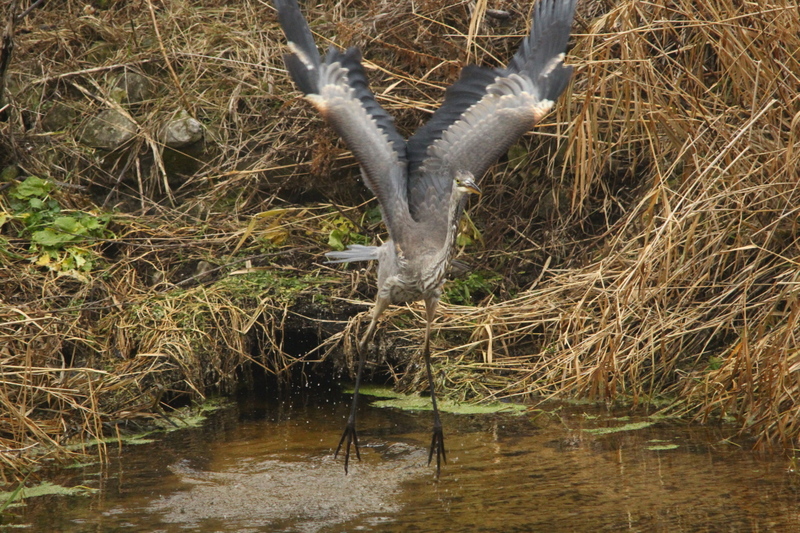 The eagles at a lower ISO were horrible, this heron came out well. 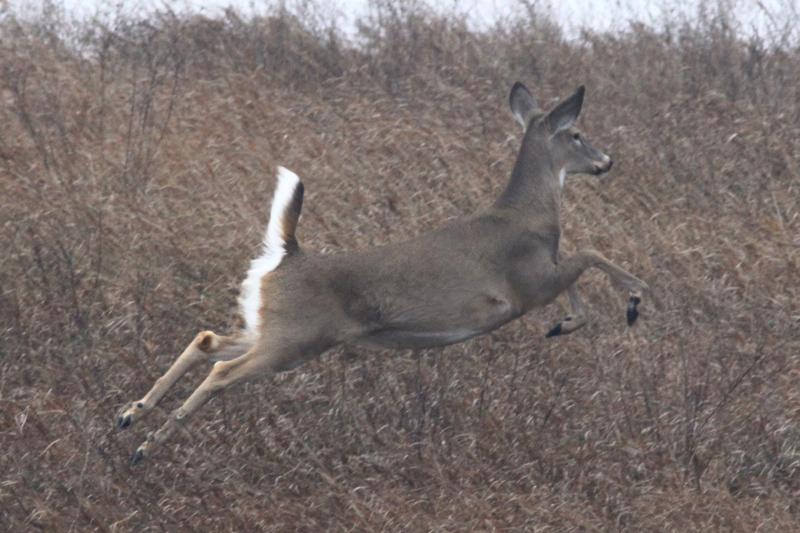 Anyway, I also shot a whitetail deer running. 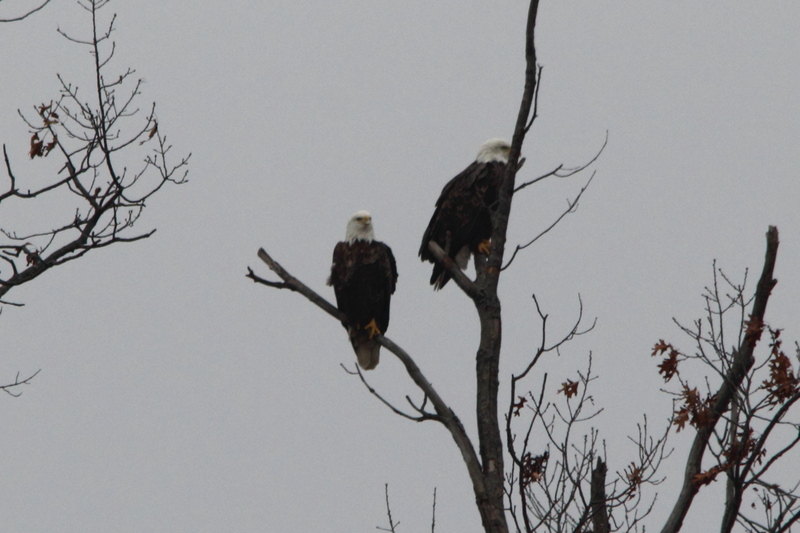 And, I caught two mature bald eagles having a conversation. But, not long after that, I decided to pack it in and give up for the day, since the weather was going downhill even more than it had been. 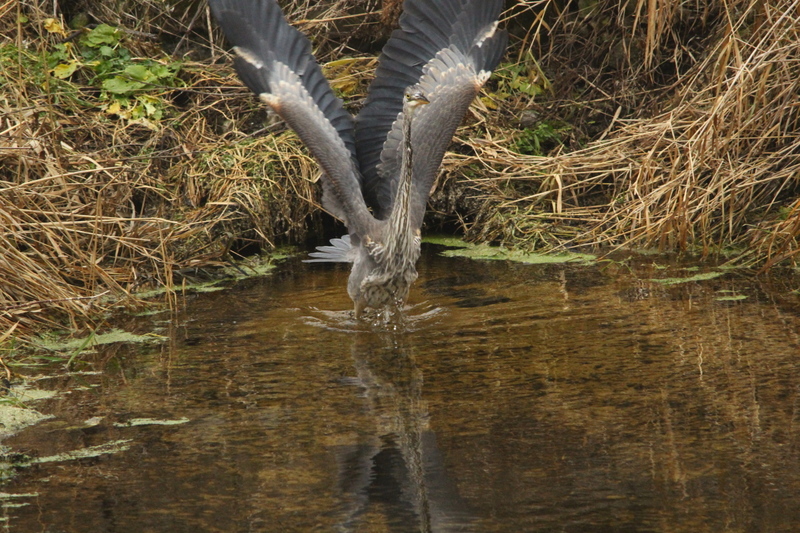 I did find another heron though on my way out. 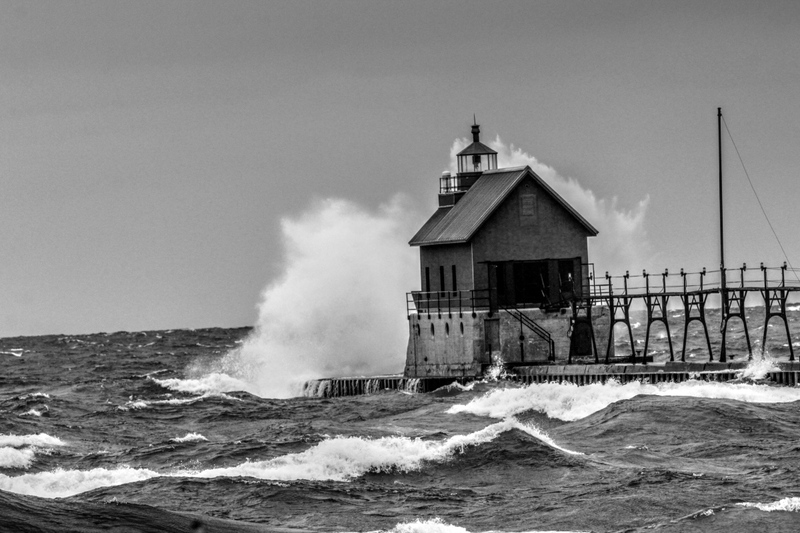 Okay then, with the promise of better weather yesterday, December 6th, I returned to Muskegon again. All the way over as I was driving, I could see a bright full moon as it was about to set in the west. Guess what happened? Just as I got off from the expressway, the clouds rolled in for a few hours. So, I got to the Muskegon County wastewater facility just at dawn, as I had planed, but instead of sun, I got cloudy skies. I shot over 600 photos, but I’m going to have to decide how many to bore all of you with that look like this. 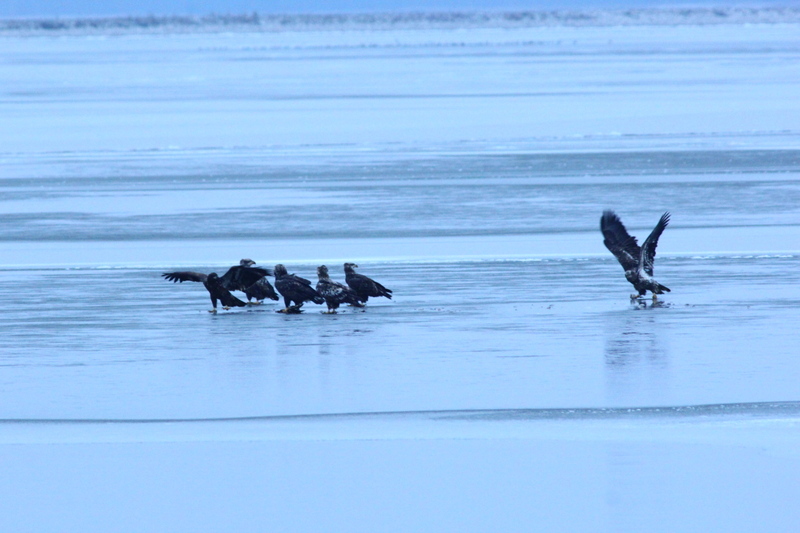 As I sat there shooting the eagles, I got images of them threatening to pounce on the others, them sliding around on the ice, and one of the eagles falling as it slid on the ice, and so on. But, they were all shot in the pre-dawn light as the one above. I haven’t decided how many to use. 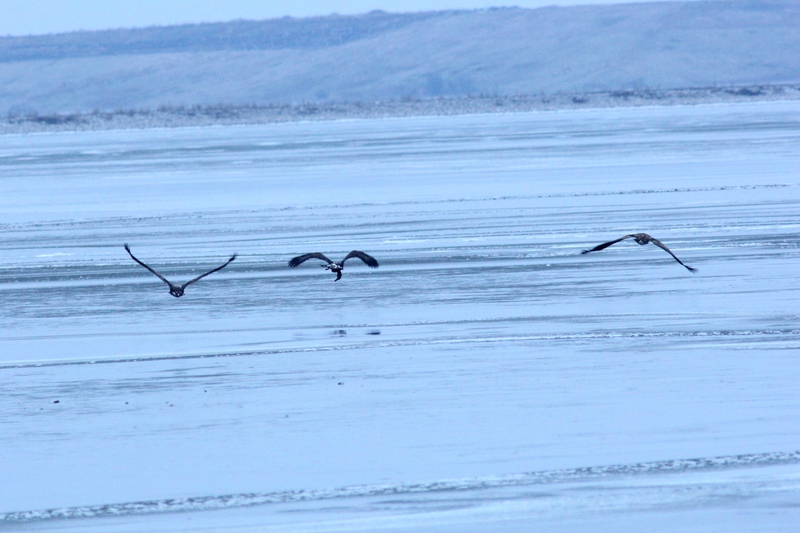 There were actually eight eagles in sight, but one stayed out of the frame the entire time. 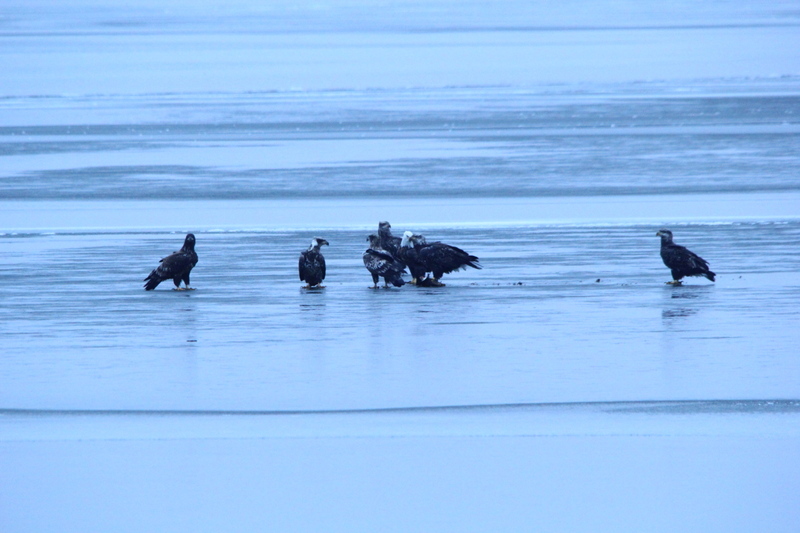 No matter how poor the images are, it still impressive to see so many eagles all together like that, and watch how they interact. 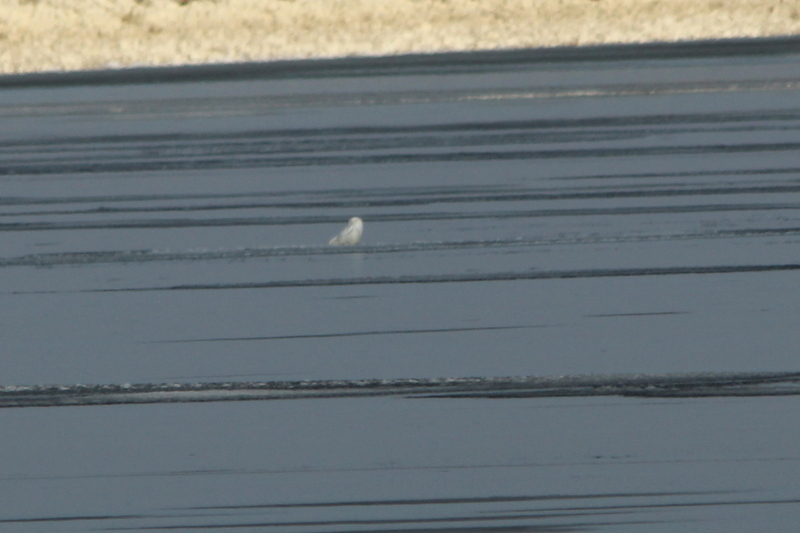 I did get a snowy owl in better light, but wasn’t able to get as close to it. 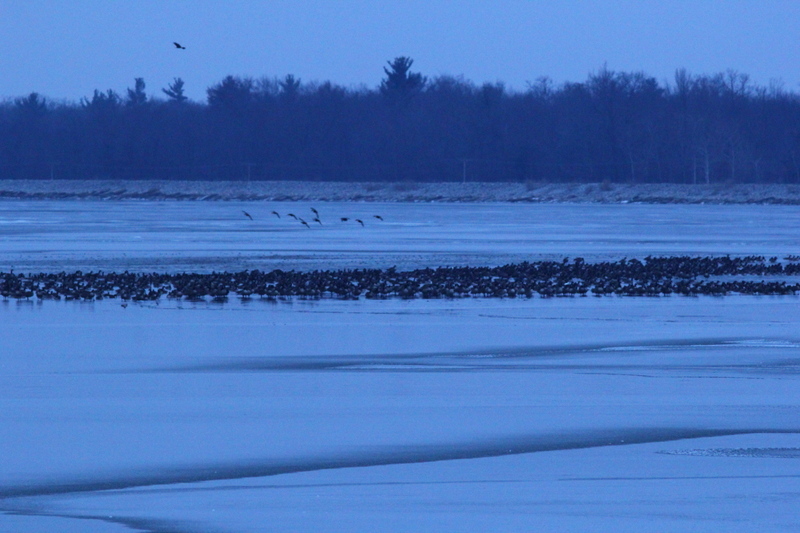 I also shot another video of the huge number of geese there. I lost the focus about half-way through, but the sound is still impressive. I guess that this one is finished, I don’t have much else to say that isn’t boring. I’m going to start with an update about my new job, the hours are horrible right now, and I’m getting the runs that the more senior drivers don’t want, but I expected that being one of the new drivers. Last week, I had start times ranging from 6 PM on Monday to 6 Am on Friday. It’s hard to develop any type of sleep schedule when one works such a changeable schedule, if you can call it a schedule. This week has been better, with more consistent start times, so I’m feeling quite chipper right now, rather than dragged out like last week. The big news is my paycheck, this new company pays every two weeks, and my paycheck this Friday will be three times what a one week paycheck was at my old job. So, it does work out that I’m making almost exactly 50% more than my last job paid, and that makes it worth putting up with the miserable work hours for the time being. Oh, and included in that is the fact that I had Thanksgiving day off without pay, as I haven’t been on this job long enough to qualify for holiday pay yet, or there would have been even more in my next check! It’s going to be great not to be broke all the time, I think that this weekend, I’m going to splurge, and go out for a steak dinner for the first time in years! The weather has relented some as well, it’s been cold, but the snow has let up at least a little for the last two weeks, and we’ve even had a few sunny days this week. Because of the odd hours I’ve been working, there are days when I don’t make it out for a walk at all, but then there have been other days when I’ve been able to do the five-mile long version of my daily walk, so it is averaging out to being about the same as it was at my old job as far as getting out to shoot a few photos. On that front, the past two weeks I have been playing with the high-speed burst mode of shooting photos of subjects in action, as you will see shortly. The reason for that is because every review of the new Canon 7D Mk II has put a lot of emphasis on the fact that it can shoot up to 10 frames per second, with a buffer large enough to hold 33 RAW images, and some fantastic number of high quality Jpegs. My 60D can’t come close to that, and I’ve only tried the high-speed burst mode once, on a vulture and hawk which were both out of range at the time that I tried it, but it seemed to work reasonably well. I found it to be a great way to shoot a large quantity of bad photos in a very short time. My results the past two weeks is somewhat the same, high-speed burst is a great way to shoot a large number of bad photos in a short time, but, it can also be the way to catch good action shots that I would otherwise miss. 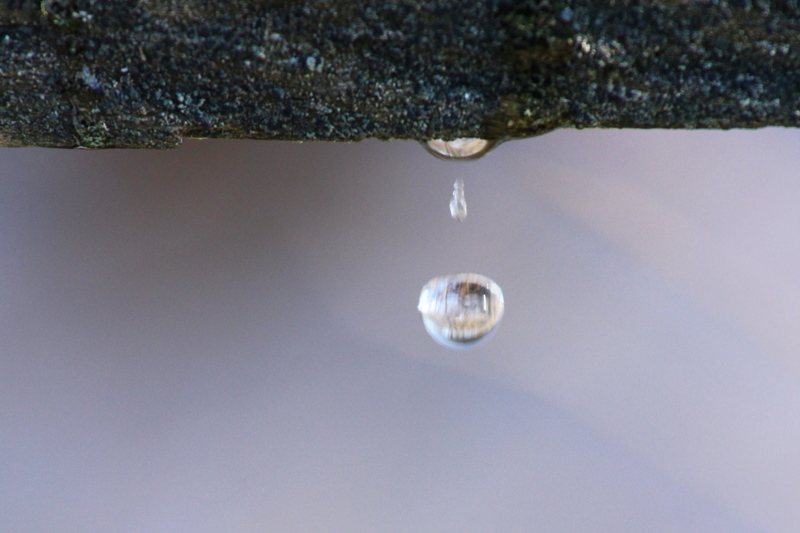 Trying to time when a water drop from melting snow will hit the ground is impossible, as is catching a drop in midair. 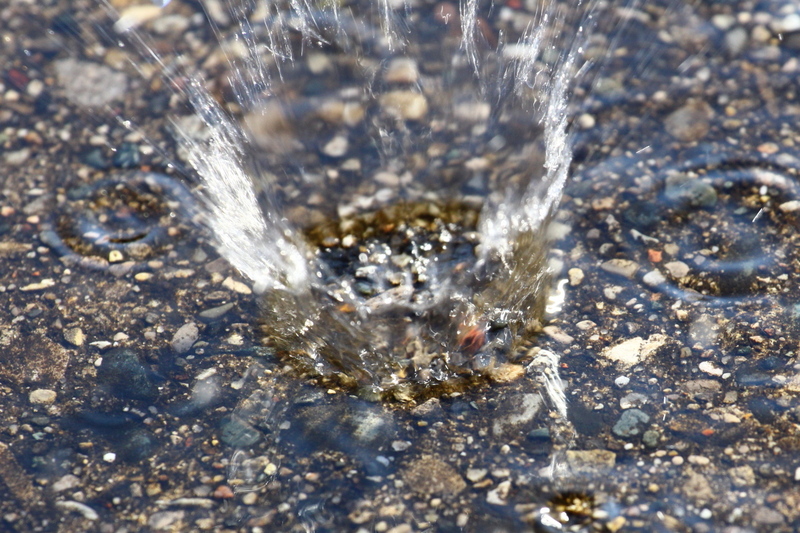 With my old Nikon, I used to be able to fill the buffer shooting quickly when pressing the shutter release for each photo, so I’ve been leery of using the high-speed burst mode of my Canon 60D, That was an unfounded fear. On the same day as I shot the water drops, which I shot in quick but short bursts, I saw Bruiser, our resident male red-tailed hawk fly past me, although he was really out of range, so I started shooting in high-speed mode and didn’t quit until it got beyond the point of being ridiculous, just to see how large the buffer of the 60D is. I shot 59 high quality Jpeg images in that burst, and never did fill the buffer. These three images that I saved from that experiment are nothing special, but it did show me that using the high-speed burst mode was something that I need to use more often. In the meantime, another thing that I have been trying is using the Tokina 100 mm macro lens for more than just macros, since it is my best lens optically. 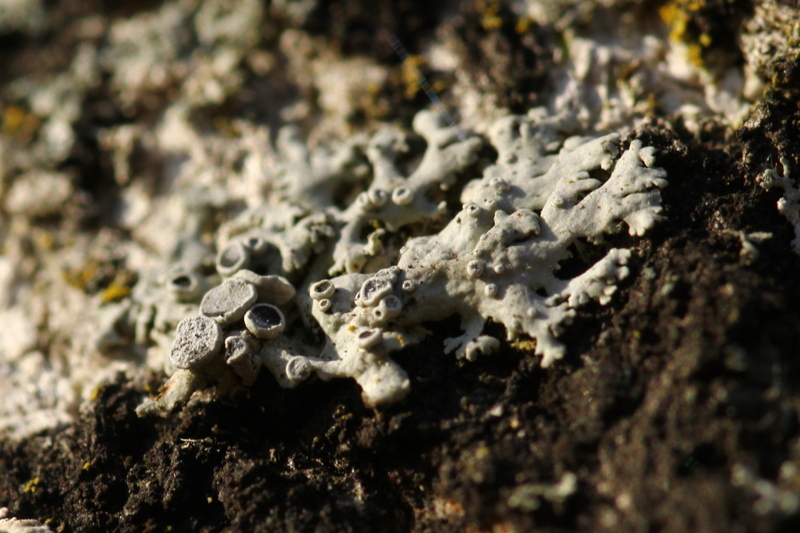 Of course, that lens is a great macro lens. You may remember the mosses from a recent post, when I had to shoot at f/2.8 to get any photo at all. 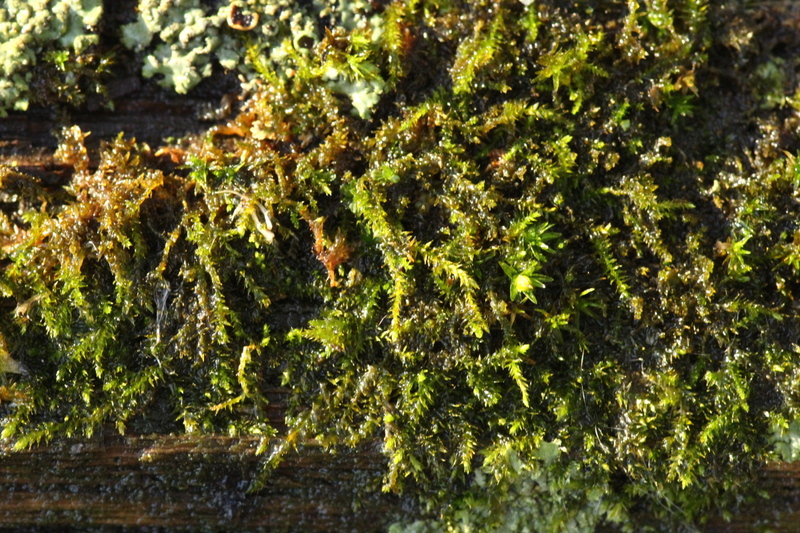 The last one was shot with the lens stopped down for more depth of field in this image, so more of the image is in focus and you can see the mosses better. 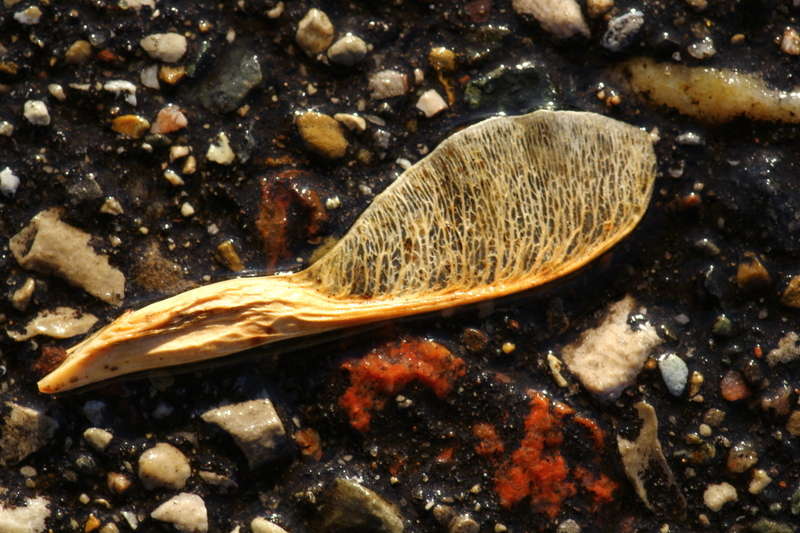 Here’s another image of something from a recent post, the egg case that I shot earlier. 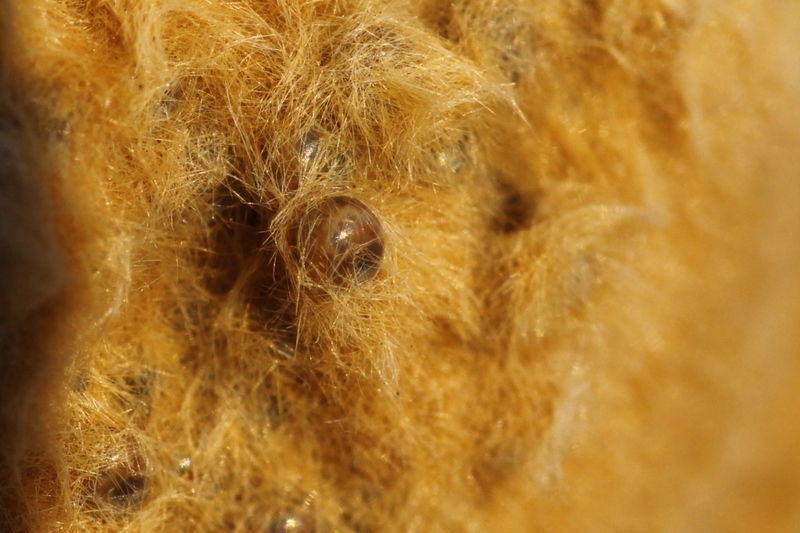 With more sunlight, I was able to get closer to show one of the insect eggs in the egg case. Here’s another repeat of sorts. 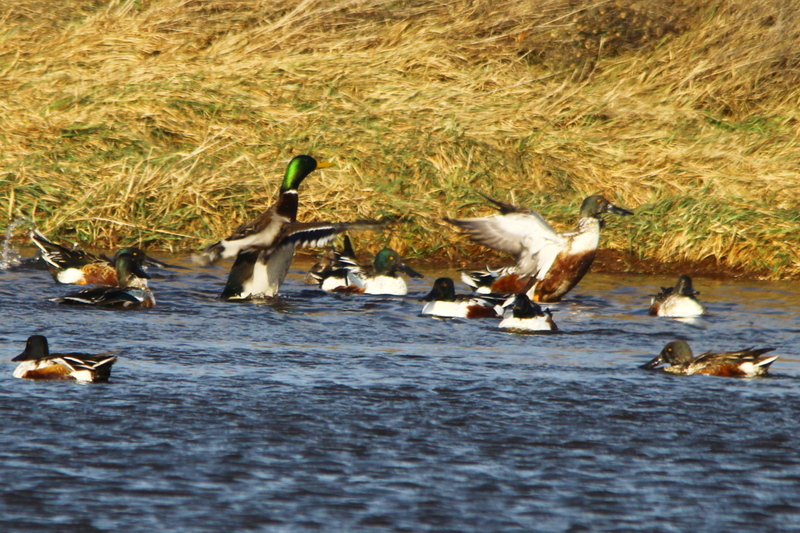 I did manage to get close to a few birds. 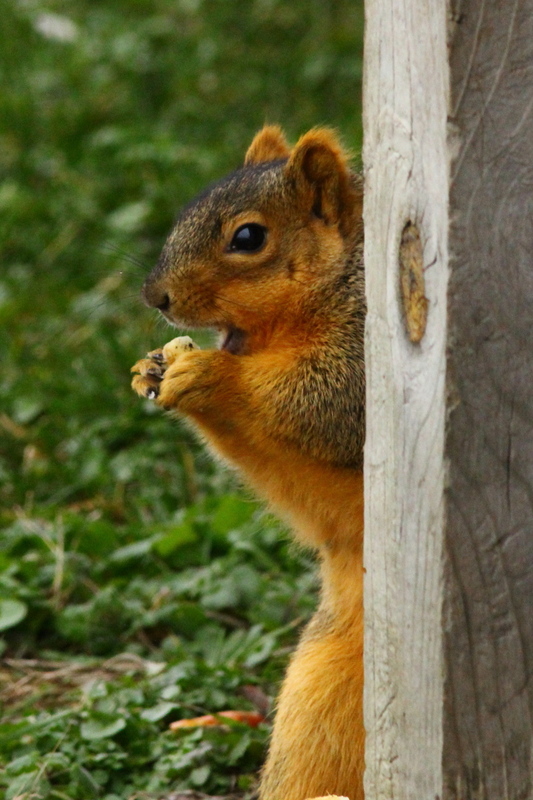 And of course, a few squirrels as well. 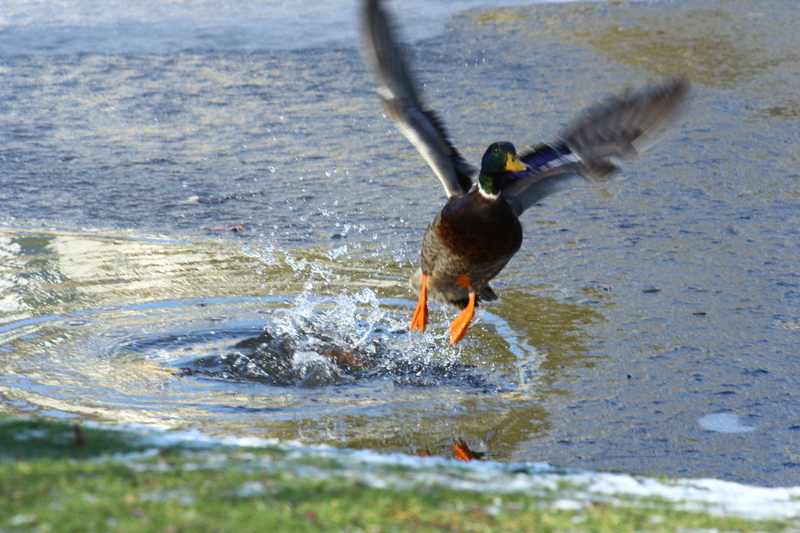 Now then, I still wanted to play with the high-speed burst mode, and since it was a sunny day, I decided to try a few shots of mallards in action, since they are great subjects for practicing on. I did catch one flying, but didn’t do very well catching it in action. I was using the 70-200 mm lens with the 1.4X tele-converter, and that was too slow as far as auto-focusing and shutter speed for any good images. 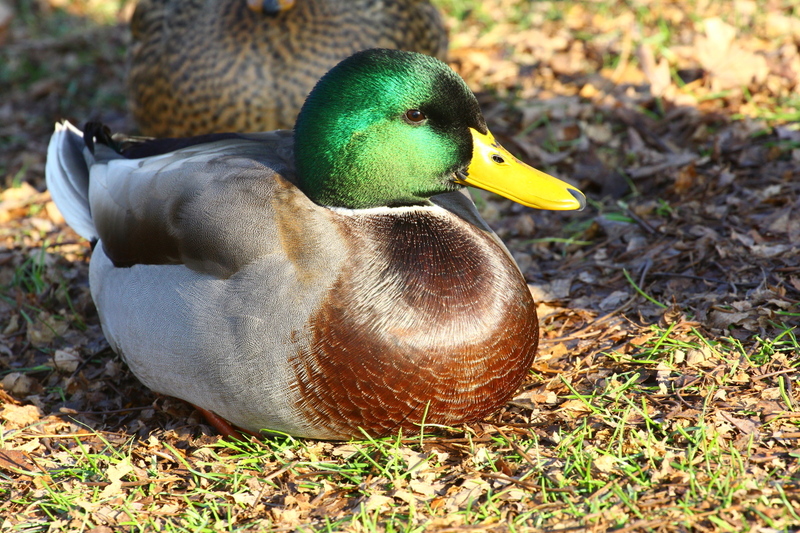 So, since the mallards were just lounging around, I decided to switch gears and try for my best photo ever of a male mallard. 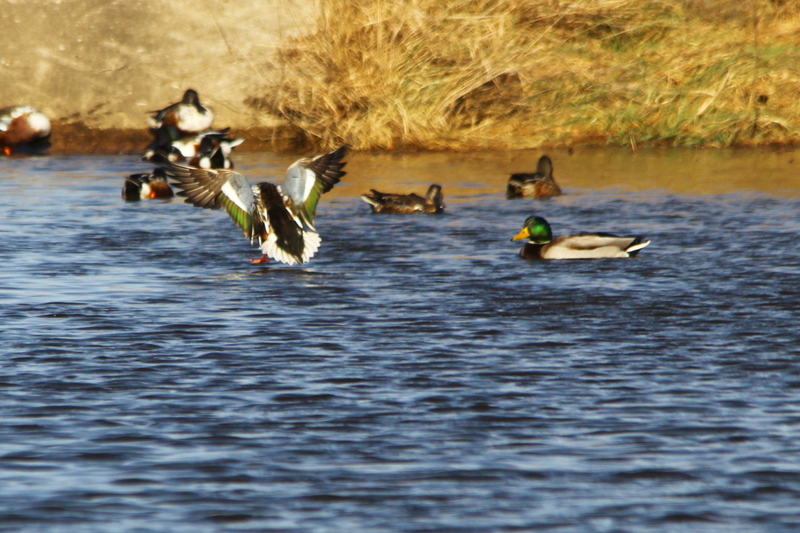 That may sound strange, since I’ve shot hundreds of photos of mallards, but it’s hard to get a perfect photo of them. That’s not bad, I got most of him in focus and exposed correctly, but his chest is out of focus, and his belly is slightly over-exposed. 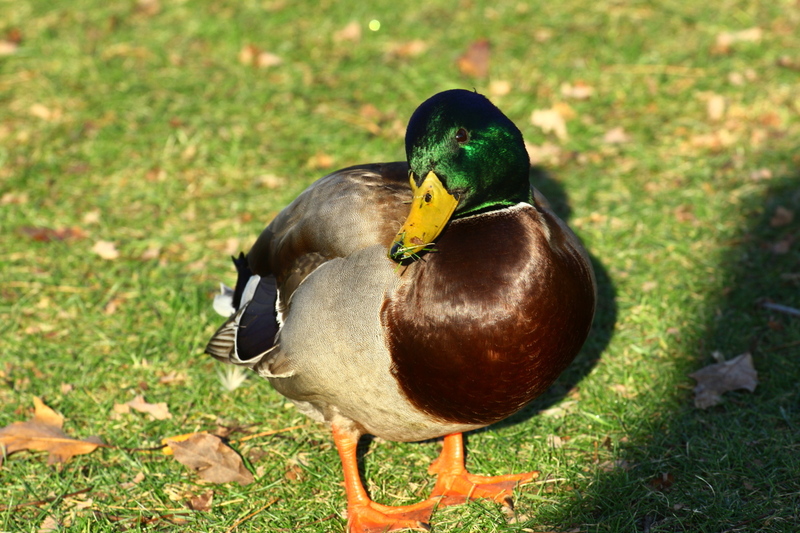 Luckily, mallards love to ham for a camera. 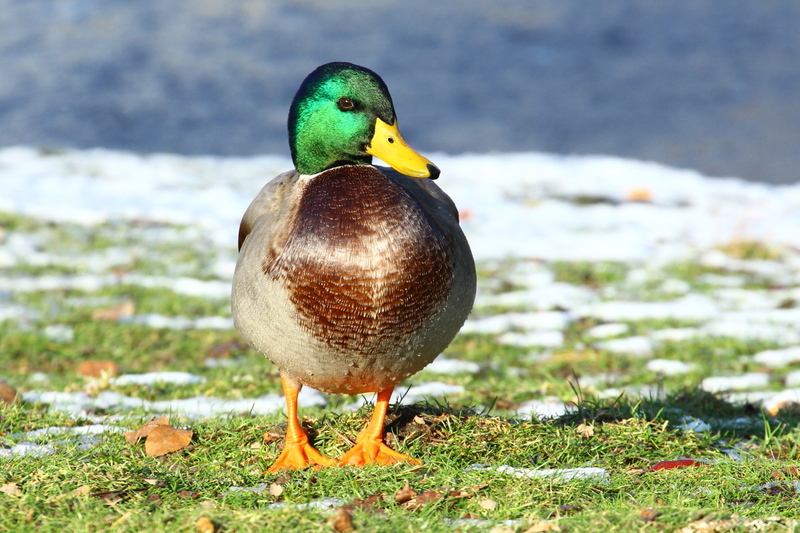 I had forgotten just how hard it was to get a great image of a male mallard! 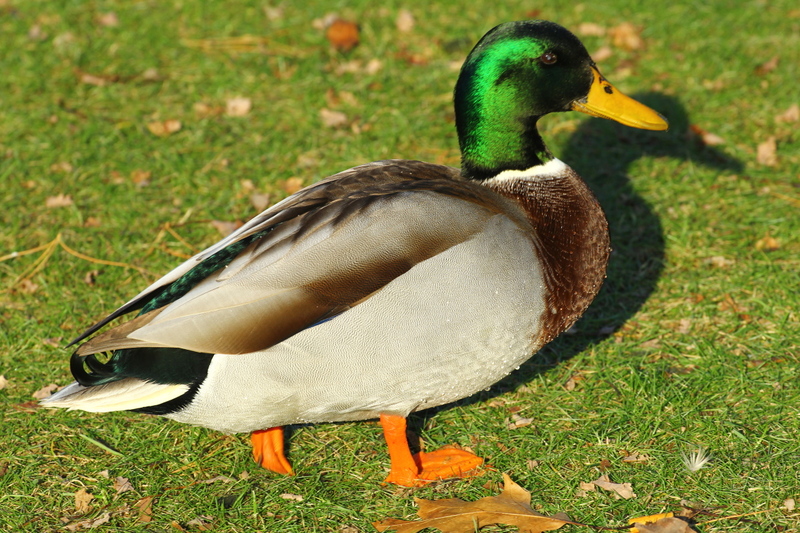 I’ve said it before, and I’ll say it again, if they weren’t so common and tame, mallards would be one of the most sought after species of birds that there is. They’re beautiful, the way that they are colored, but we take them for granted because they are so common. 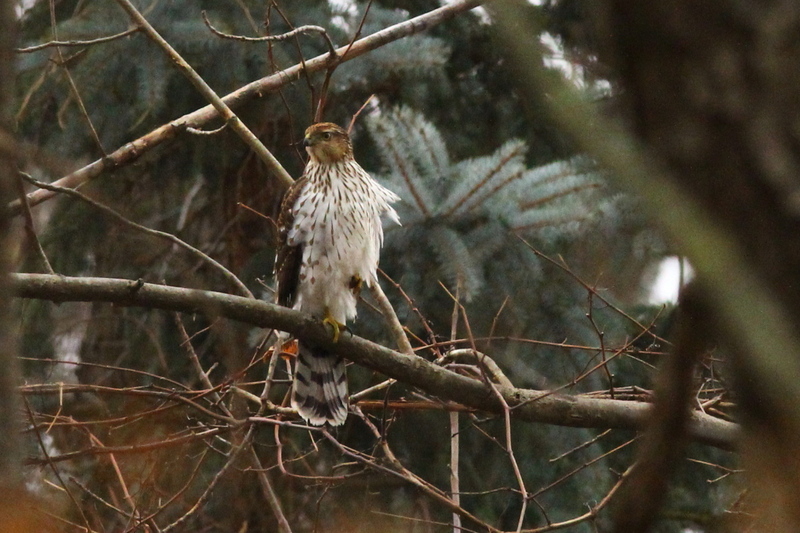 In the last two photos, you can see how they change color as the light strikes them at different angles, and the pattern of the feathers on a male’s back. 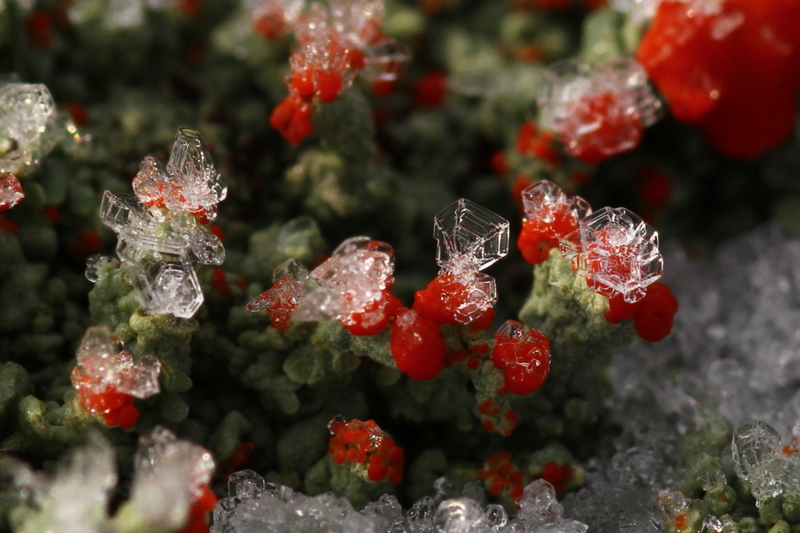 I tried the Tokina macro lens, and no surprise, it got me the best photos of the day. 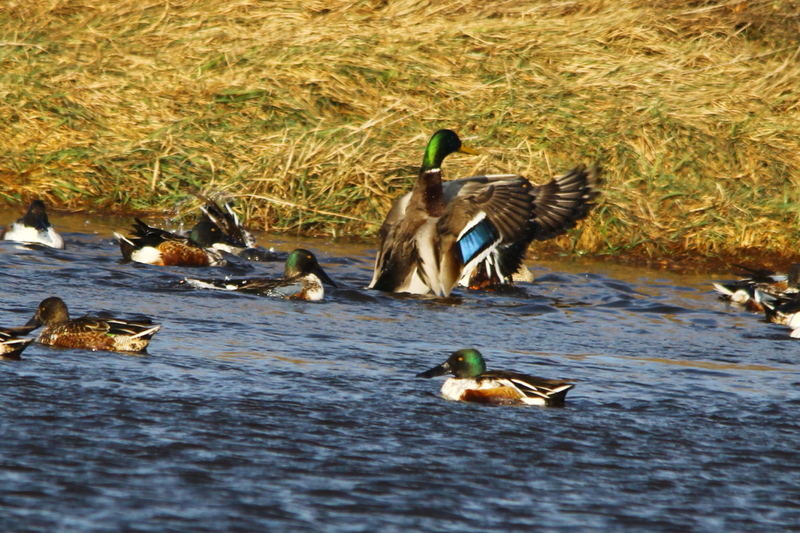 Enough mallards for now, time to switch to ice. 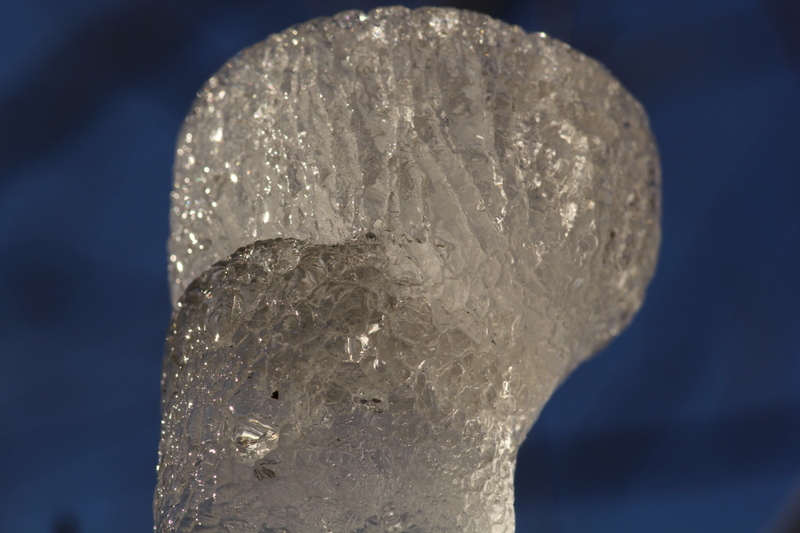 I was actually looking for a bird that I had heard calling, but never found, when I spotted this ice formation created when the water in a metal fence post froze. I shot another from a little farther away. 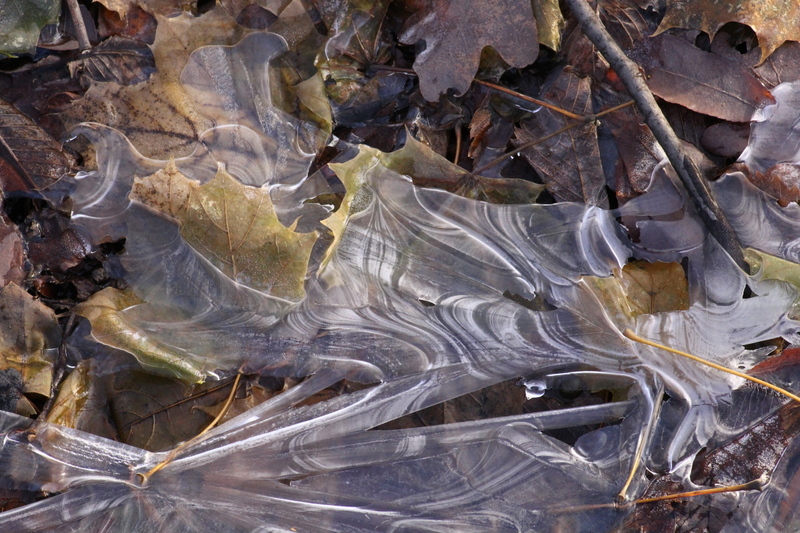 And then, I tried getting as close to the ice as I could. That’s it for the photos, just a few more words to say. 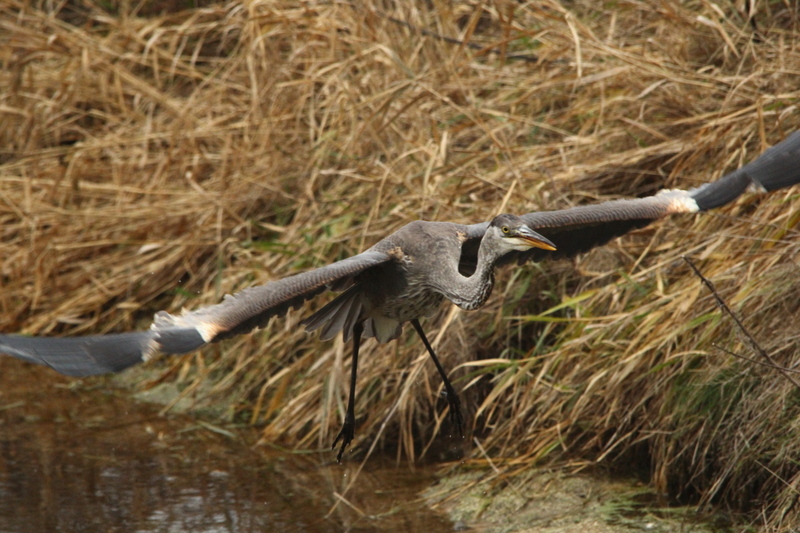 I said earlier that I shot some of my best heron in flight photos at Muskegon, that was even though it was a rainy, foggy day. 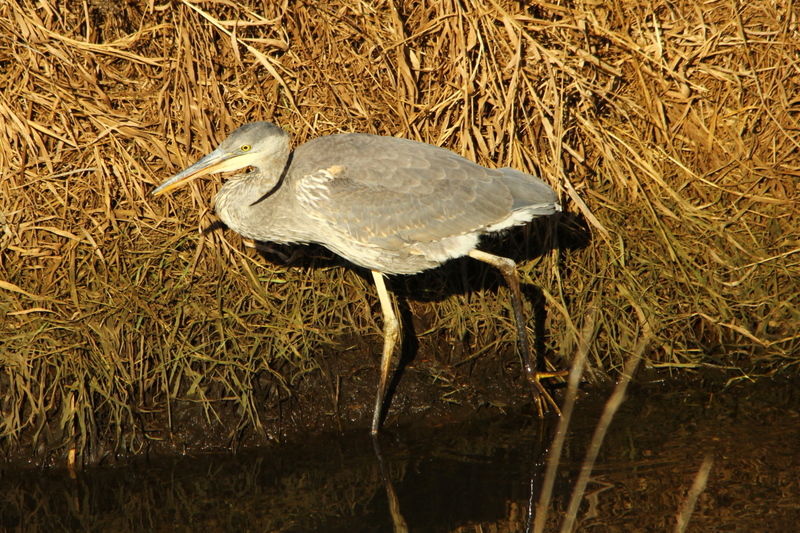 However, the heron was small potatoes compared to this guy! But, you’ll have to wait for my next post to see more photos of him. 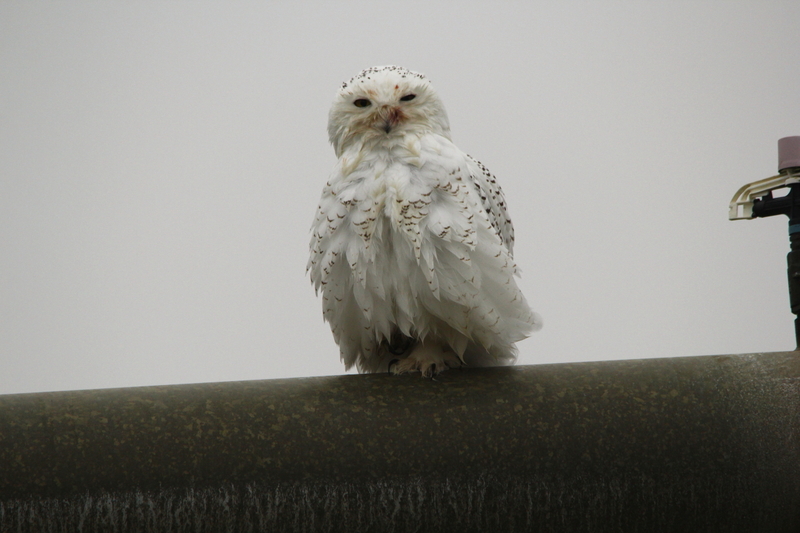 I wonder if he’s a distant relative of Mike the snowy owl that I photographed a couple of years ago? 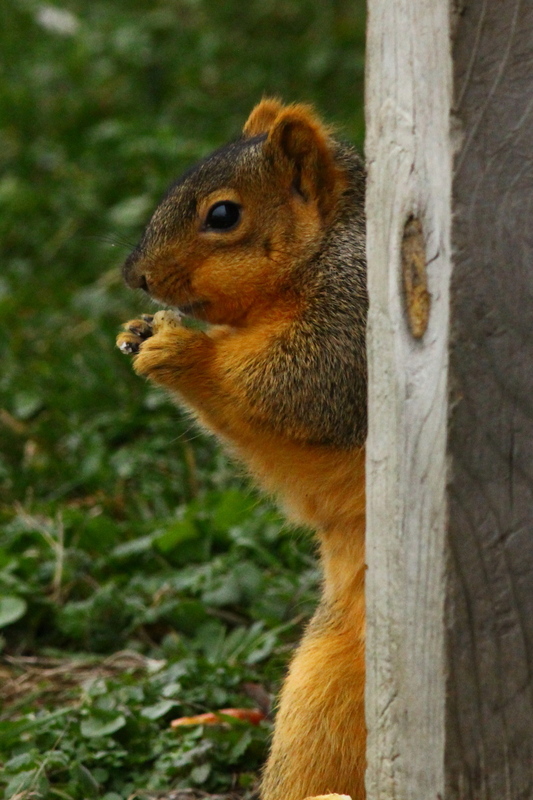 This one sat and posed for me just like Mike did. 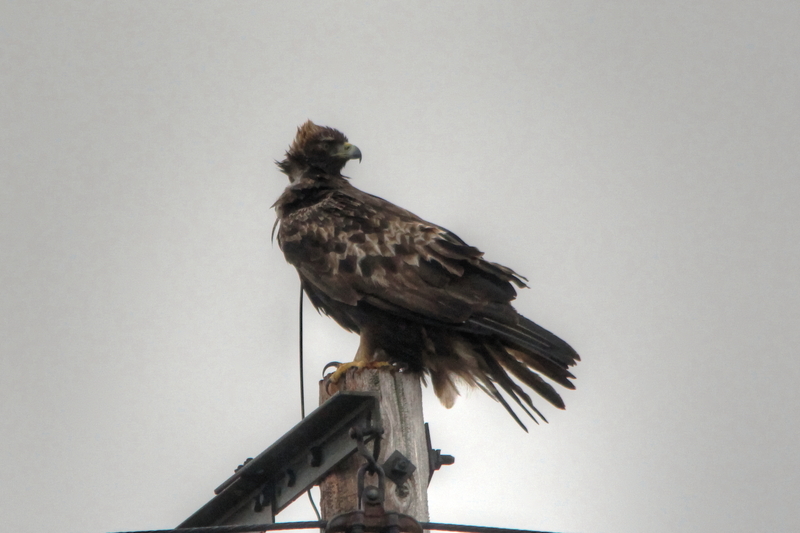 Anyway, not only did I get some good shots of the owl, but also another golden eagle and several of its cousins, bald eagles. 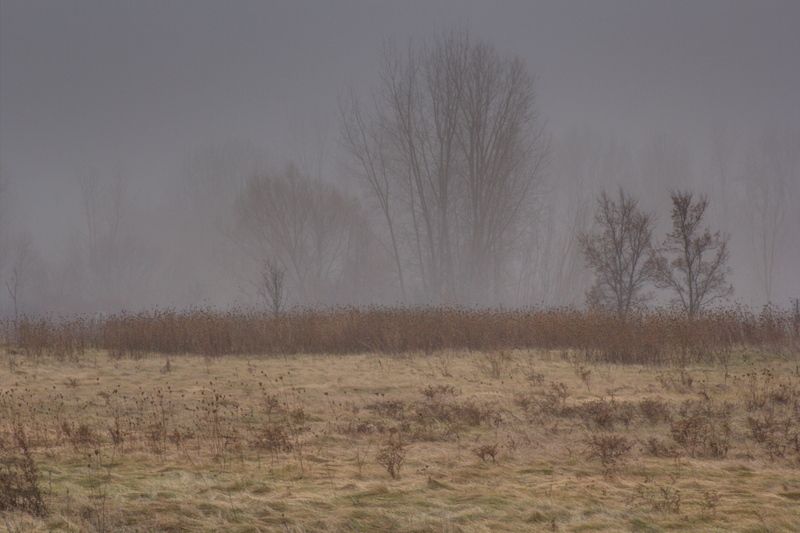 I don’t know when I post the Muskegon trip photos, like I said, it was rainy and foggy that day, so the image quality isn’t the best for some of the images. It’s also supposed to be nice with sunshine this weekend, so I’ll be going back, hoping for better photos. 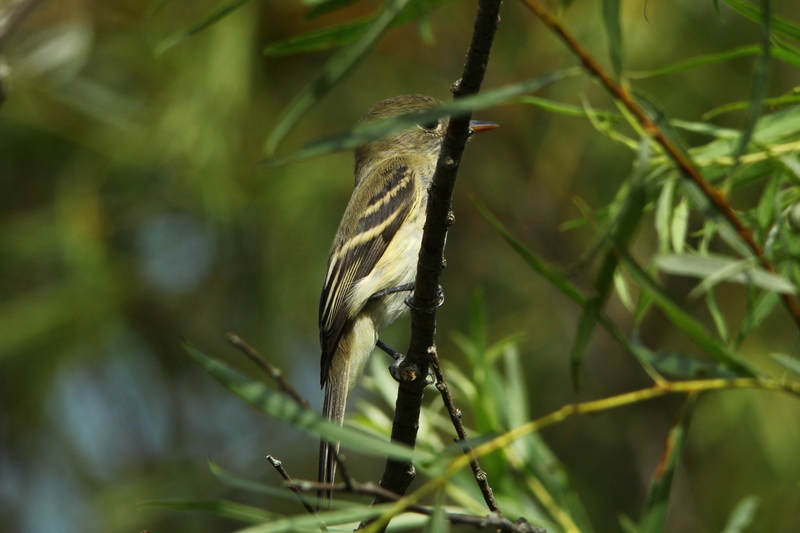 The Acadian flycatcher is a small insect-eating bird of the tyrant flycatcher family. 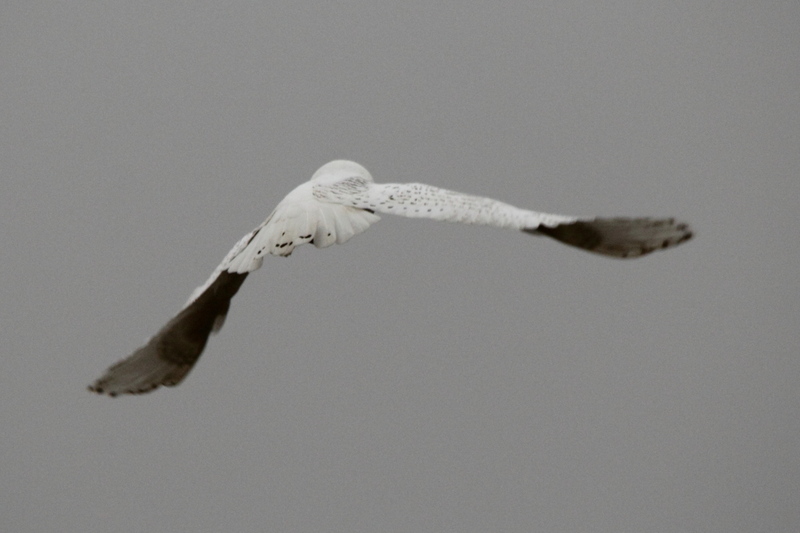 Adults have olive upper parts, darker on the wings and tail, with whitish underparts; they have a white eye ring, white wing bars and a wide bill. The breast is washed with olive. The upper part of the bill is dark; the lower part is yellowish. This bird’s song is an explosive peet-sa. The call is a soft peet. They also have a call similar to that of the northern flicker. 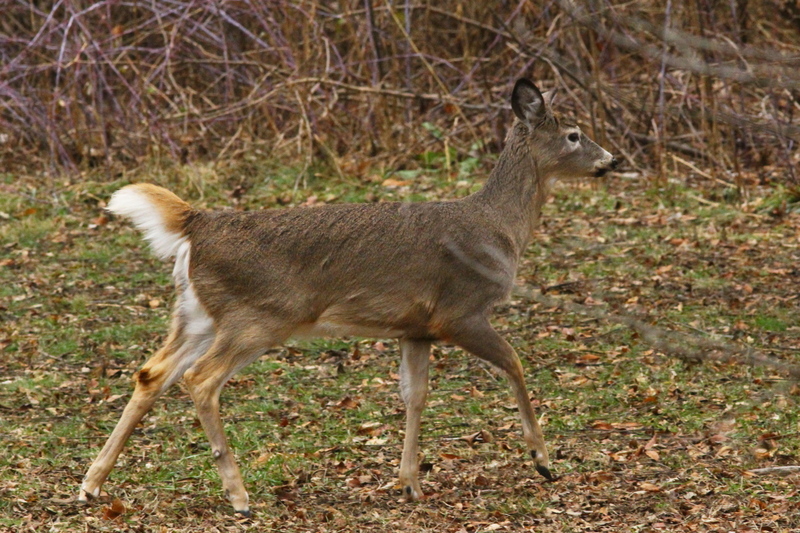 Its breeding habitat is deciduous forests, often near water, across the eastern United States and southwestern Ontario. 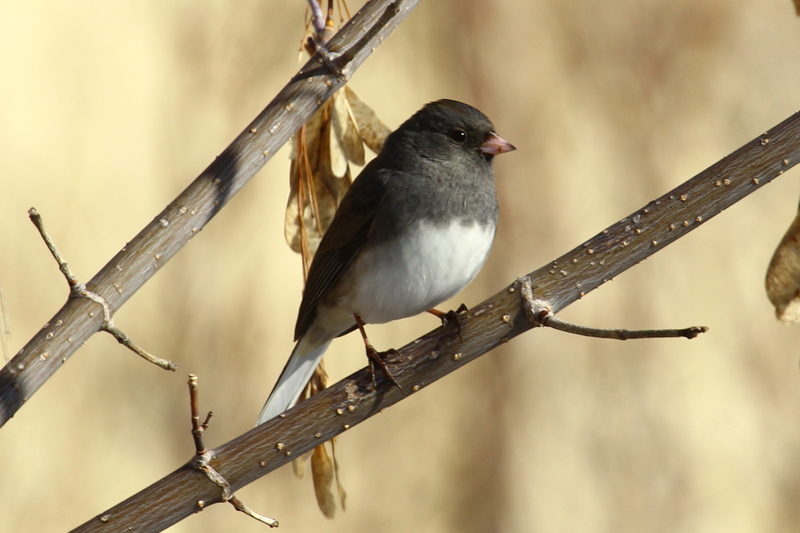 These birds migrate through eastern Mexico and the Caribbean to southern Central America and the very northwest of South America in Colombia, western Venezuela, and Ecuador. 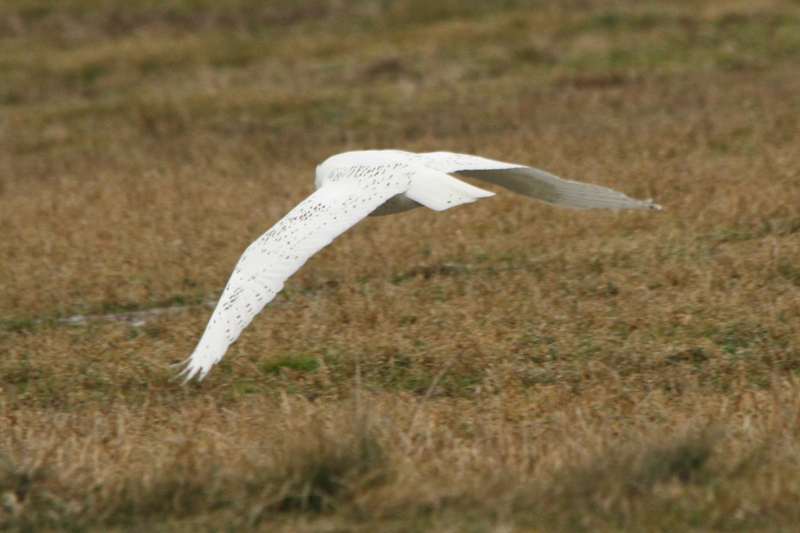 The numbers of these birds have declined somewhat in the southern parts of their range. Brown-headed cowbirds lay eggs in the nests of these birds in some areas. However only 16% of cowbird young in Acadian flycatcher nests fledge successfully. They wait on a perch in the middle of a tree and fly out to catch insects in flight, also sometimes picking insects from foliage while hovering. They may eat some berries and seeds. 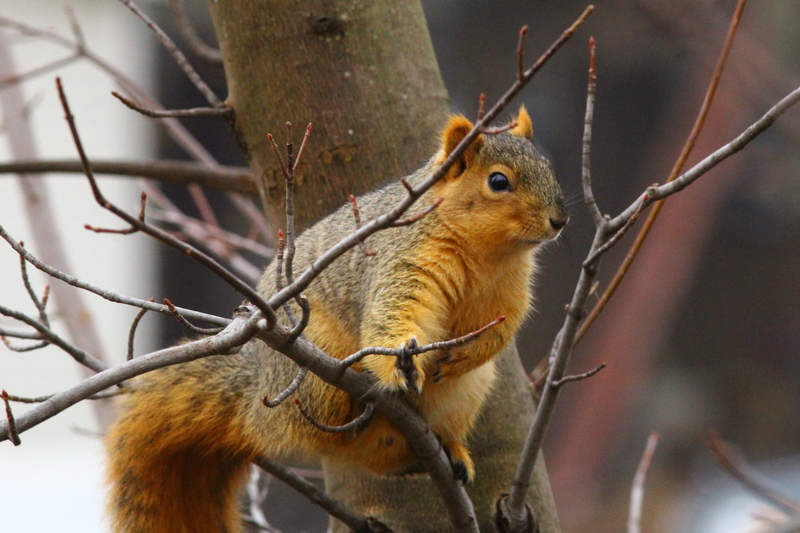 They make a loose cup nest in a horizontal fork in a tree or shrub. 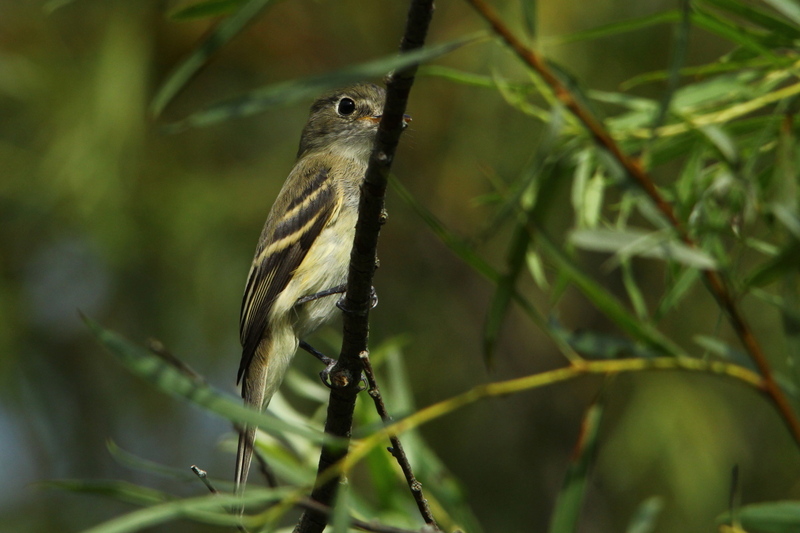 The Acadian flycatcher is an excellent flier; it is extremely maneuverable, can hover, and can even fly backward. 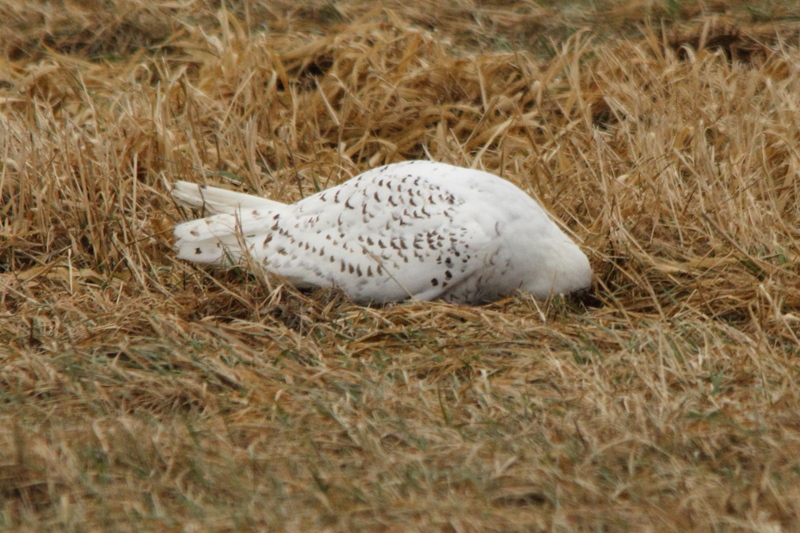 Curiously, there is no scientific information on hopping or walking by this bird. This is number 168 in my photo life list, only 182 to go!